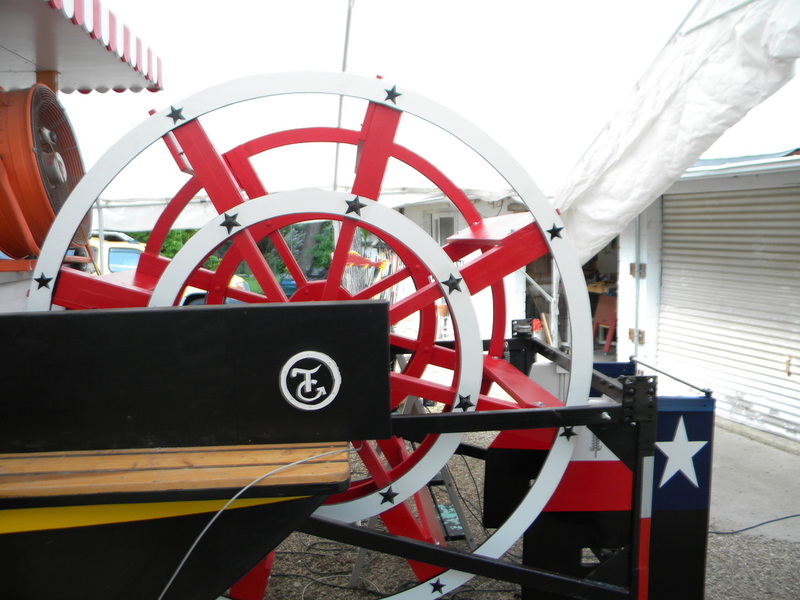 I am presently building my third paddle wheel boat. I started this site to chronicle the builds, so I would have a quick way to refence my past projects. I hope you follow along and please write if you have any questions, or (and I do mean it) any suggestions. 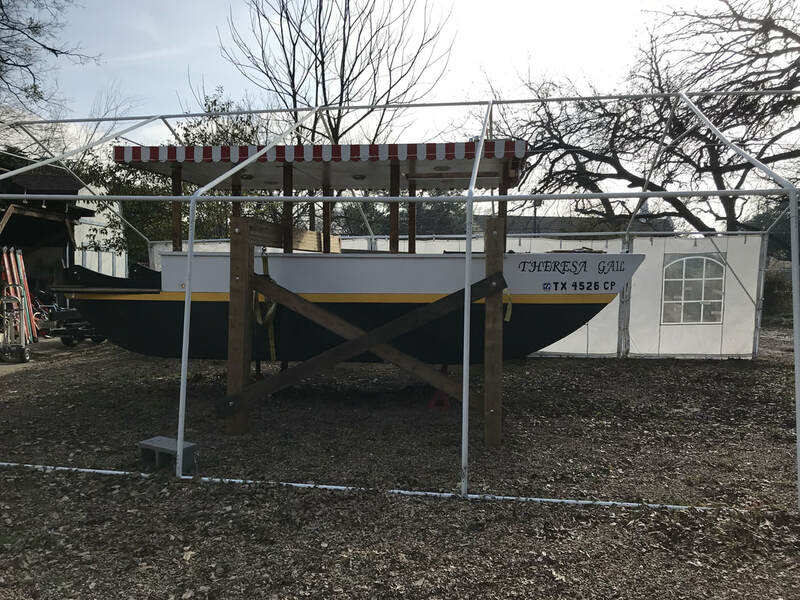 The first boat never survived the winter, so the only time it was afloat was when it was a float in the Christmas parade. 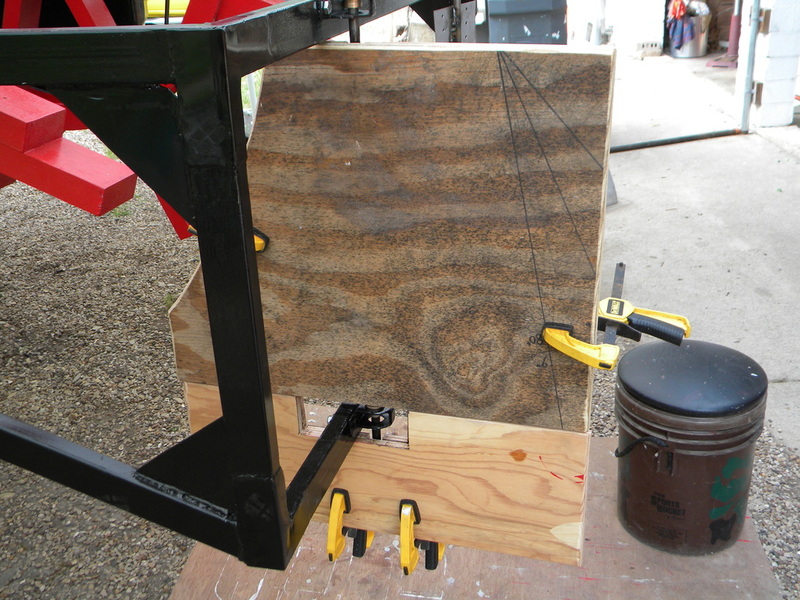 This was the project where I learned how to seal plywood properly. The second boat's hull was too shallow, for the deck was only about 2" above the waterline. It never had any speed and the steering was poor. 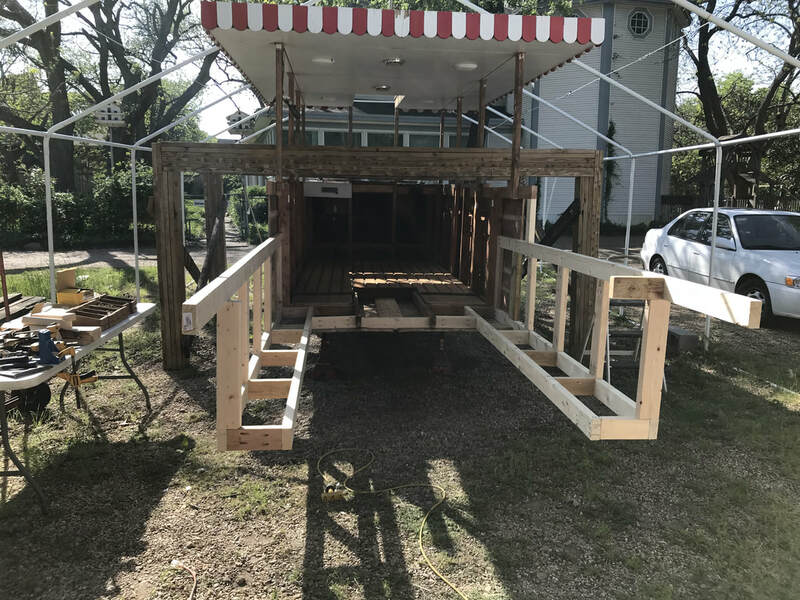 It used to have a second deck where the pilot house used to be, but boy was it top heavy. Third boat floats great , and now tackling the steering and power problems with new rudder configuration and more powerful motor. 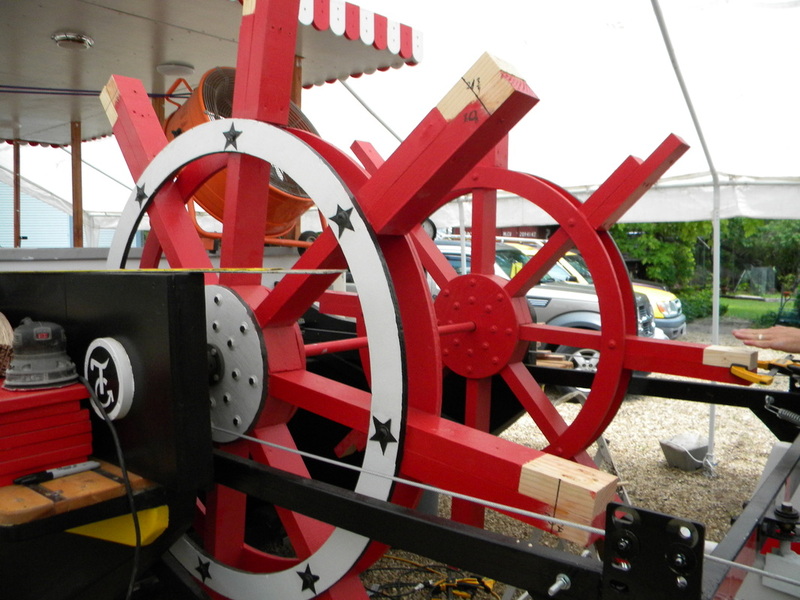 The reason I chose for the third build an open cabin, was the wind would push it more than the paddle wheel ever did. 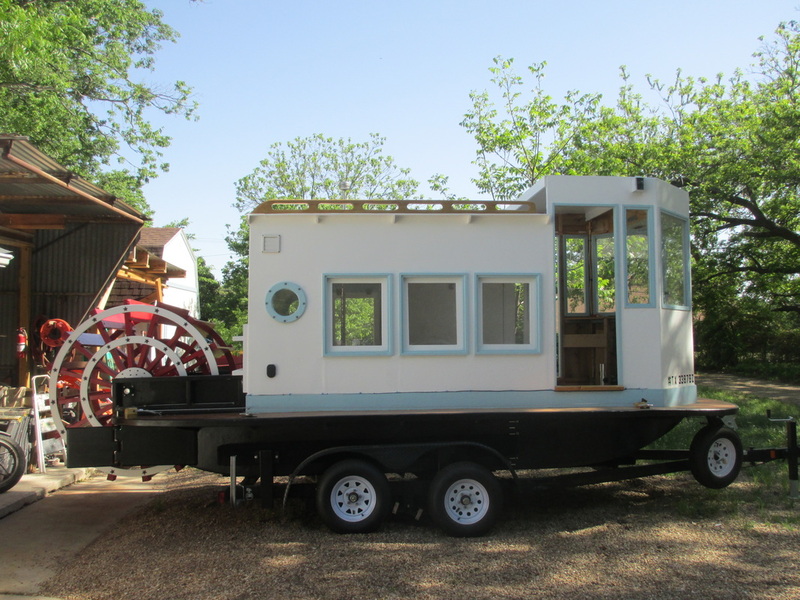 But maybe if with the new motor I have more control of the boat, I may go back to a closed cabin. If YOU have questions or comments, feel free to send them in. 3/28/2019 I have had a lot of requests for those motorcycle rockers. Soon as I finish these last 5, I hope to get back to organizing the garage and then to the boat. 2/12/2019 I have to laugh. I just got a subscriber to my newsletter. Trouble is, I did not even know I had one. Not sure when that option was added to the page. Will remove it, until I begin one. 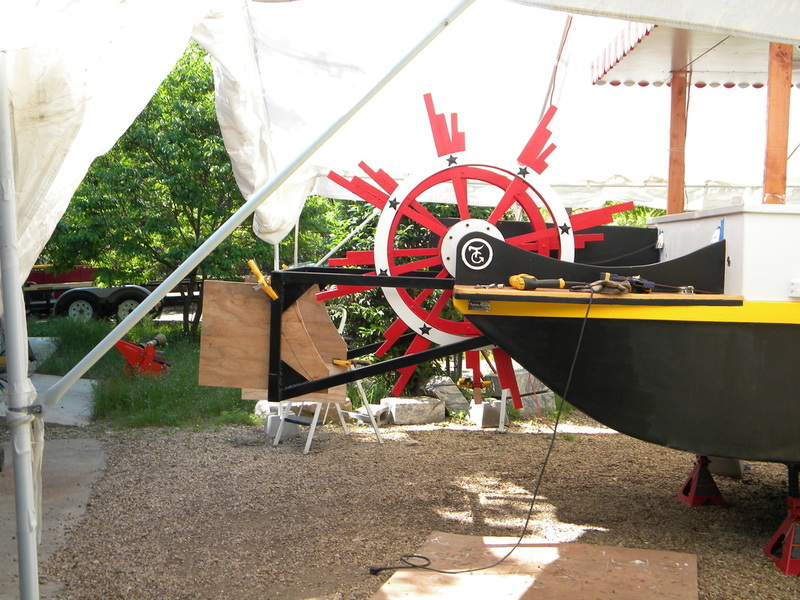 I am just waiting for fairer weather to begin working on my boat again. I no longer have a tent covering my boat. 1/28/2019 Happy New Year! Still trying to get garage organised. First step, set up a paint closet, then build a good work bench. 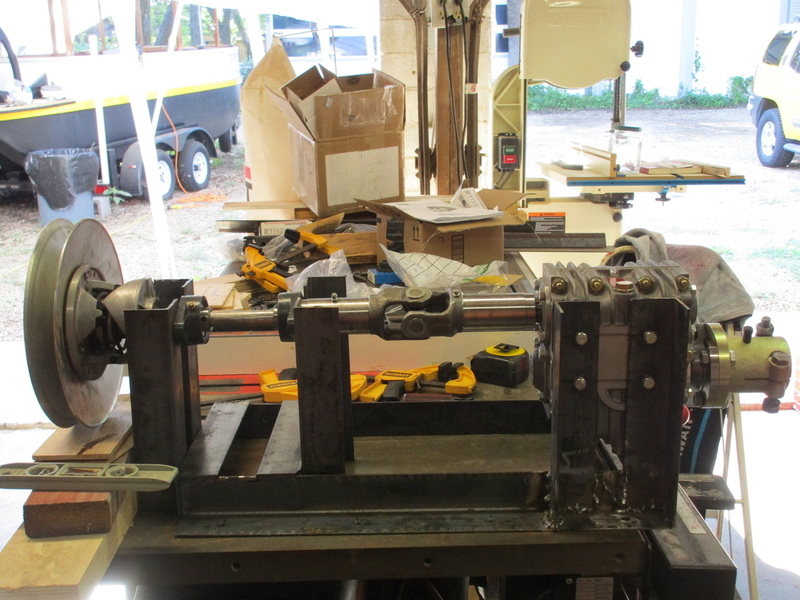 I was able to install my router onto my table saw, this should give me more room and now I am able to get to the router much easier. 12/16/2018 Just finished a project gift for my employee's kids. Got plans from Wood magazine Issue 258. 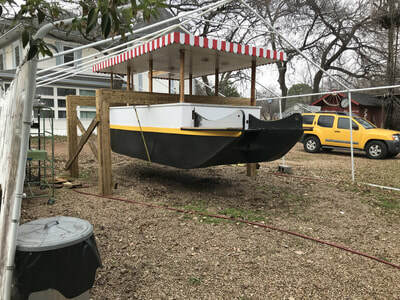 A fellow steamboater sent me a photo of her boat. 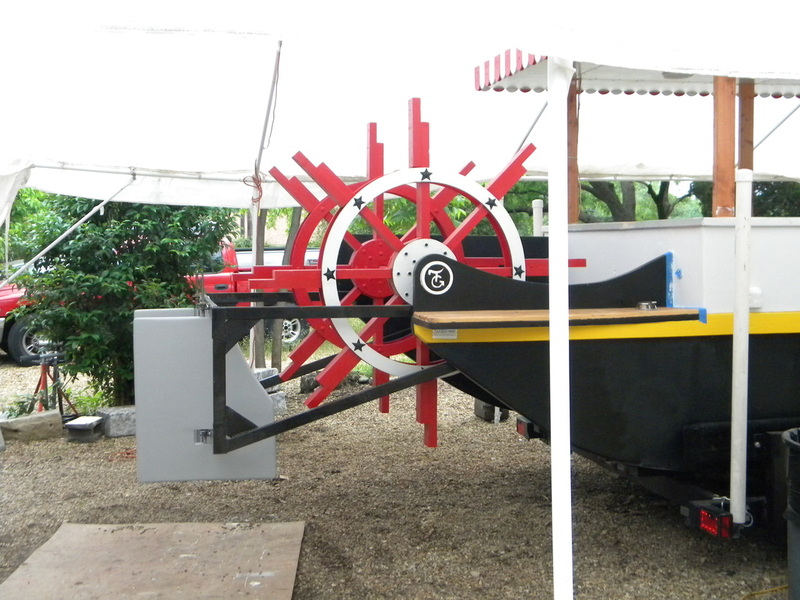 Stern paddlewheel, chain driven, and twice the size of mine. Thinking hard now, so much trouble to get parts to use drive shaft, might rethink using chain again. Just use larger links. 11/4/2018 Writing to let yall know, I have not abandoned the project. My son is getting married early next year, so had to finish a lot of jabs at home. Finished last one, but have lost Terry to a higher paying job. 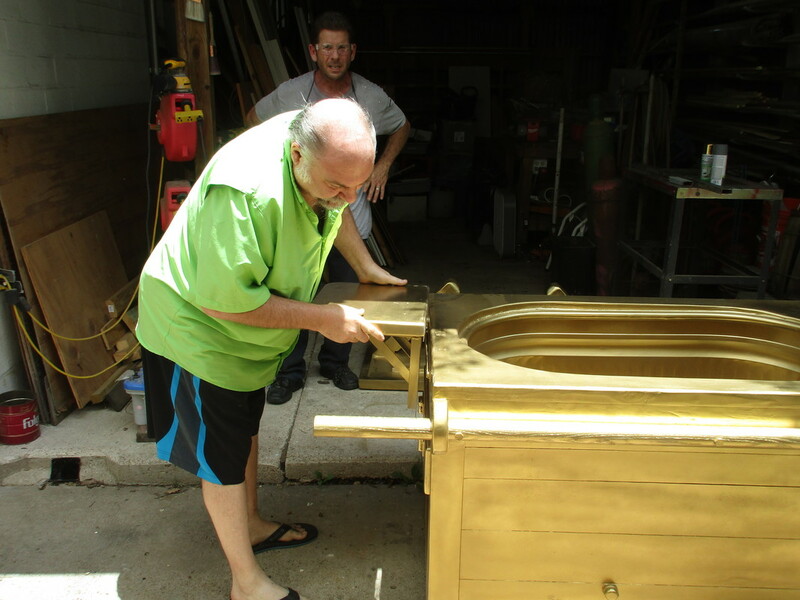 I am teaching his son, and at the mean time trying to find where things are in my own garage. Finally decided to clean out the garage and reorganize my shop. That way I know where things are and I can move around in a more smoother flow in the shop. 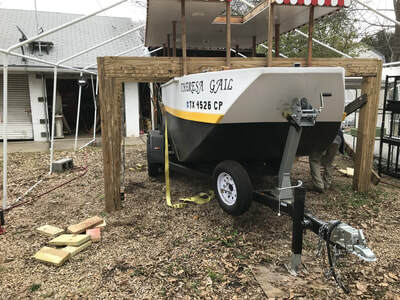 Going to also build a carport to cover the boat instead of the tent. Now that might be put off for a bit. 9/18/18 While getting a massage, my mind was upon my boat. 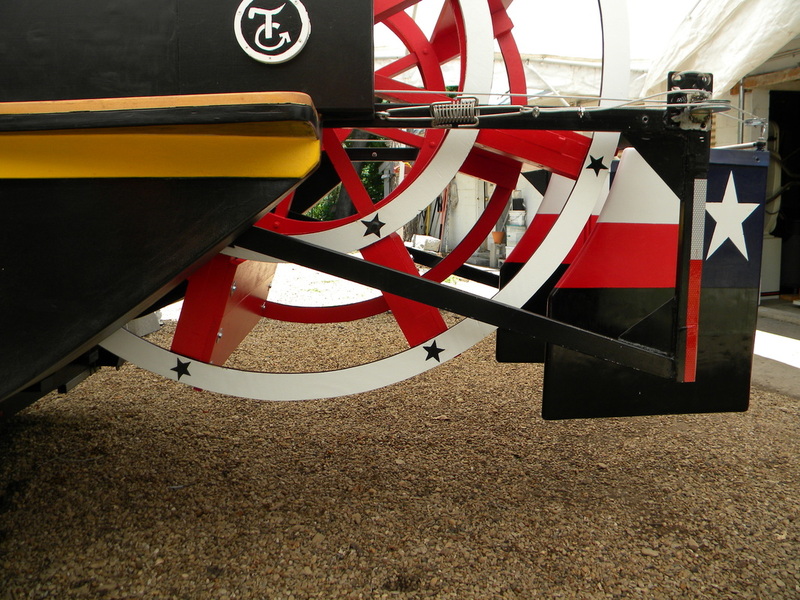 I had a horrible vision of the forward set of rudders, not having any hydraulic pressure on them, since the pressure had been shifted to the aft rudder, turning under the pressure of water as the boat speed forward and closing as louvers in a vent, therefore stopping water from flowing under the boat and reaching the paddle wheel. Also they would act as a break if they had not broken off already. Since I would only need them to turn sharply while going in reverse, a move I really do not see me needed, if at all, I will not install them. 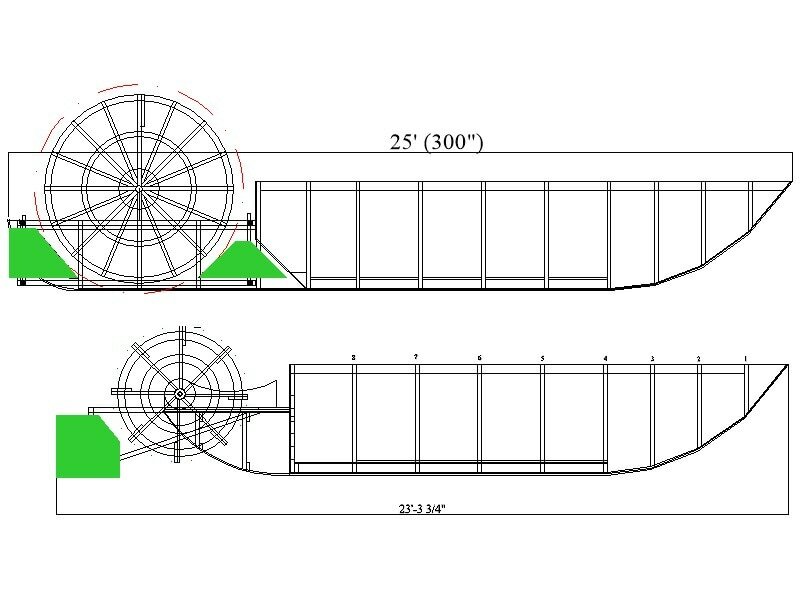 So I can either redesign the boat shorter, or.......increase the paddle wheel size. 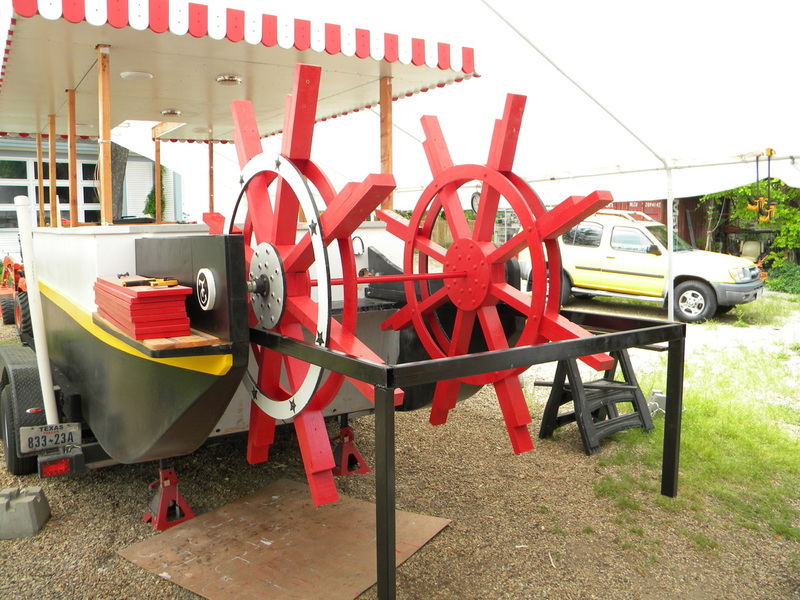 I do not want the wheel to go below the draft of the boat, nor do I want the wheel to be above the boat's canopy. This will ensure nothing grabs the wheel from below, nor catch anything above. So I will get back to the Auto Cad and start tweaking the drawings. Great News! 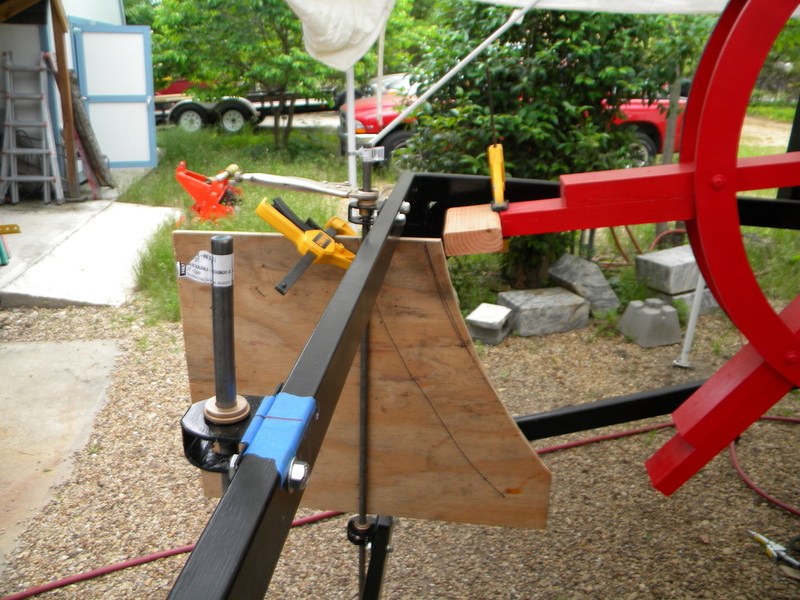 I was able to remove the forward rudder and shift the angle of the aft end to be able to support a 7 foot wheel. 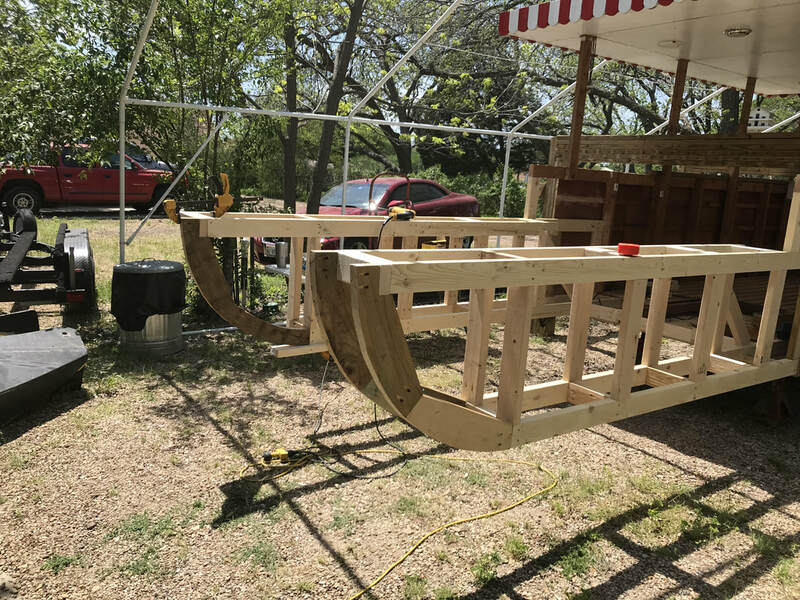 The paddle hub will almost be even with the gunwale. 9/18/18 New shaft arrived, so I was able to take measurements of the end. Now I want to try to place 90 degree bends in the main drive shaft. Going to experiment to see least expensive way. First trial is using Y yoke ends. Going to try using tractor PTO yoke joints. 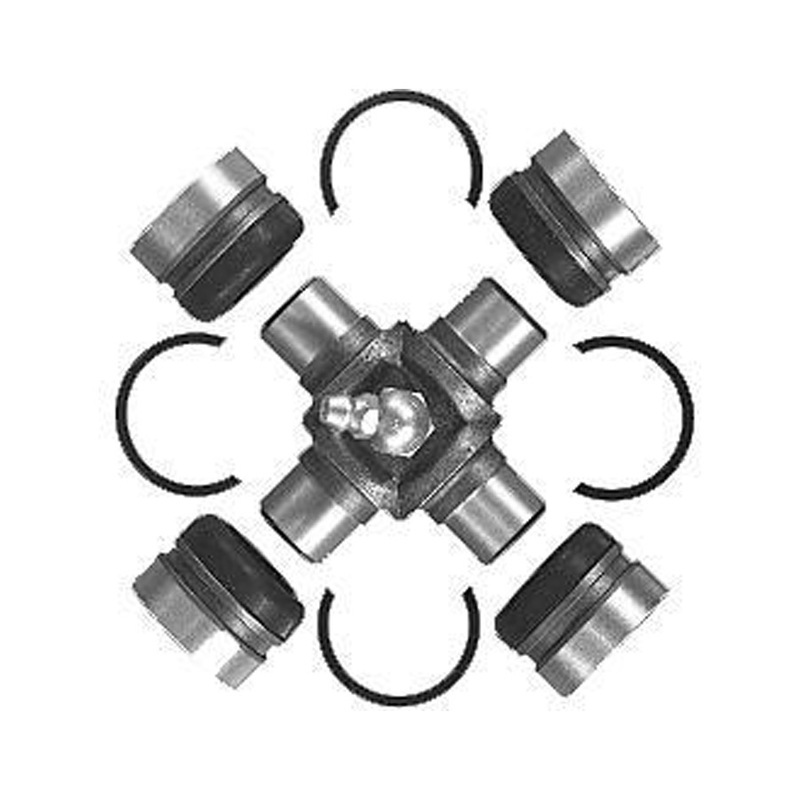 Could not find one that used the 30 spline connection, so will try just slipping one one and bolting it on. 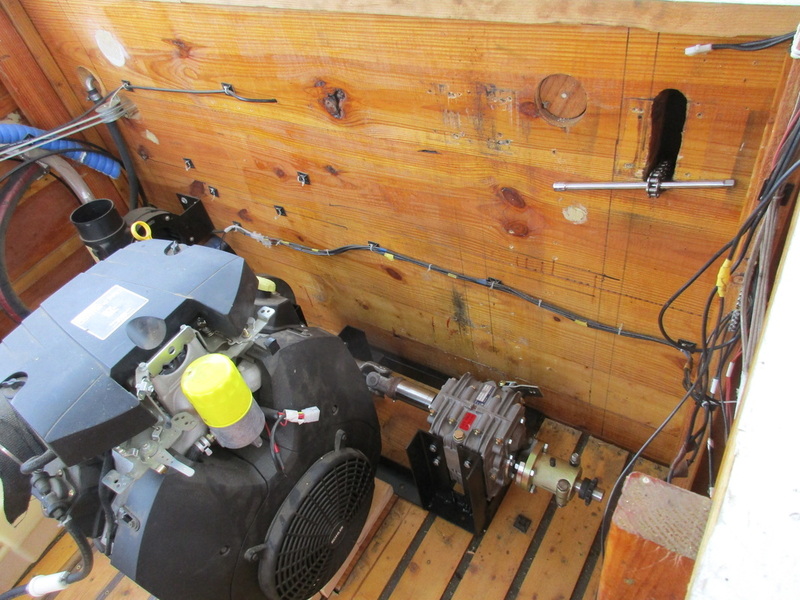 Also have been figuring out a way to mount the motor to the boat. 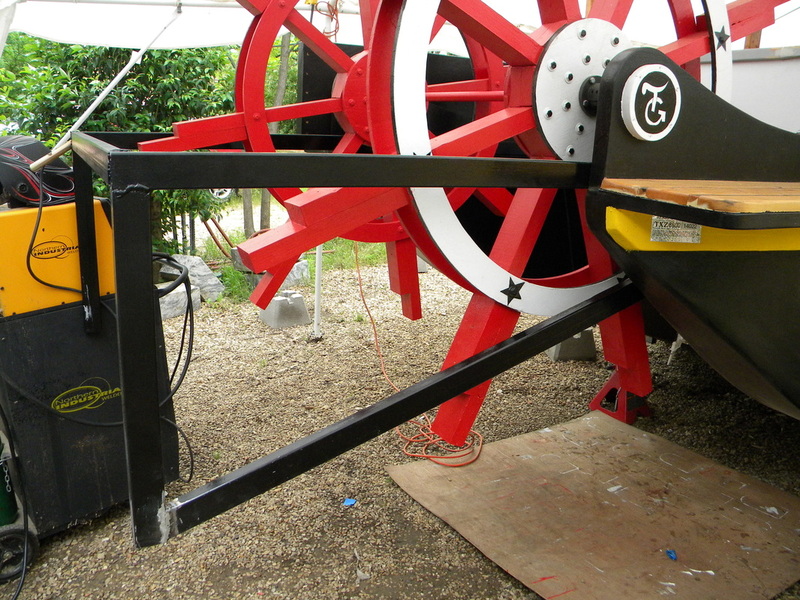 I like to raise the motor about 6 inches so I can get my arm under it if I have to. Make changing out the oil a lot easier. I have a good idea on how to mount the engine, but since I do not know for sure how I will achieve the 90 degree bend and its dimensions, I can not make a permanent mounting. 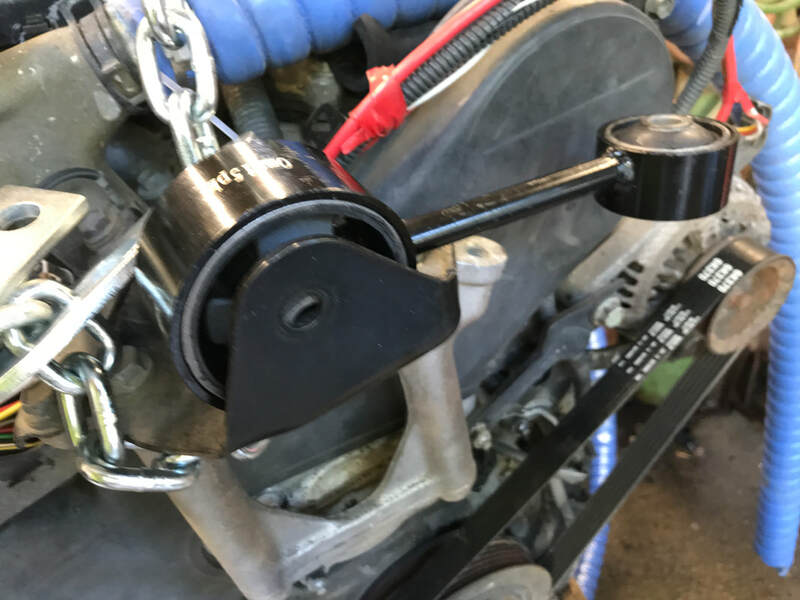 I found a new mounting kit on-line for the engine and will replace the old and use them. So the engine will have three main mounts and maybe two shock torque mounts. I also am looking on how to support the 90 degree bend, but once again till I know for sure how it will be done, I can not plan too far ahead on how to support it. I am learning about captions for pictures, which I wish I had done long before, since there are several photos, I look at now and wonder what I am looking at and why I took them. Here is the Driver side Mount. It is the only one that supports this end. 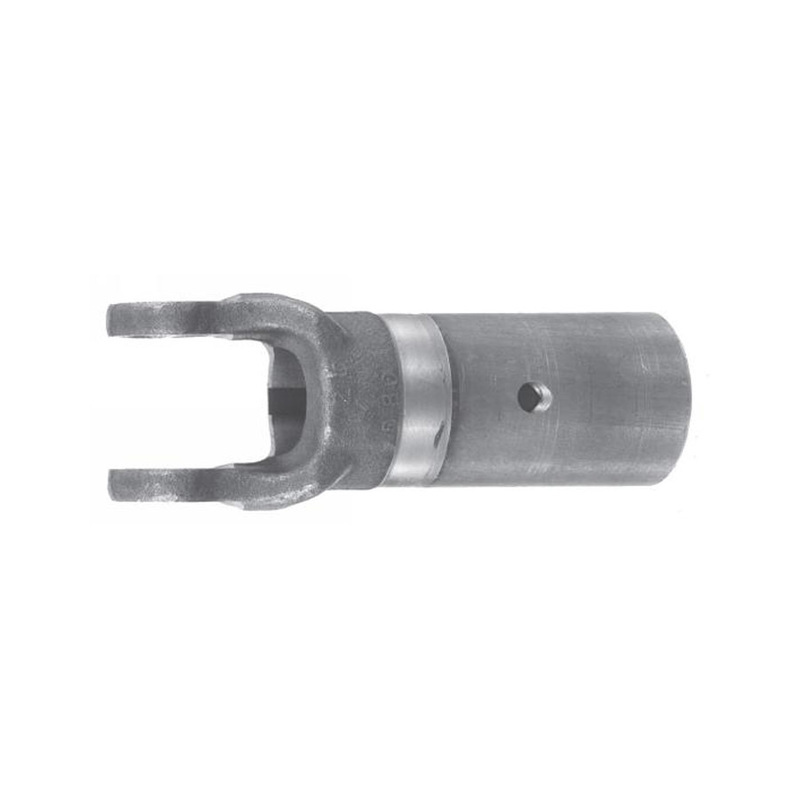 Here is the troublesome mount that supports both the center bearing and the aft-passenger side engine mount. It still has the outer ring of the engine mount still rusted in place. New driver side mount. It appears to it will be an easy replacement and easy to make a mount attachment for. 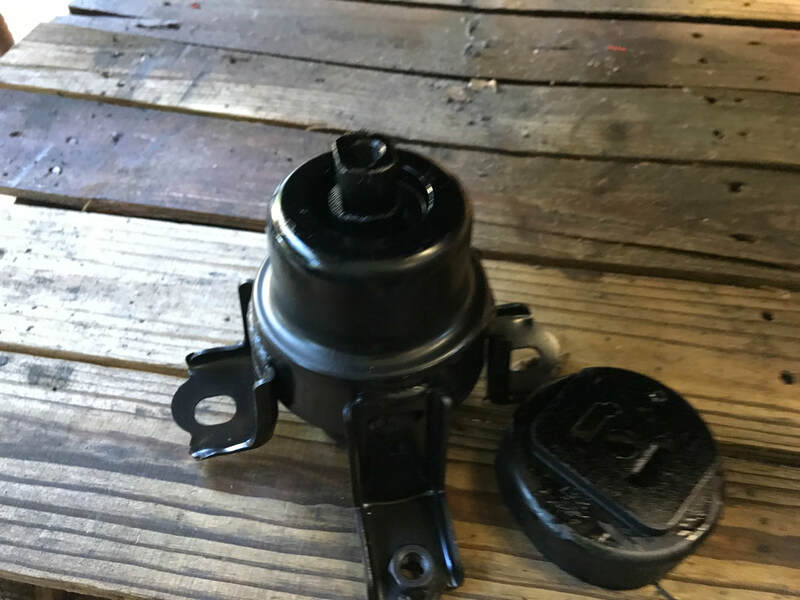 Here is the new engine mount, but again the troublesome mount still has part of the old engine mount rusted in it. I will try to grind out the wedged in part but think I will have to just replace the part instead. 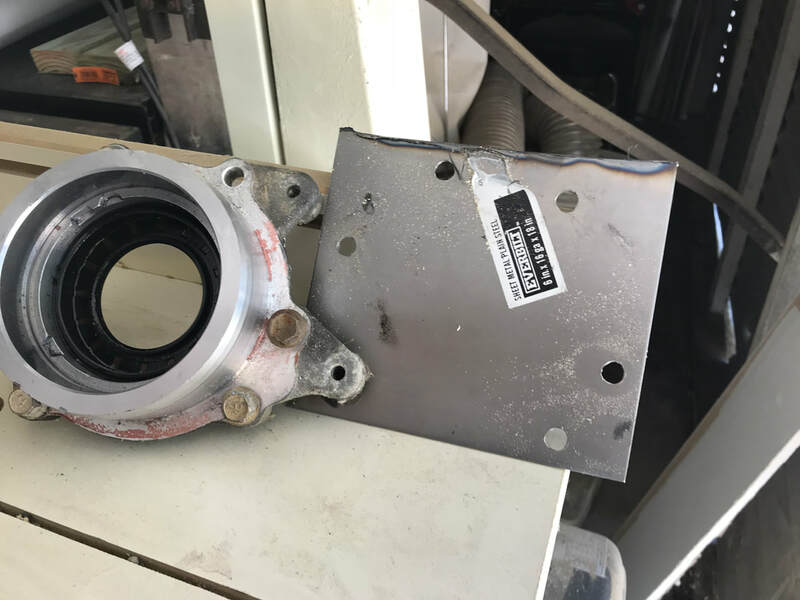 The forward passenger side engine mounting bracket. The passenger side is held up by two mounts. There is a shock absorber which I think allows a little motion due to torque. 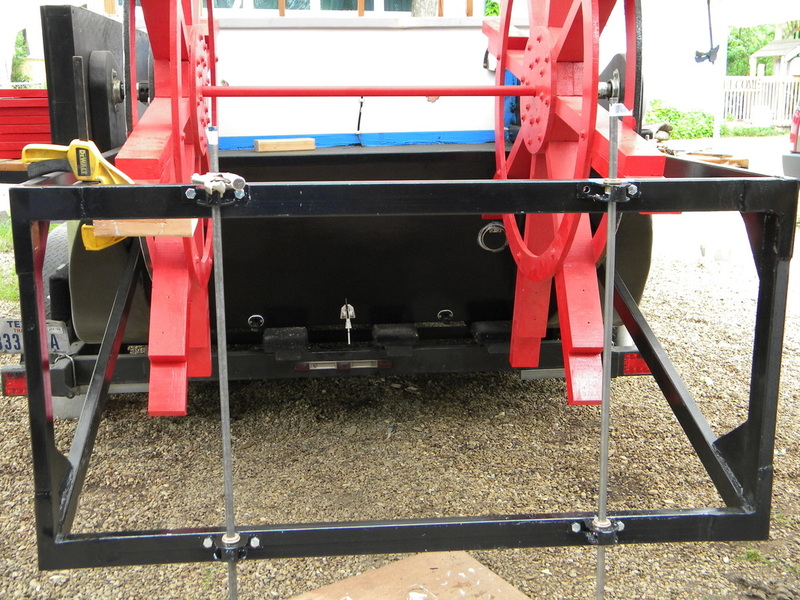 Picture of new mount with Rubber engine mount already installed. 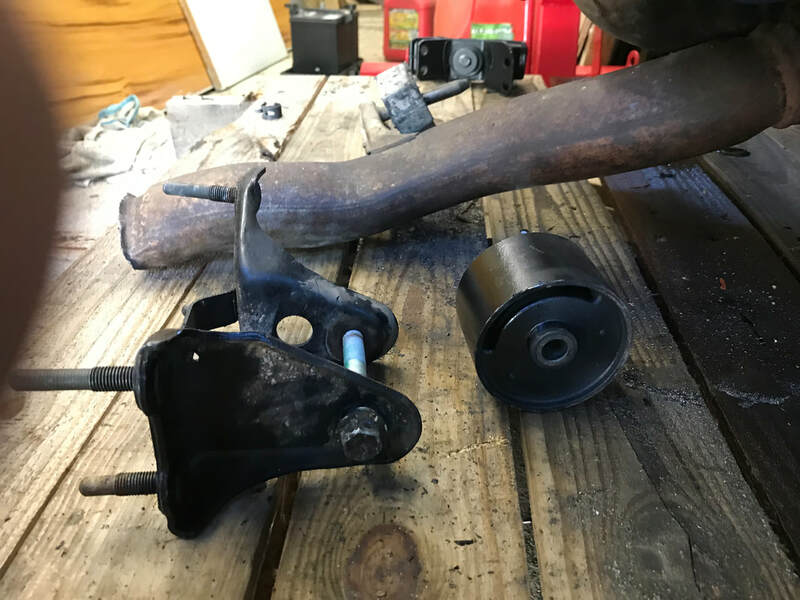 Here is the new engine mount, and now I just have to figure out how to use it. Now this mount or torque absorber, I really not sure how I can use. 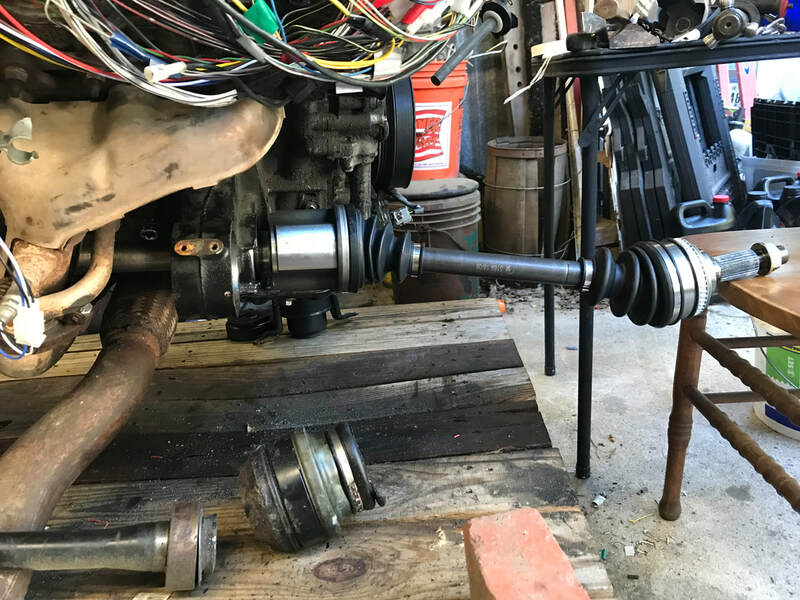 9/10/18 Have studied the drawings and decided to replace the current drive shaft that is still attached to the transmission. I attempted to remove the broken connection, but proved unfruitful. Then I attempted to remove the shaft, which should be simple, since the retaining clip had already been removed, but again could not pull it out. Hammering, chiseling, using rust remover, but nothing worked. Finally attempted to detach the shaft along with the mounting bracket, but unfortunately one bolt is hiding behind the shaft and could not be reached. I finally resorted to using the saws-all and cut the shaft to reveal the bolt. Once bolt was removed the shaft easily came out. 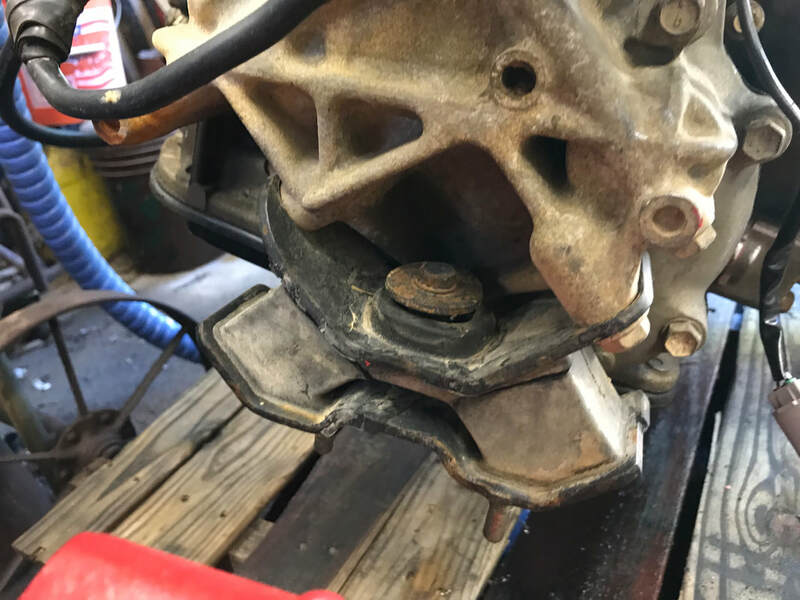 The center bearing had rusted onto the mounting bracket. 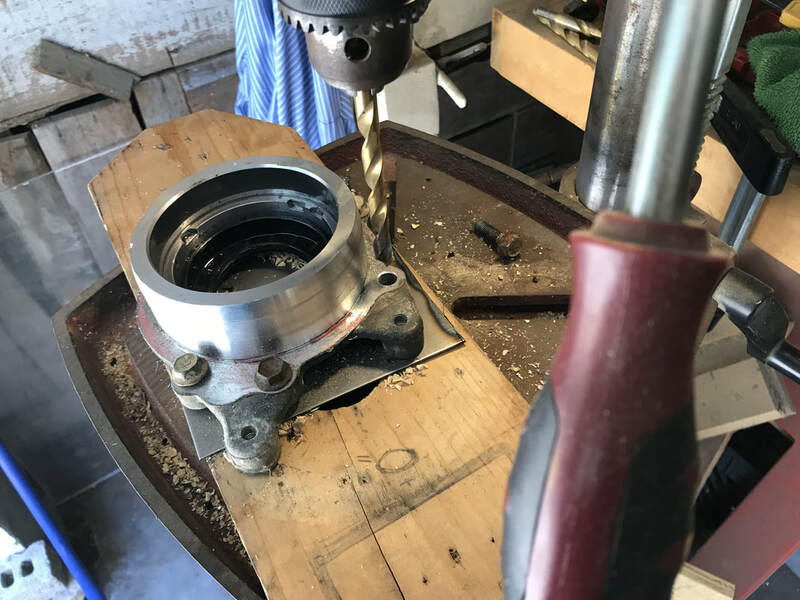 Now I am waiting for the new shaft to arrive, then once I know the dimensions of the splined end, I can begin getting the parts I need to extend the shaft along the pontoon and upto the paddle wheel axle. I wish I had taken pictures, but was to frustrated at the time. Here is the shaft after I had to cut off the end, so I could reach the mounting bolts. Here is the new shaft along with the old. You can see how much was missing. 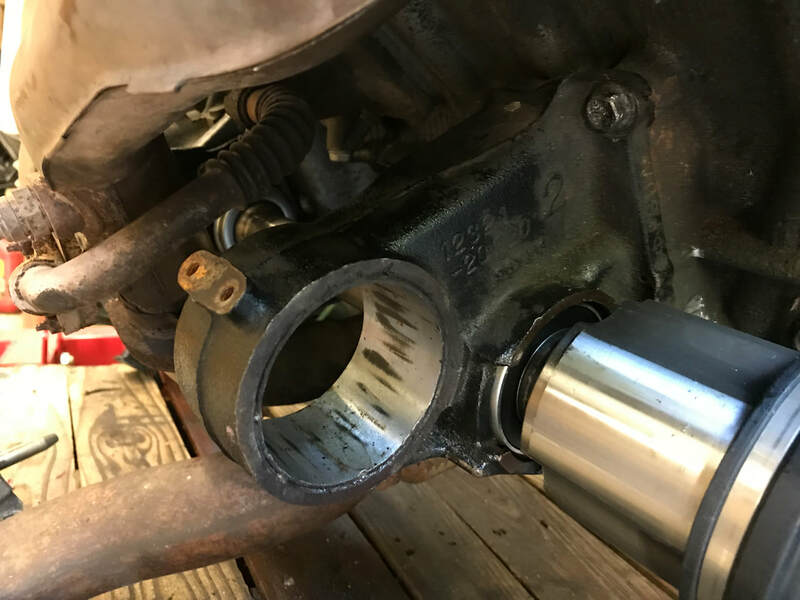 8/31/2018 Going to fix hole left by missing drive shaft. Easiest will be to remove the plate that holds the gasket and replace it with 16 gauge plate. Cut sheet to size and clamping original plate as a guide, drilled the bolt holes. I also used the bolts to hold plates in alignment. Installed plate and not leaks. Transmission worked perfectly. 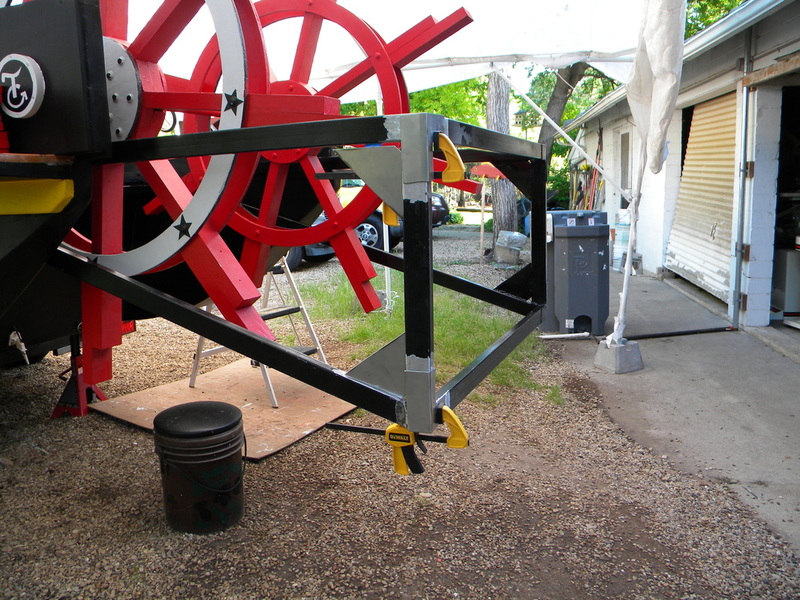 Now I just need to see about extending drive shaft with a few 90 degree bends to meet the paddle wheel. Gasket plate and replacement plate. Drive shaft hole with gasket plate removed. Using original plate for holes placements. Also putting in bolts to hold original plate in place. Holes drilled, now need to cut excess off, so fit in planned space. New plate in place, even used liquid gasket paste. 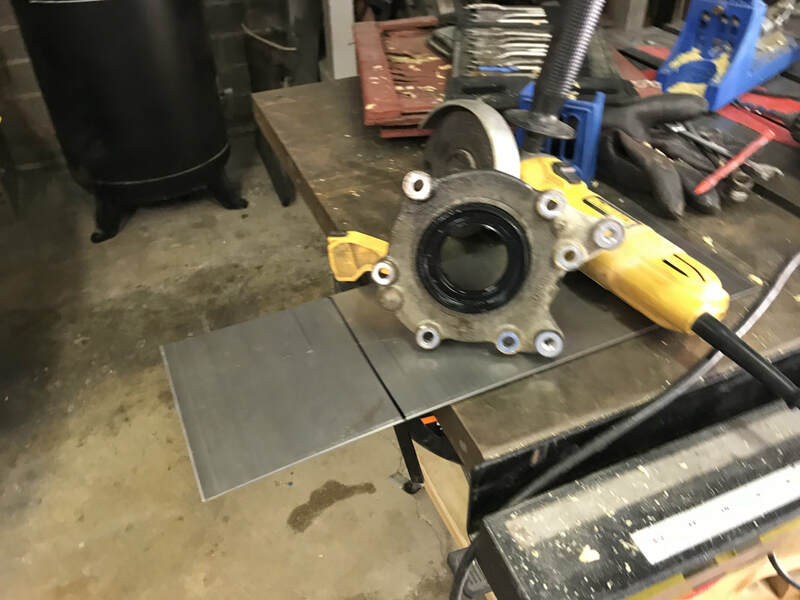 Had to add washers to make up for the thickness of the original plate. 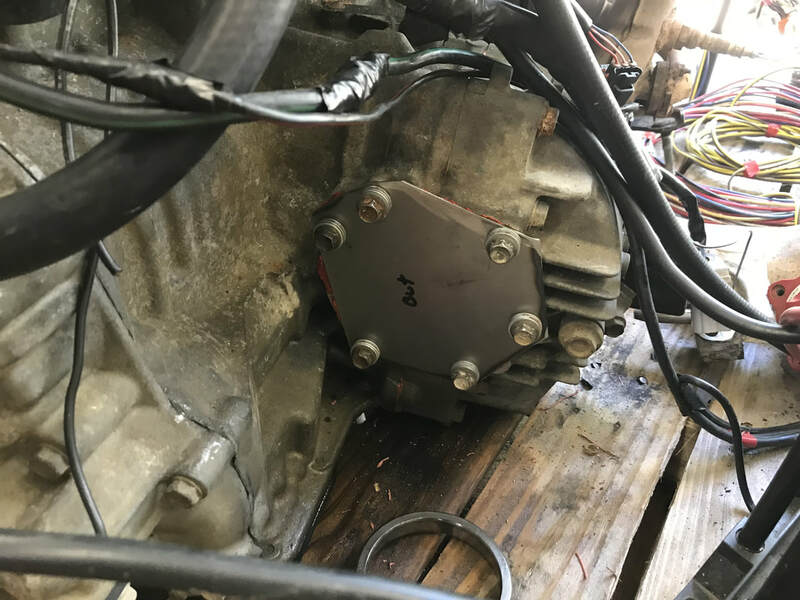 8/30/2018 Cooling system and Transmission. I have hooked up a trashcan full of water to serve as a temporary water tank. I learned that you need to bypass the heater hoses, so I bought a long enough hose to make a u-bend without kinking. I learned a few things today about the transmission system. 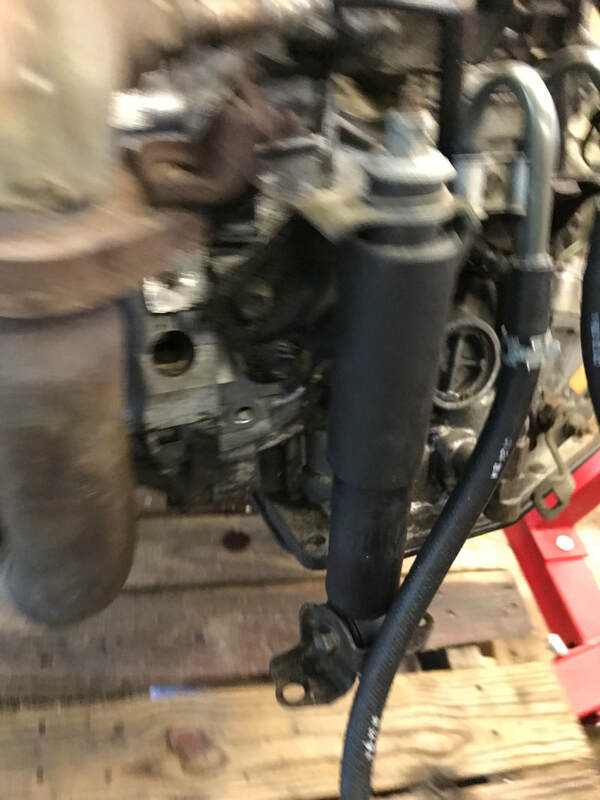 One, it will not work without transmission fluid, two, I need to figure out how to plug the hole the missing left drive shaft left, and three, any transmission fluid that did not drain out the drive shaft hole, gets pumped out via the transmission fluid cooling pipes. The last one will eventually go to a heat exchanger, but till then will also bypass with a long hose. Radiator hoses in large supply of water in a handy trash can. 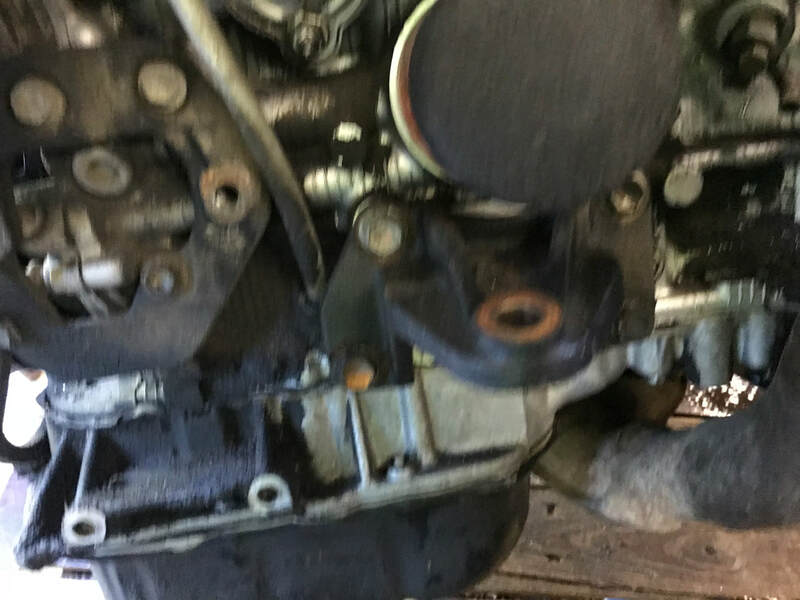 Transmission fluid leaking out of missing Drive shaft hole. Heater water lines are looped together. Transmission fluid cooling lines were discovered due to steady stream of fluid pouring on the floor, but was a good thing, due to dirty condition of fluid. Which means I need to flush the system clean. 8/26/2018 Success! Finally got motor running! After doing research, found I was looking for an ecu that used four connectors, and used a standard key. Searching the junkyard, we found a 1998 Camry with the very ecu we needed. Immediately wired it in and the engine actually turned over and gave three putts. Reinspecting my wiring work, I discovered I had swapped two wires, both were grey, and tonight was the night the little engine ran! Would have ran it for several minutes to celebrate, but without any coolant, did not want to over heat the engine. 8/20/2018 Been trying to reprogram the chip on the ecu that contains the codes for the RF chip that would have been in the ignition key. Still waiting for a part to come in from China that should let me use my computer to do the reprogramming. Of course this may not fix the problem requiring me to rig up a transponder and reprogram the ecu to accept the new code. I was sitting thinking today, I wonder when Toyota started using the transponder ignition keys. Turns out it was 1998, and if I had gotten the ecu out of the 1997 Lexus at the same time I got the engine, I would never have had this problem. I am now thinking as long as the engine is the same, any older ecu should work. 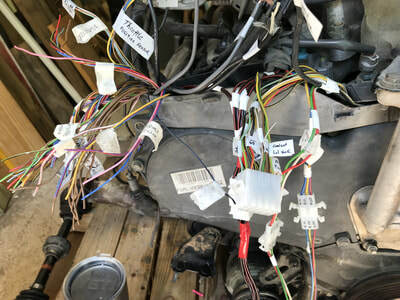 So going back to junk yard Wednesday to get an older ecu and connecting wire harness. I have also ordered the Haynes manual for Toyota Camry 1993-1996, which should have the pins, so I can wire it up. And after further research, I can chose to get a ecu from 92-97 Lexus es 300, 93-97 Camry. or 94-97 Avalon. These are the cars that carry the 1mz-fe and are covered in the book I ordered. 7/27/2018 Alrighty then. I think I may have found my problem. We have decided to try to use the diagnostic connector to see if we could find the problem. In researching how to wire it up before I make a trip to the junk yard, I saw also that there is a device called the immobilizer. Being curious, I read this is an anti-theft device that reads a sign from the rf chip in a key and relays it to the ecu. If the ecu does not receive this signal, then the ecu will not allow the engine to get fuel nor ignite. I researched how to reprogram the ecu to accept another key, but junk yards do not keep keys, so would have to buy one, and have to open ecu to hook to my computer to reprogram it. I found a kit on line where you can upgrade your car to a remote push button start. Comes with all parts needed, including a by-pass. Sounds like the solution I need, so now just waiting for kit to be delivered. 7/23/2018 Still have not got the motor to start. Have gone back and rechecked wiring. Think I may see the problem, but it has been over 100 degrees for the last week , so have mainly tried to stay indoors. Terry has been on vacation for last two week, but if he comes back today, maybe I will brave the heat. 7/12/2018 Good news, I have learned to read. 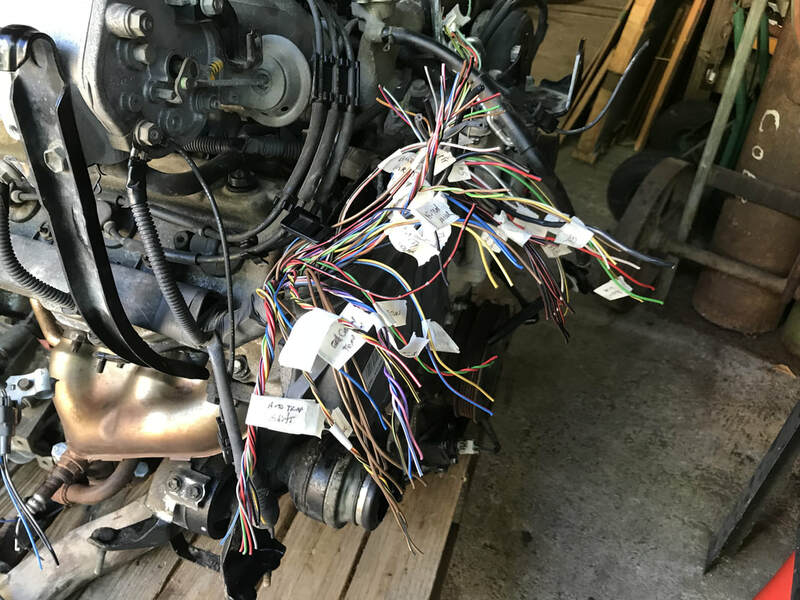 I have spent the last three weeks digging up all information on what the pin and wires coming out of the ECU (Electronic Control Module) and have been getting very few if not confusing results. I finally took a trip to the Toyota repair shop to see if they could pull up the info, to be told that Lexus was a priority, and must go there. But luckily the guy said I most likely would not, since they would only be able to provide the part number and nothing else. He told me the best luck would be at the library. Have not been in one in thirty years, but gave it a shot. There were books, but not with the info I needed. Info Lady helped look on web, only to find best source was a diagram I had already printed out two weeks ago. But after looking at it with new eyes, I saw it did indeed look very close to what I needed. Back home started studying the diagram and began to compare it with Haynes Repair Manual, to discover that I had been misinterpreting some of they symbols. What I had thought was references to connectors turned out to be the pins from the ECU. I was so excited I could not help giggle like a little girl as I compared the book to the ECU itself, and surprise, surprise, the wire colors began to match. I have now rewired the ECU to the motor, fuse and relay box, the ignition key, and added the newly arrive fuel pump. Everything seems to work now, even the fuel pump came on and turned off 2 seconds after I stopped trying to start the engine, just as it should. 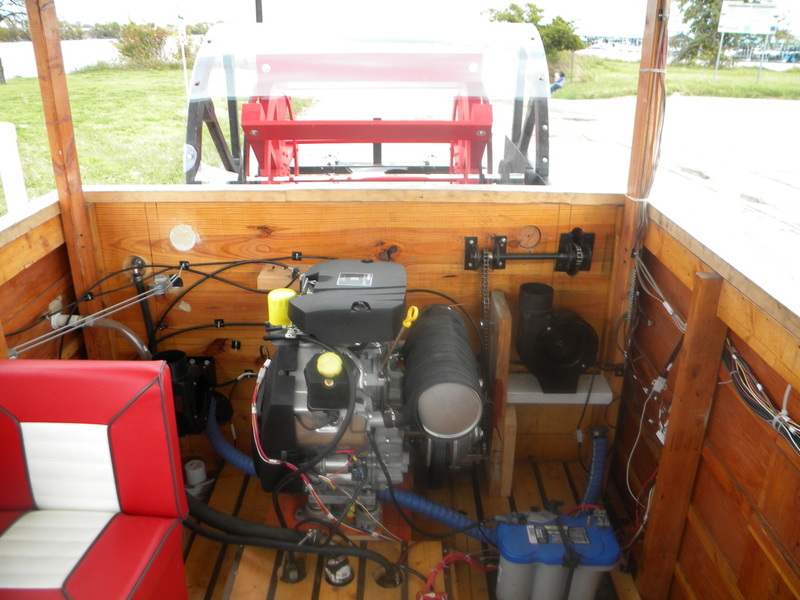 Next step is to hook up the fuel pump to the engine and to rig up the water hose from the faucet to the engine. It seems like I am getting so close to actually starting the engine. I will post some of the diagrams and charts I have made. 7/4/2018 Happy fourth of July! Still can't seem to get the engine to start. Seems not getting any fuel. Read some more and found out that for fuel injection type engines, you need a fuel pump to force the gas in at around 45psi to start the motor. So, sent away for a inline fuel pump, and now busy seeing how to wire in the new relays needed for that. Also found out that each diagram only showed the connections for starting, and running, but if taken together, there were several connections I had missed. So now need to add a few fuses that were not in the relay box I took from under the hood. Have made a new diagram for the wiring, which includes all connections, and if it works will post that. Parts should be in sometime next week. Wish me luck. 6/30/2018 Praise the Lord! Good News! Been trying to figure out the wiring and was able to get the starter to work via the ignition key. When I tried to wire up the rest of the engine, I kept blowing the 30A fuse, so went to the auto store for more. While there, I saw the section of auto books, and I remembered using one to work on my car about 25+ years ago. Wondering if they might have the one I needed, I saw Haynes auto books, and found the one I needed. Using that book I have about finished wiring everything up. It was such a boost of confidence to have the wire colors actually match both the book and engine. I have only to finish wiring the power and I can test the engine again. I will post what all I needed to have wired to run the engine once I am sure everything works. 6/22/2018 Well, have been studying the engine. Apparently these new engines require a small computer to run efficiently. So we went back to the junk yard to pull the ECM from the car to find out that the one we got the motor from had already been crushed. Not knowing any better we took one from another car of same make and model, but a year later. Now I am trying to match the wires of the ECM to the engine, and being a novice...well it is slow going. 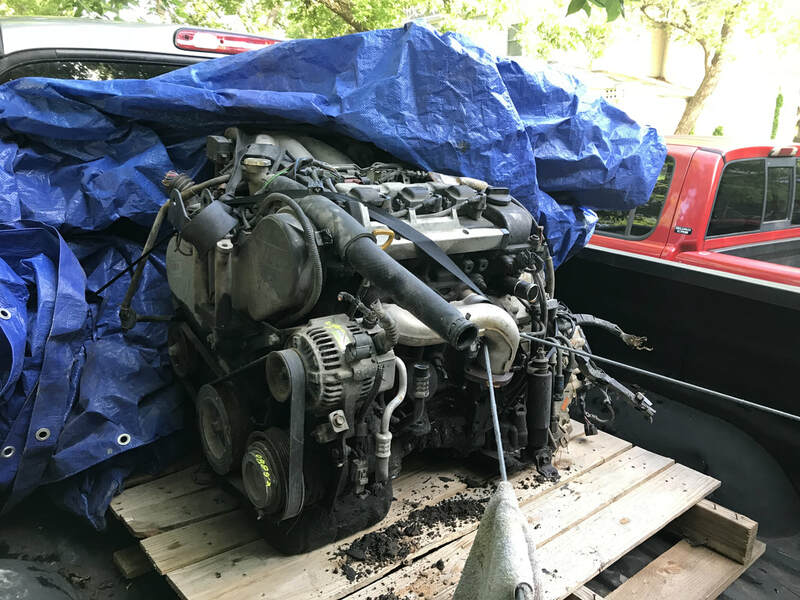 If you are going to use an engine from a car to power your boat and looking at a car newer than 2000, then just buy the entire car and that way you can be sure to get all that you need. Or just spend the time to get everything from the car on the first trip. If the wiring doesn't work, then I am going to begin again with a new motor and do it that way. Luckily the ECM seems to have several wires the same color, so I was able to match up the coils, injectors, and several other items. Hopefully it will be enough to get the motor running. I may not need everything, such as the sensors and such. Course can't test the auto transmission till the engine is running. There was a large bundle of wires running into the passenger area to the ECM, a bundle of about 100 wires. We first stared to try to just match the wire colors, but some were too close to tell where they might go. 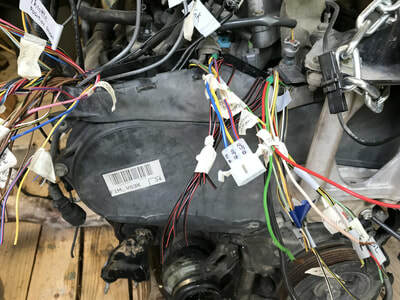 So we then started at the engine and used a multi-meter to test connectivity, and was able to start dividing the wires by components. Being a novice, I was trying to connect all the wires to the ECM, but luckily, Terry was able to tell me which items are required to run the engine, which made it much easier. Once we got the wires divided, they started matching up with the ECM wires color wise. It is just so hard to find a pin out of the ECM we have on the web. I found some that were close, but they always just a few that just did not match up color wise to the item they claimed to run. If we had taken the EMC at the same time as the engine, this would not be a problem. Hind sight. 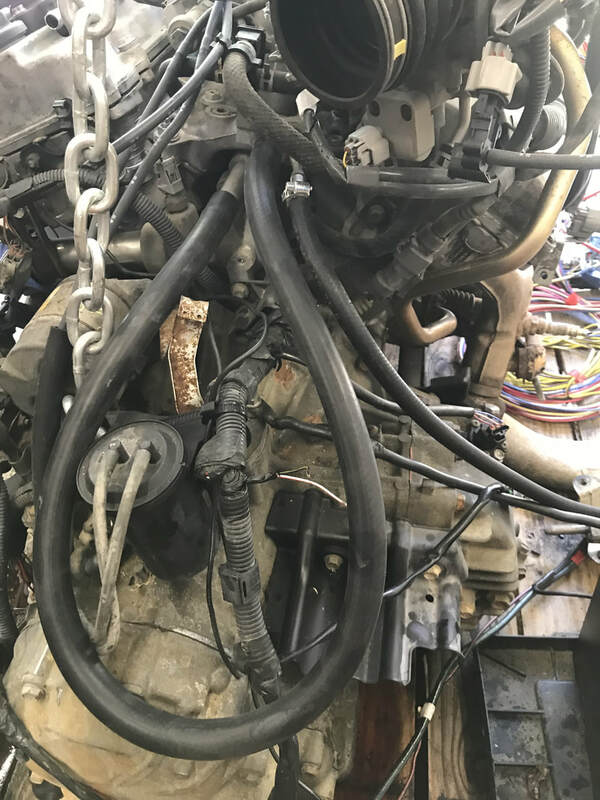 I figure to spend another week on this engine, and if we still can't even to get it to turn over, then back to the junk yard for the whole car. There are so many more wires on the ECM than the engine, since we are not using the AC compressor, nor the cruise control. 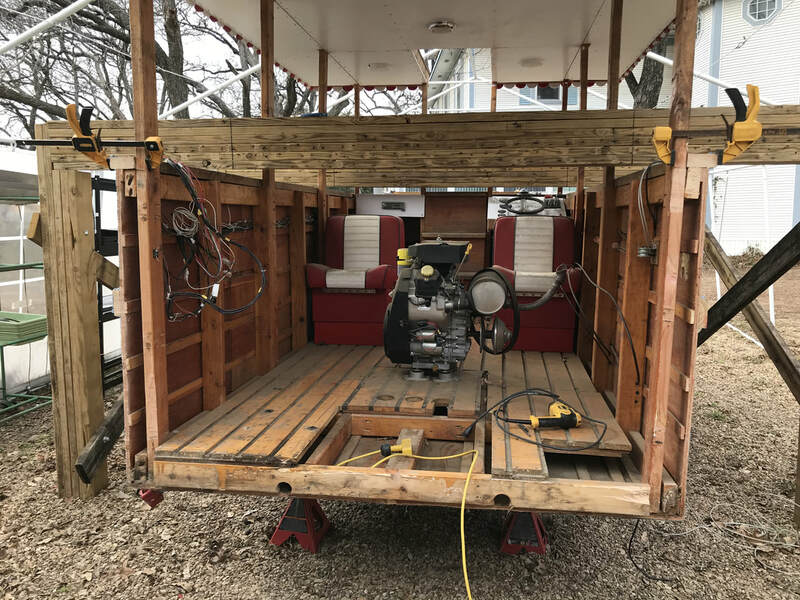 5/25/2018 Was able to get engine out of the back of my pickup using an engine hoist I had bought. Love my old gravel driveway, but not today. Had to use plywood to be able to roll my hoist around. 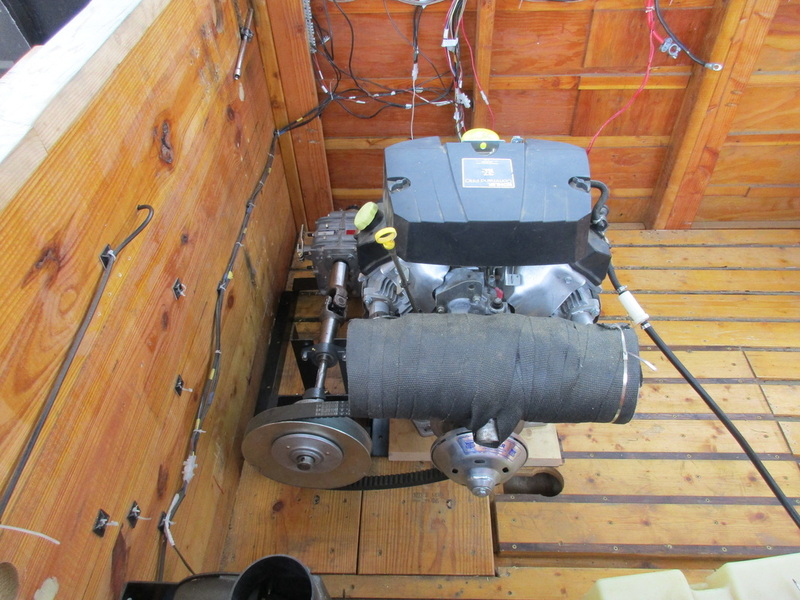 Now have engine cleaned and placed in my shed, so I can begin work of stripping all that I do not need off it. 5/22/2018 Yes! Was able to get a motor from a scrap yard. The fellow at the yard told us the var had problems with the rear, and that the motor ran when it was delivered to the yard, so we are full of hope that the motor will still work. 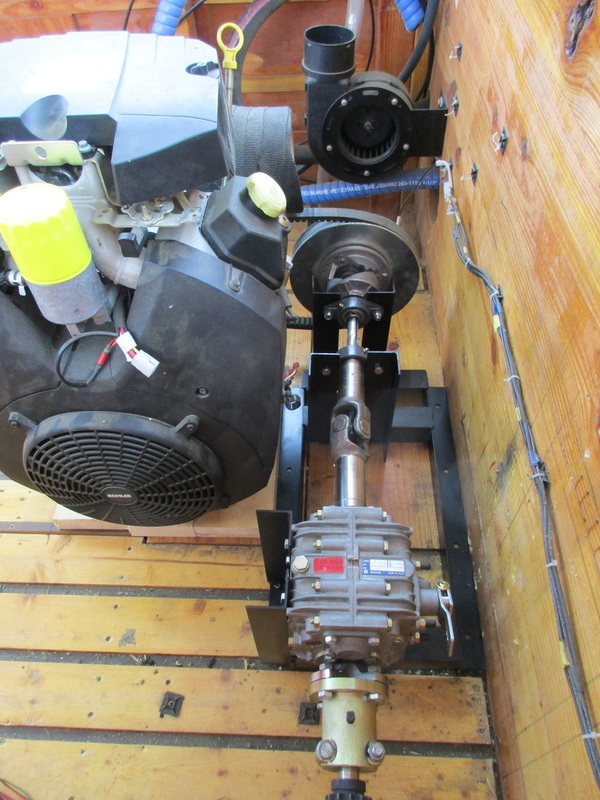 Now we just need to get it out of the back of my pickup and then start taking off all the bit we do not need, such as the ac compressor. Engine is a 3VZ-FE with a front wheel drive transmission. 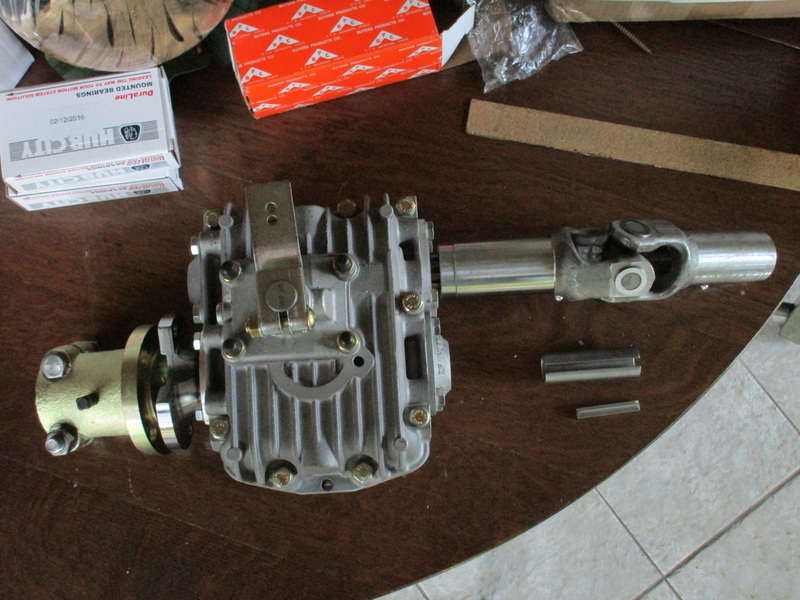 Mainly went for the front wheel transmission so that the trans would not be long. 5/16/2018 Been a month, but have been able to resin the frame wood to seal it. Hopefully today we go out to get the motor. Looking for a small block auto-transmission gasoline at least 100 hp engine. Needs to fit in a 4' x 4' space, hopefully smaller. 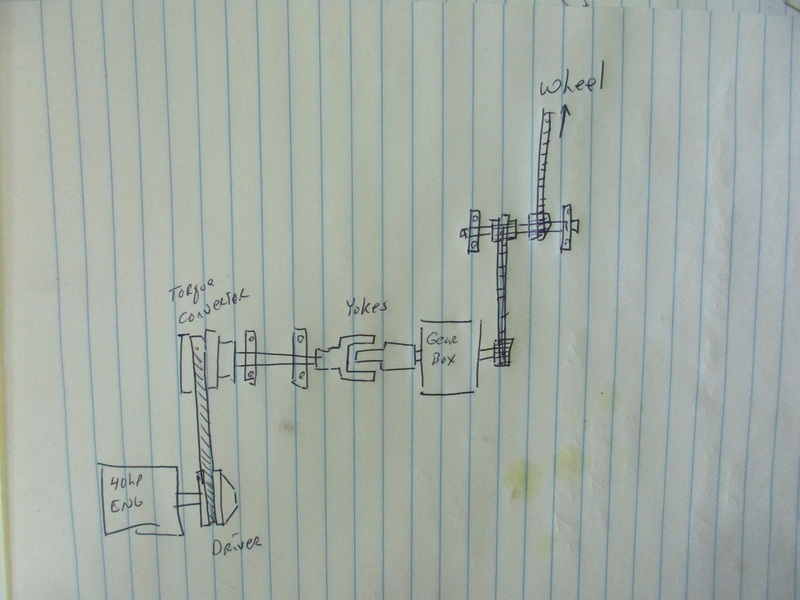 Thinking maybe a transverse engine would work best, meaning the transmission is 90 degrees to the block. 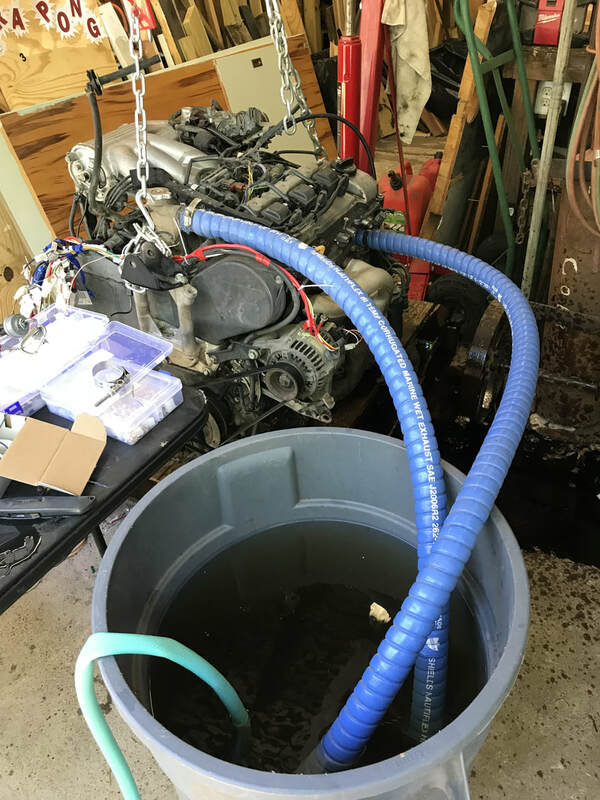 Soon as I get the motor, I can then begin the modifications to convert it to cool using lake water, and use said water to cool the exhaust as well. 4/17/2018 Was able to finish the aft curve of the pontoons. Made paper patterns to find best fit on 2" x 6" boards. Found just needed two pieces to make the curve. 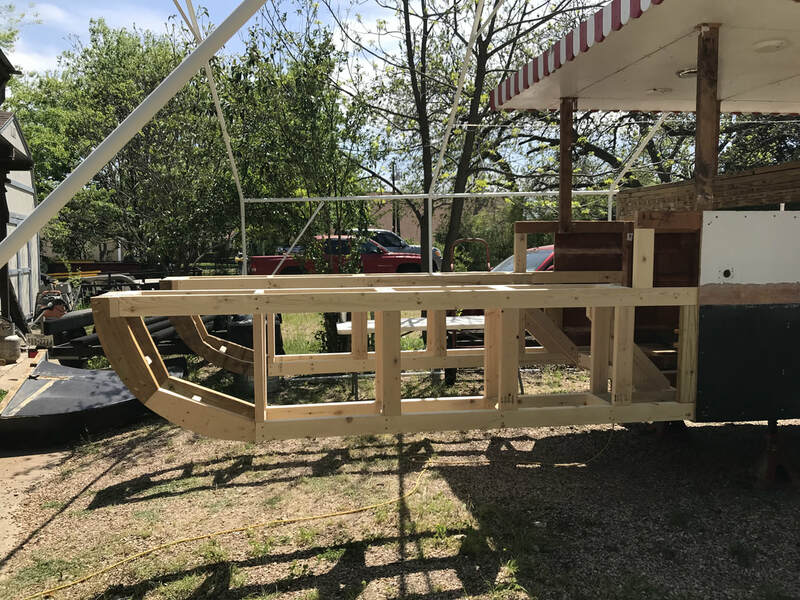 I planned to finish the inner curve, but after doing just one at the band saw, I decided they would not be seen nor even help nor hinder with the form of the boat. I pocket holed them together and attached them to the boat. 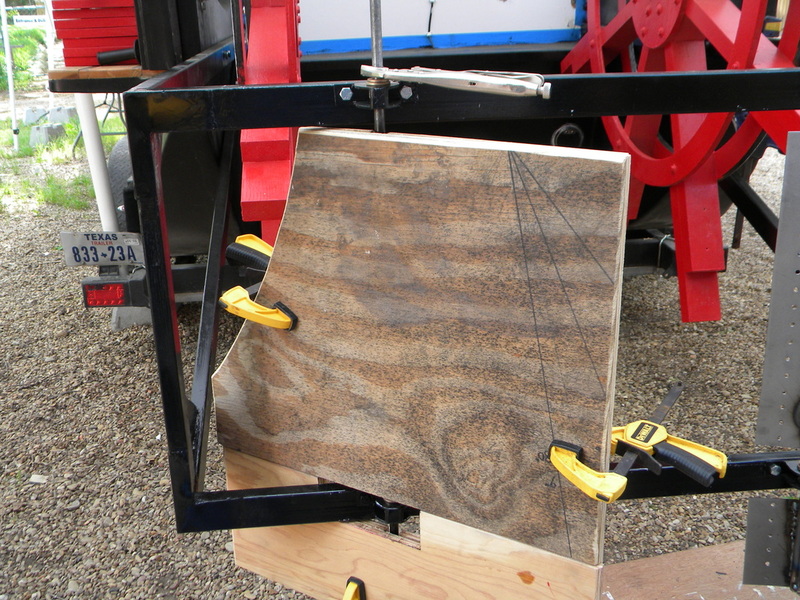 I clamped a board on the bottom to help align the curve. Of course there will from time to time, a wrinkle will appear. I had measured the height of the pontoon, and assumed I had planned for the top to but up against the frame that was sticking out. I found out I was 1" shy, so I added an extra board to the end as a filler. A few added braces and I was done. 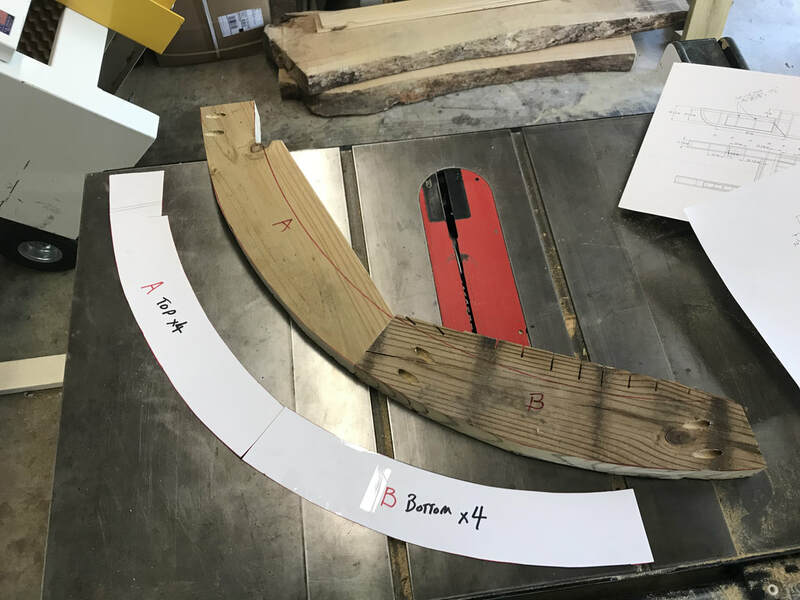 Paper patterns for the two pieces of the curve. 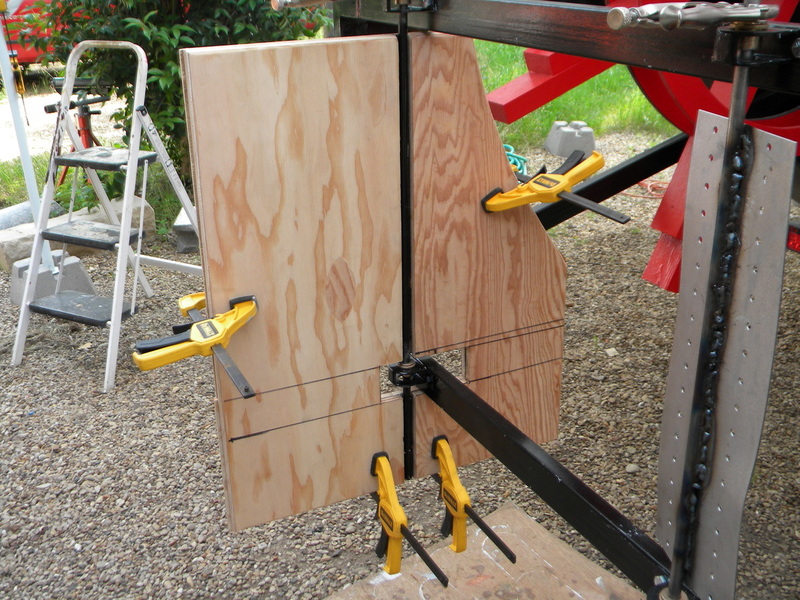 I used a board clamped to the bottom to help align the curve to the frame. Curves going up. They look nice. 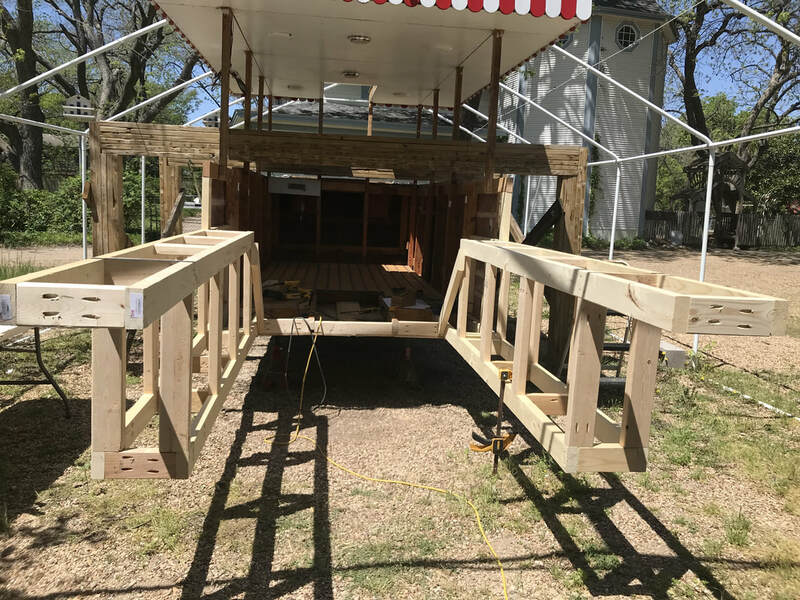 Pontoon framing all done. Was planning to finish the inner curve, but it will no show and took more time than I wanted to spend at band saw. Was easy to whittle outer curve using the table saw. Now all I need to do is sand smooth the curve. 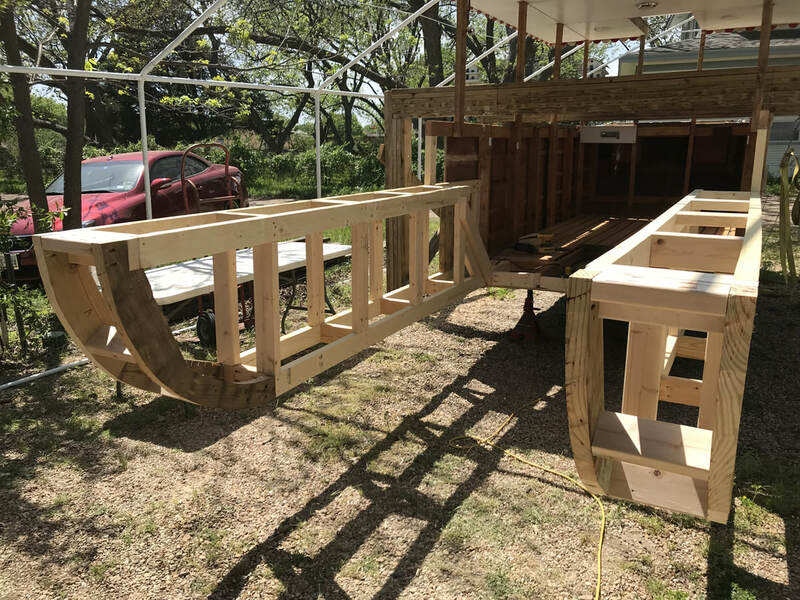 4/16/2018 Aft pontoons almost framed, just need to make the curved ends. Soon going to start placing on the plywood skin. Still need to go find a motor. 4/14/2018 Could not help myself, was such a pretty day for a weekend, that I started without my friend Terry. 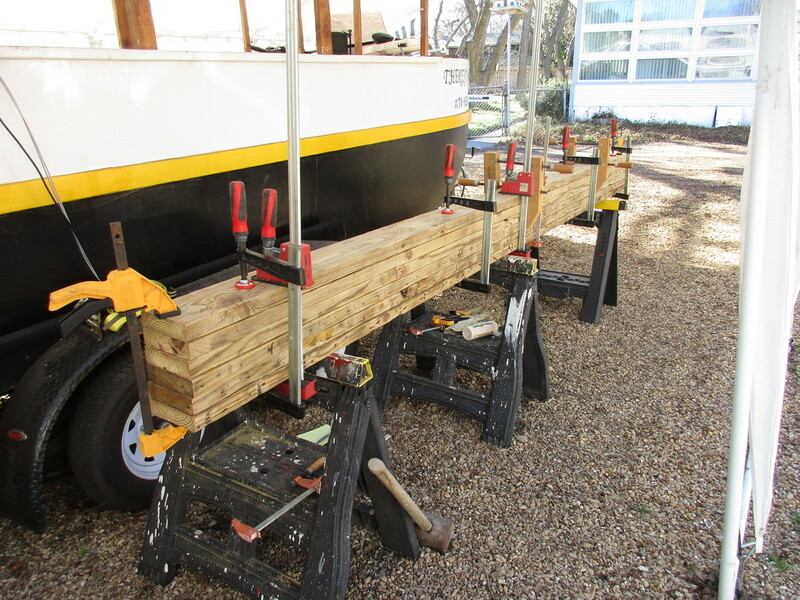 Got most of the framing for the pontoons. The Lord loves me, for He must of had me design frame 9 to be moved in a bit so that the bottom would not require any splicing. I also discovered the remnants of the first attempt of placing the rudder in the aft center. I had to remove the last bit of center board and patch it over. Inside all cleaned, and last of center board removed. You can see how much longer the new pontoon is to the old. Got a good first day start on new framing. 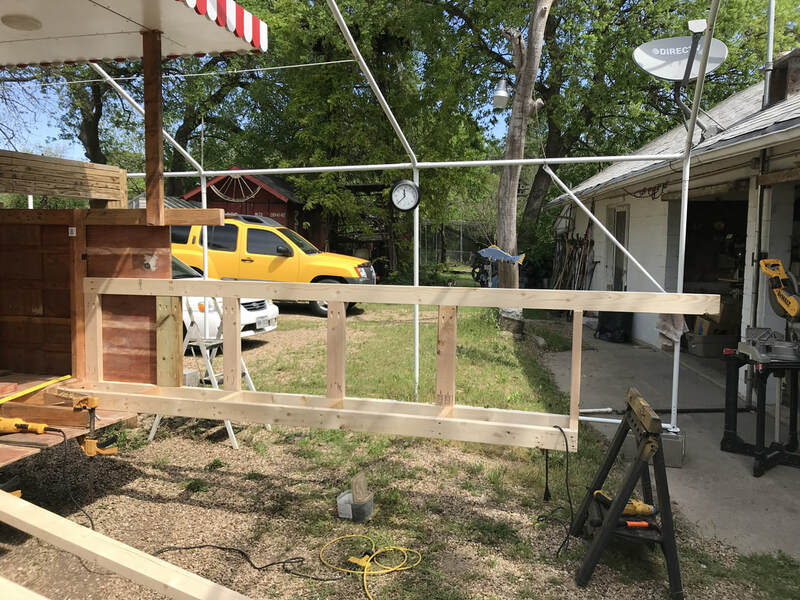 Lower framing for Starboard side done. Still need to build the curved end. 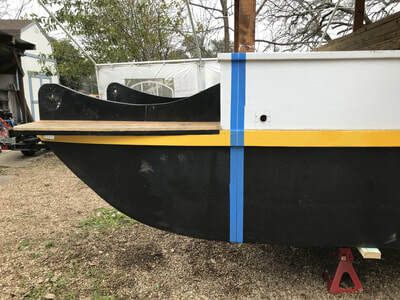 The hull looks longer, but the boat should be about he same length when including old rudder system. 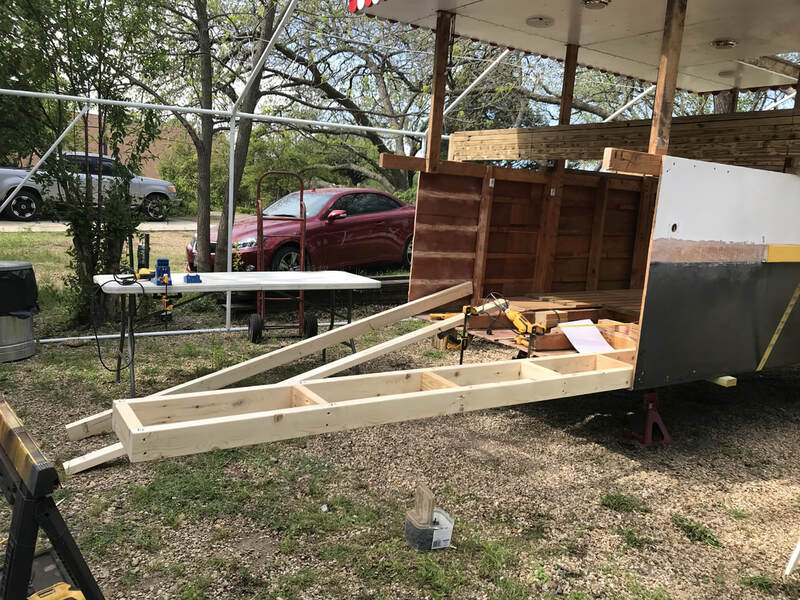 After building rebuilding frame 9, I realized I must have thought ahead and designed and moved the frame in so that there would not be any splicing of the bottom to extend it to the new aft end. I also had to add a board in the center to fill in the gap left by the center board that once held the center aft rudder. 4/13/2018 Finally got back to the boat again! Started removing aft inner frames and boards to clean up for new framing to attach. 2/28/2018 Been Raining for weeks. 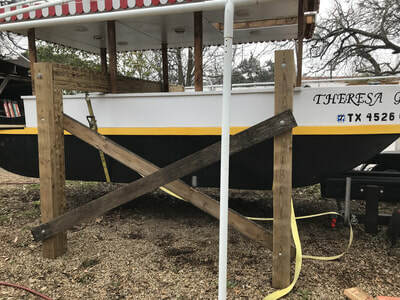 We needed the rain, but sure make it hard to get to the boat to work on it. Got boat stripped down and now ready for next step. Need to find a motor of 100 hp or more, with automatic transmission, and fits in a 3-4' footprint. Now just need to find a place I can go pick a motor out. 1/11/2018 Well, having the boat off the trailer allows us to forge ahead to the refit. I planned out how I wanted the rear removed, by placing a double row of tape on each side of the cut I wanted made. 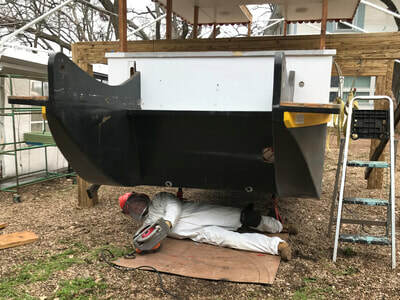 Since I fiber glassed the hull, Terry made sure to cover up all the way while cutting the bottom of the boat. The rear came off all in one piece. 1/9/2018 Hey all, actually was able to work on boat. What a great start to a new year. 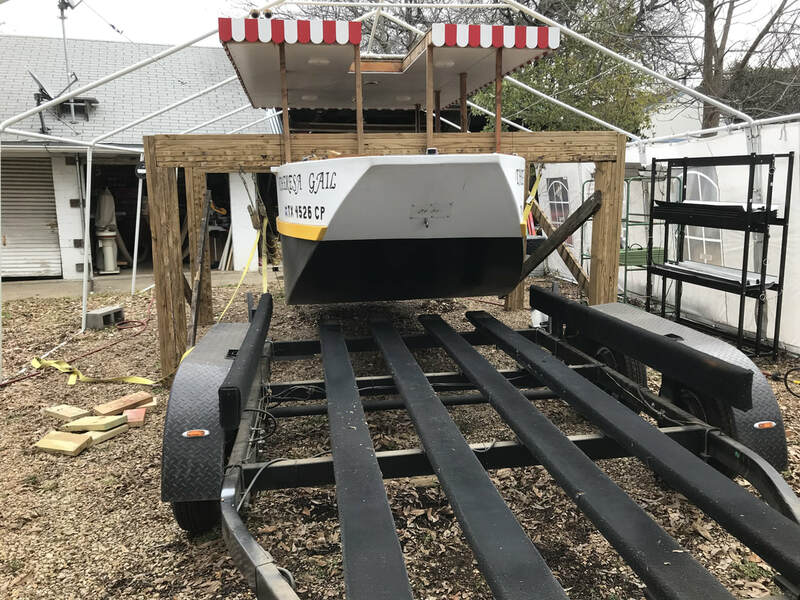 Was able to get boat off of trailer and onto some stands. Here are some pictures of the move. 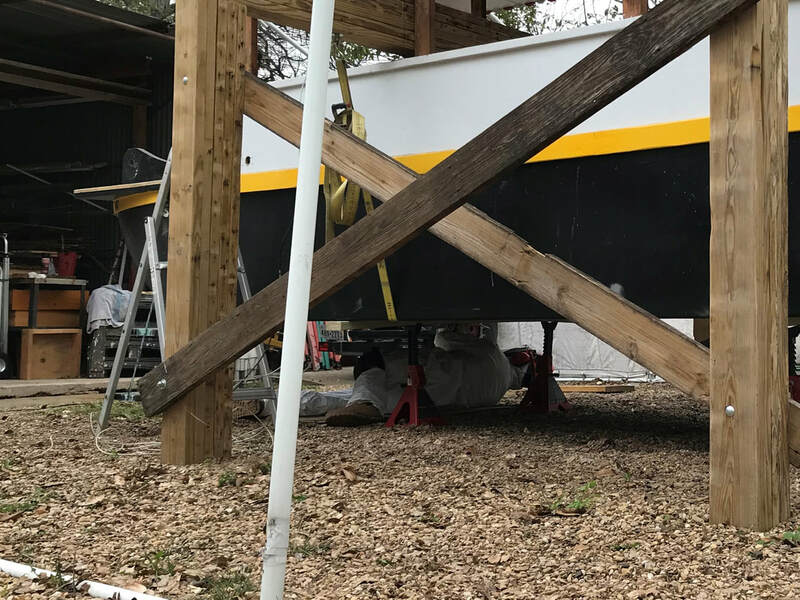 Using a pair of air/hydraulic jacks, we were able to lift each end of the boat, and then strap the boat to the support beams. After both ends were suspended from the straps to the beams, we were able to remove the jacks and pull the trailer out from beneath the boat. We then placed stands to hold the main weight of the boat. 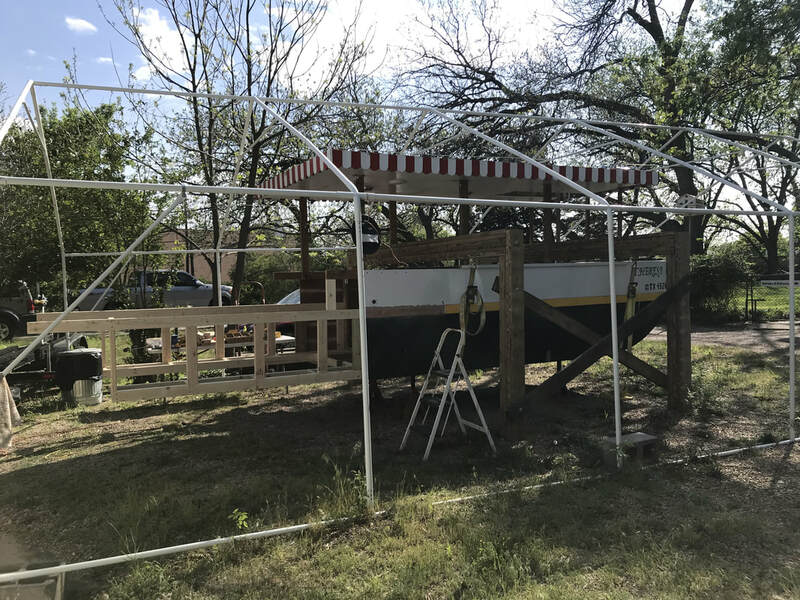 With both the stand and straps holding the boat in place, it is super sturdy and ready to be worked on. 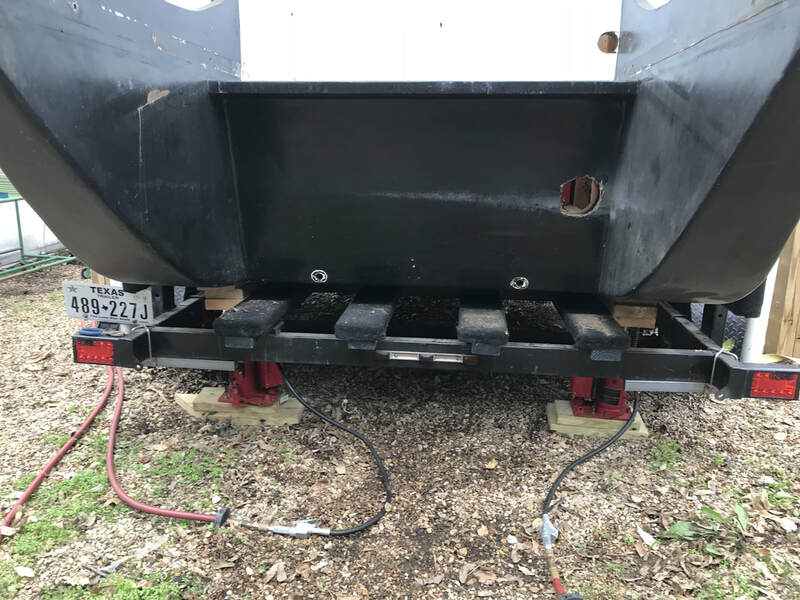 10/18/2017 Finally getting back to boat project. 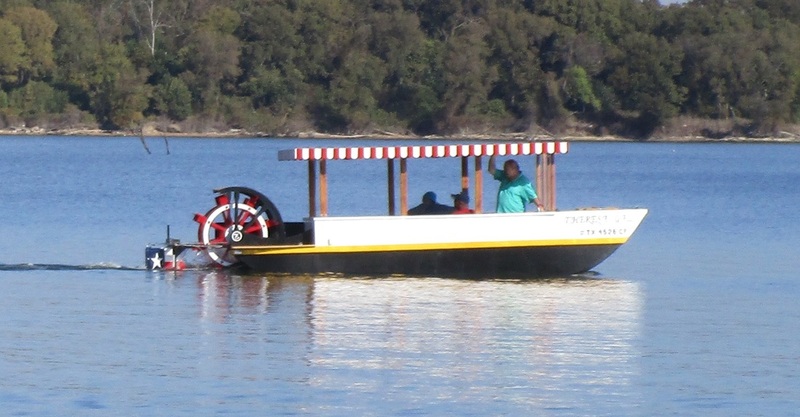 Have decided that I want to move the gas tank to right pontoon. there is only a 8" x 19.5" gap inside the frames. Found a 6" x 14.75" x 58" 20 gallon tank that will fit perfectly, and allow me have it sit inside a 1/4" box. The numbers in the middle are the frame numbers. Here are the spec for the new gas tank. 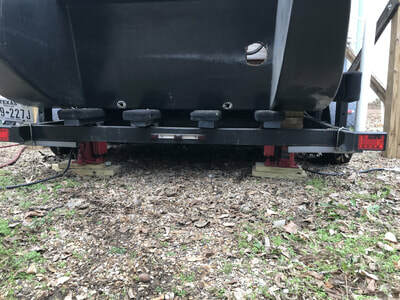 ​Also been thinking on changing the steering to hydraulic. Be more pricey, but will not have that slack due to stretching cables. After more thought, have also decided to not have the forward and aft rudder sets be combined, but have each able to be steered separably. This should allow better control in steering. I will lock one set in straight position, when using the other set. This way one set will not interfere with the other. 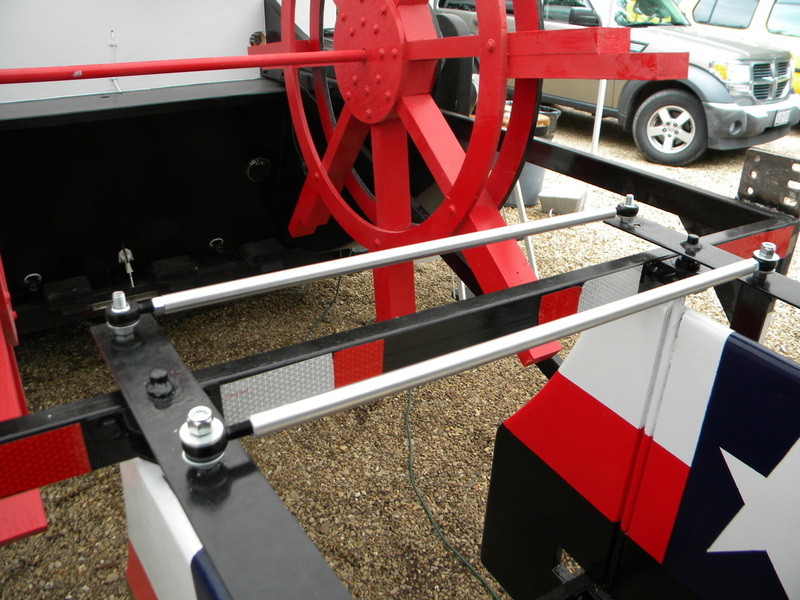 There are kits that places a helm pump powered by turning the steering wheel, and tubes that run to the back and connect to the hydraulic ram which is attached to the tiller arm. I can also hook up a rudder indicator, which I have desperately been needing, so hard to see how the rudders are angled, and a switch so that the helm pump can either operate the forward or aft rudders. ​Here is the start of my drawing for the hydraulic steering. This is the rudders attached to the rudder frame. 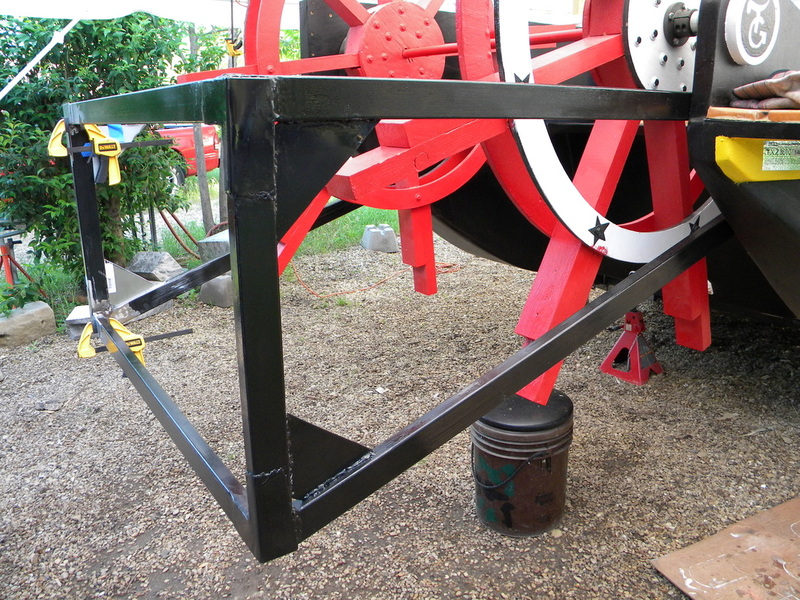 I have the tie-rods in place and one of the hydraulic rams. 10/6/2017 Just about done on last project in the house before we have another wedding. Also became an elder of my church which has taken a lot of my time, but God willing I will be able to work on the boat this winter. 7/22/2017 Really, another month already gone! Still here, and still trying to get other projects done, so can get back to the boat. Please be patient. Thanks. 6/26/2017 I am so sorry, but have had other project to finish first. Baptistery is finished, and finally clearing out first of two rooms so can get flooring done. 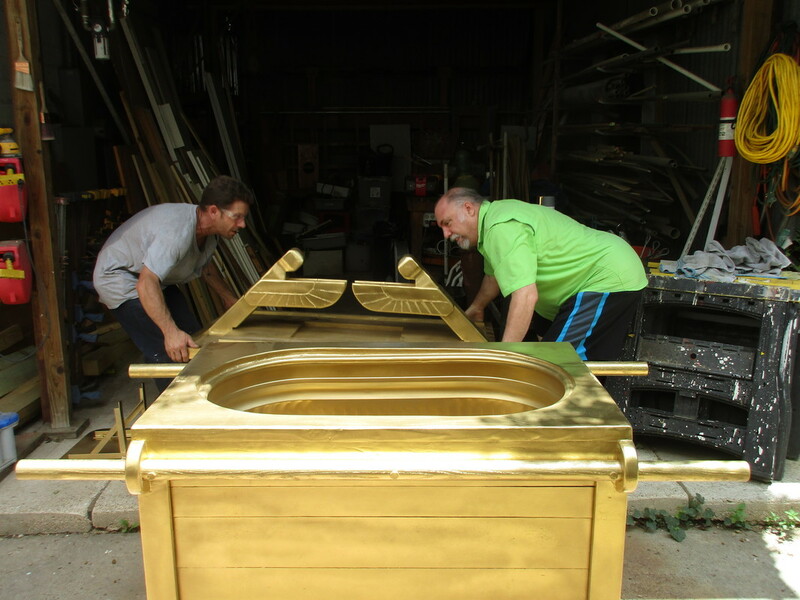 Here are some pictures of the completed Baptistery. 5/15/2017 Been busy as bees. 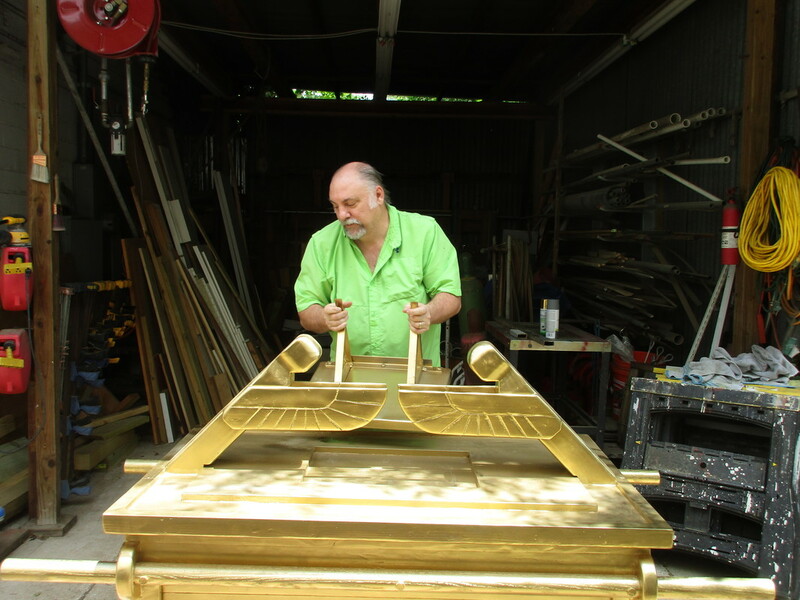 Have more than four projects going at once. Still doing hardwood floors in house, just two more rooms to go. Finished flooring attic, now repacking storage items to be placed there. 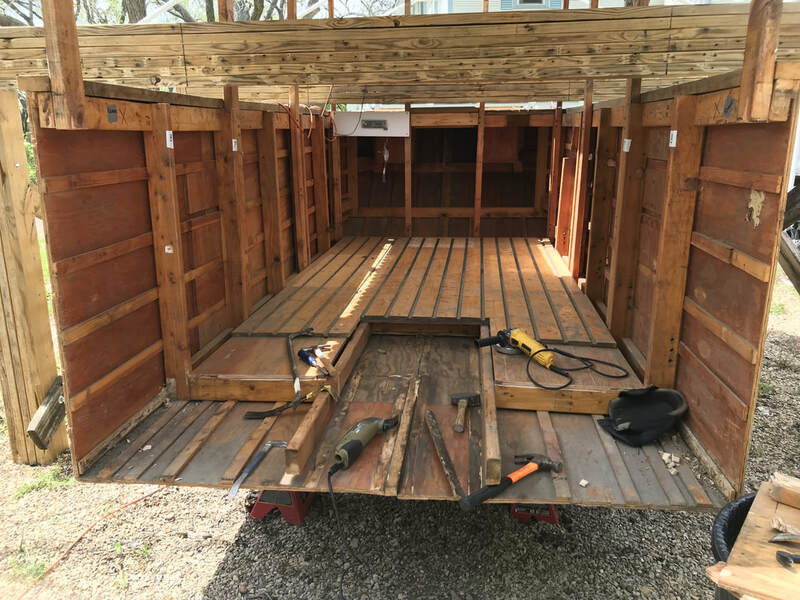 Emptying two storage rooms, trying to save money, and only a little of the last one to go, and wife wants it done before it gets too hot. 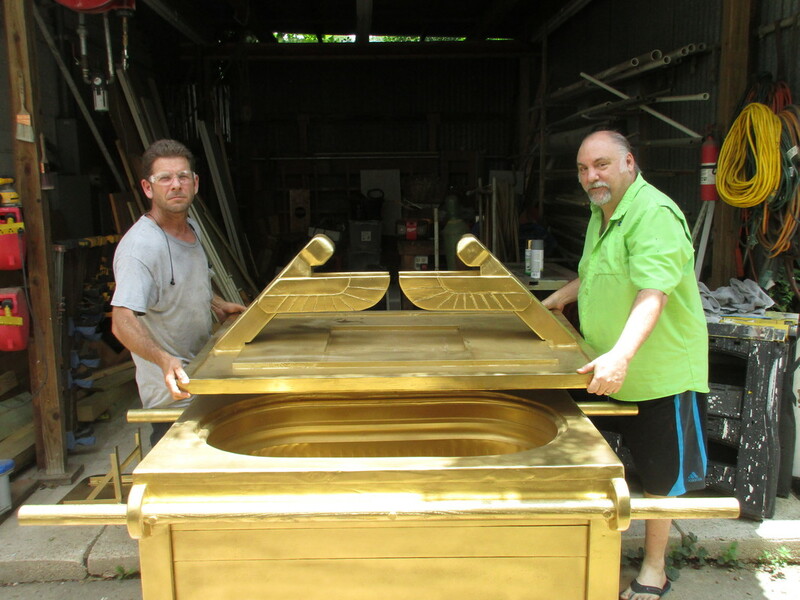 Building a portable baptistery in the shape of the ark of covenant for a church. And also finally had a little time to get back to my boat. 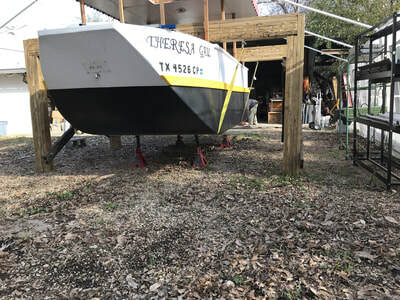 Got beams across top of boat and made the legs. Placed cross braces for stability. 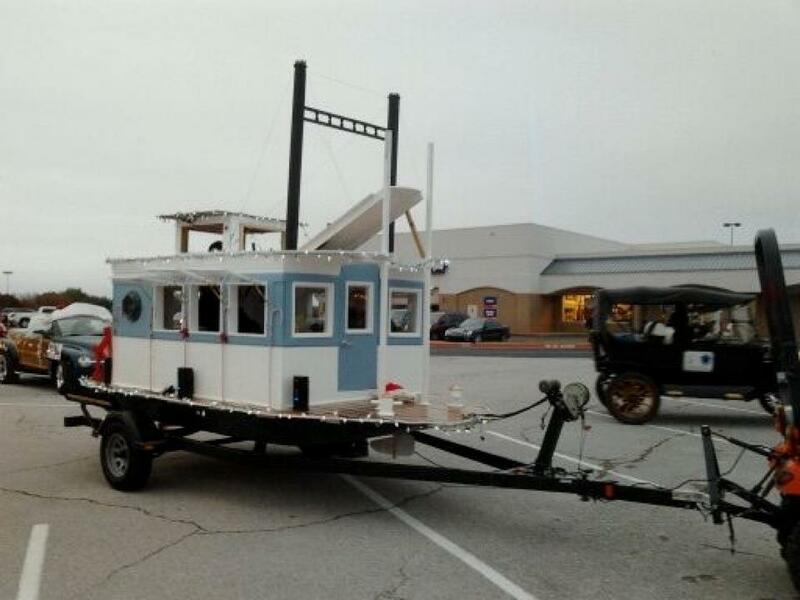 Will jack up boat and suspend it by the straps, then pull trailer out. 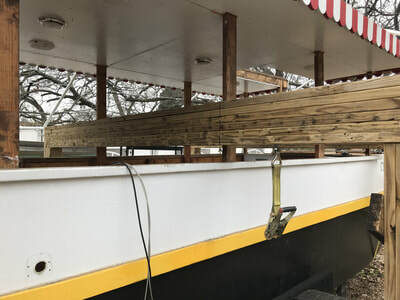 Finally will lower boat onto blocks. Then the reconstruction can begin. 3/31/2017 Hey yall. Been busy redoing hardwood floors in house and money been tight. But I do plan on getting back to boat soon. 2/21/2017 Sorry all, but we have been preparing for a wedding to be held at my farm. Should be able to get back to the boat in about two week. 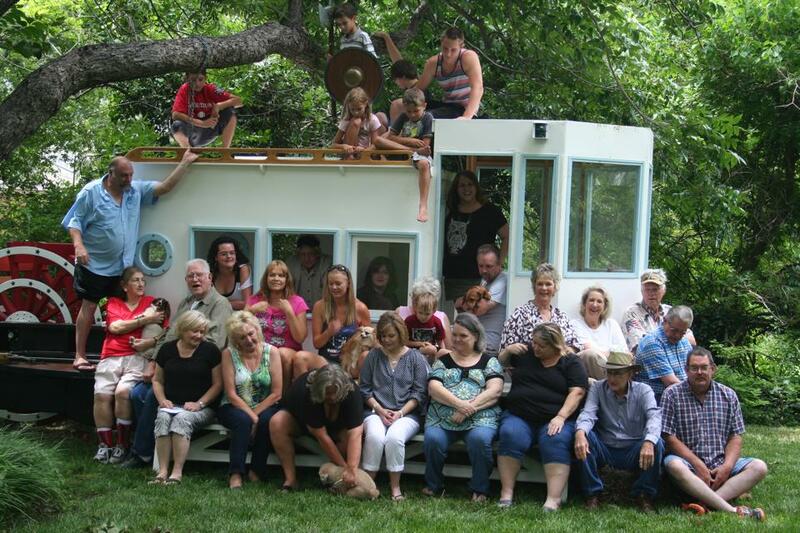 Had to fix up the old boat so they could use it as a back drop for photos. 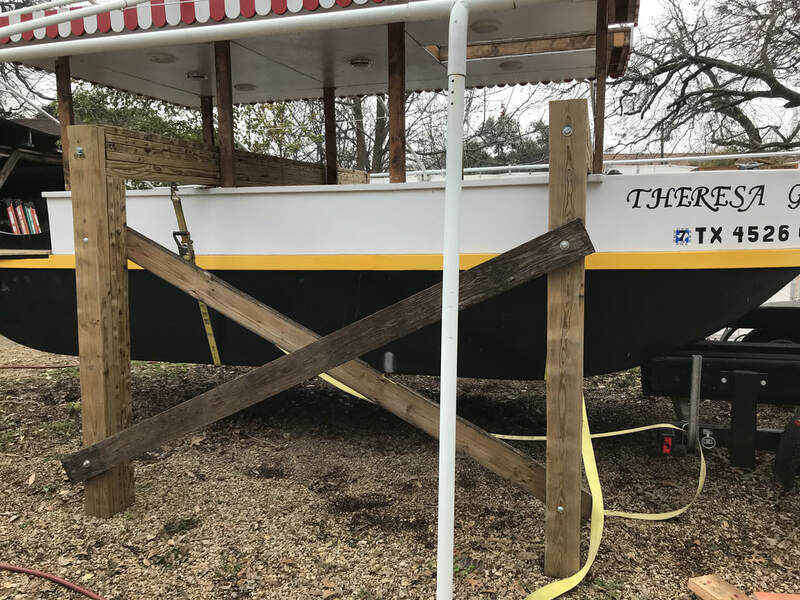 What is funny, is that now that we have fixed up the old boat, I am thinking of going ahead and getting her up and running again. 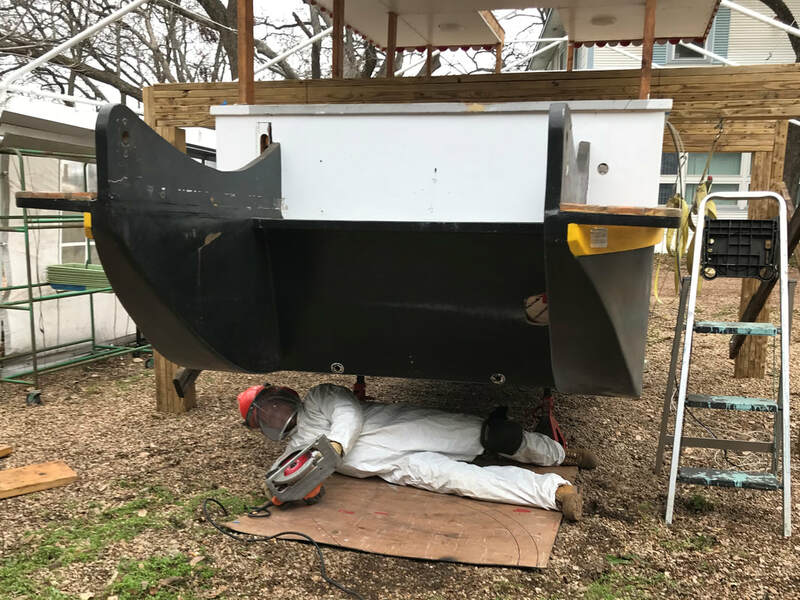 Tearing out the inside of the cabin and placing the rudders removed from the new boat and installing them on the old boat. Also going to rename old boat to Terance. An on going joke on miss pronounce of my wife's name Theresa. 1/25/2017 Began gluing up the beams. 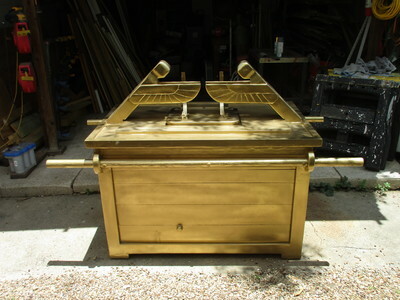 Here is one all done, just need to fabricate two metal bands for the ends. 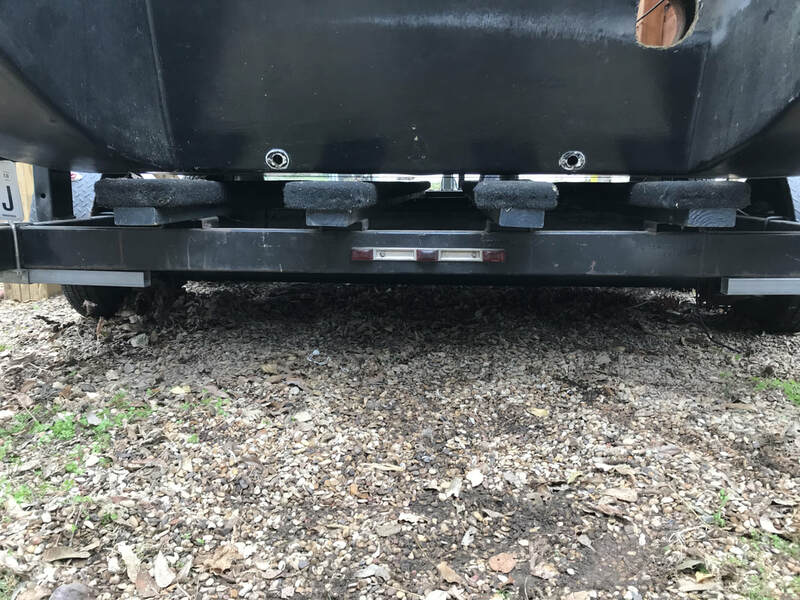 We bought some eye-bolts, but they were only rated for 300 lbs, so going to get some u-bolts instead and secure them with a metal plate on top instead. 1/20/2017 Almost finished the drafting phase. 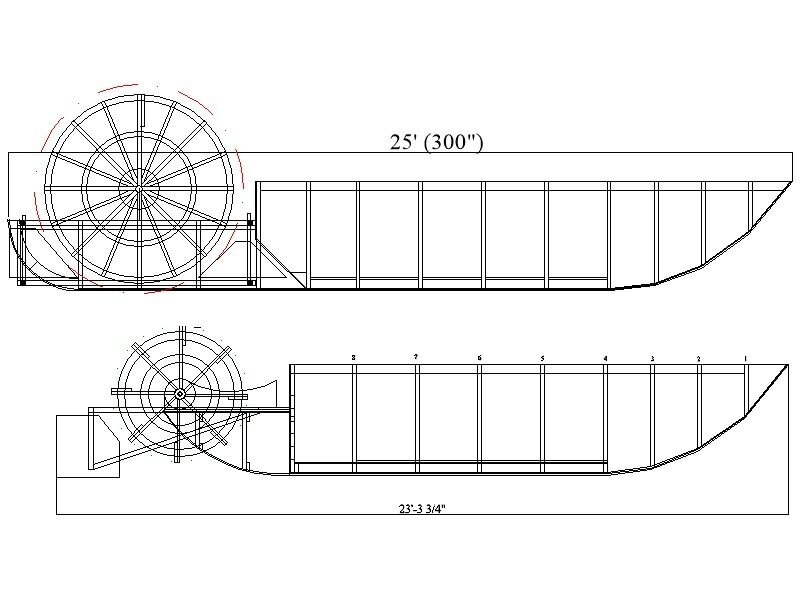 I went ahead and redesigned the plans as if I was going to build the boat from scratch. Not sure if you can download the plans, but will try to set them up. I am using Turbo Cad. I used several layers, so you can hide chine, rudders, and such. 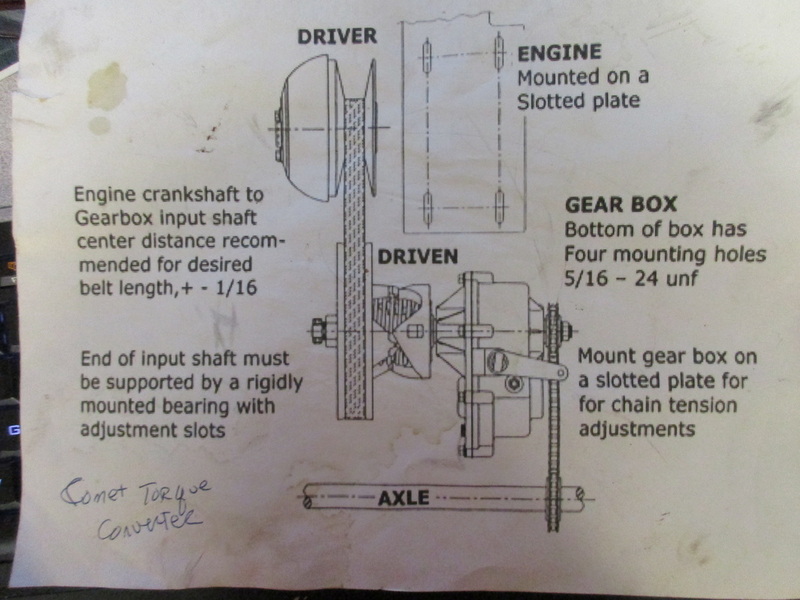 Soon as I decide on an engine I will place that and the shafts with gearboxes in the drawing as well. 1/19/2017 Just bought the book "INBOARD MOTOR INSTALLATIONS" from Glen L and what a fountain of info. I now know I have a planning hull and that after viewing the pictures of the boat in the water, that the center of gravity was too far aft. 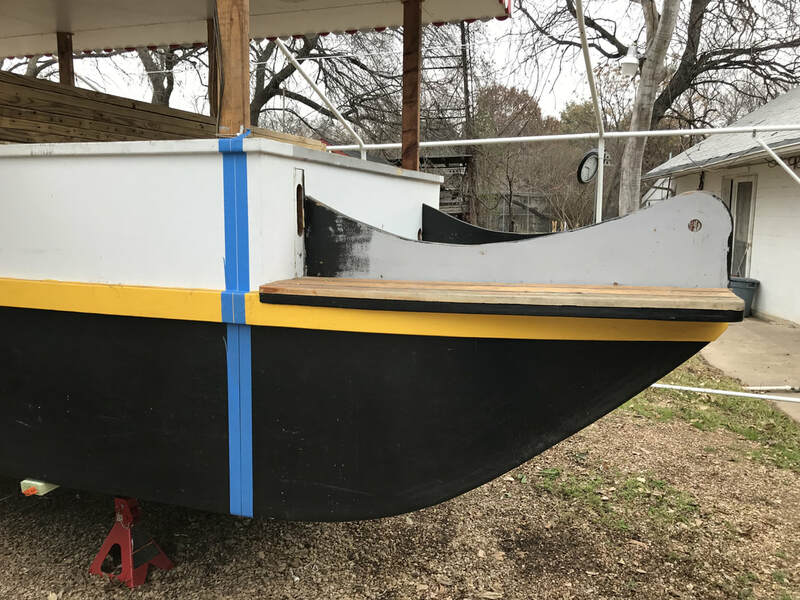 Meaning the nose was up in the air, the yellow line should be parallel with the water line.. Luckily my new design has the pontoons extend past the aft of the paddle wheel, so this should fix that. 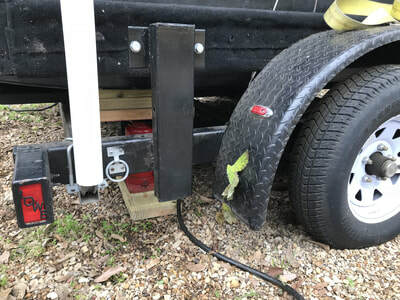 I am planning to extend the trailer also to the full length of the boat. 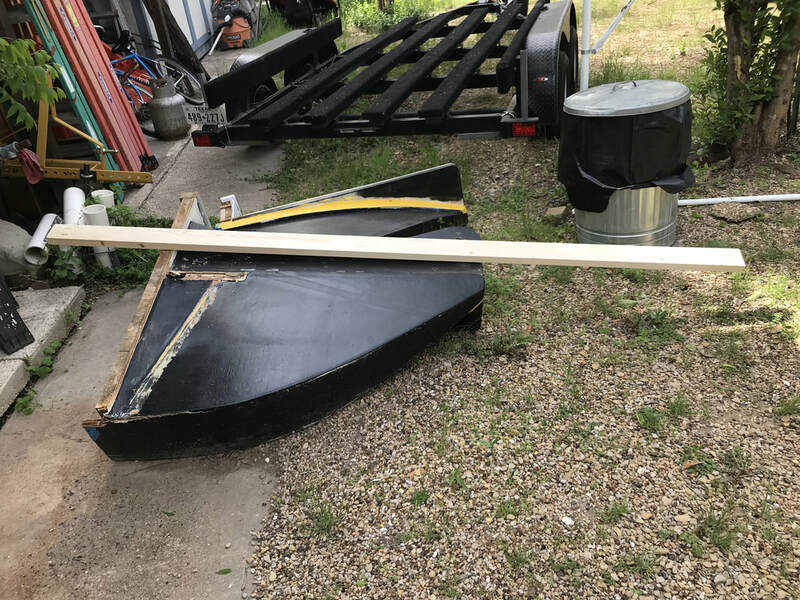 After watching some home build programs, I believe I have a easy way to lift my boat off the trailer. 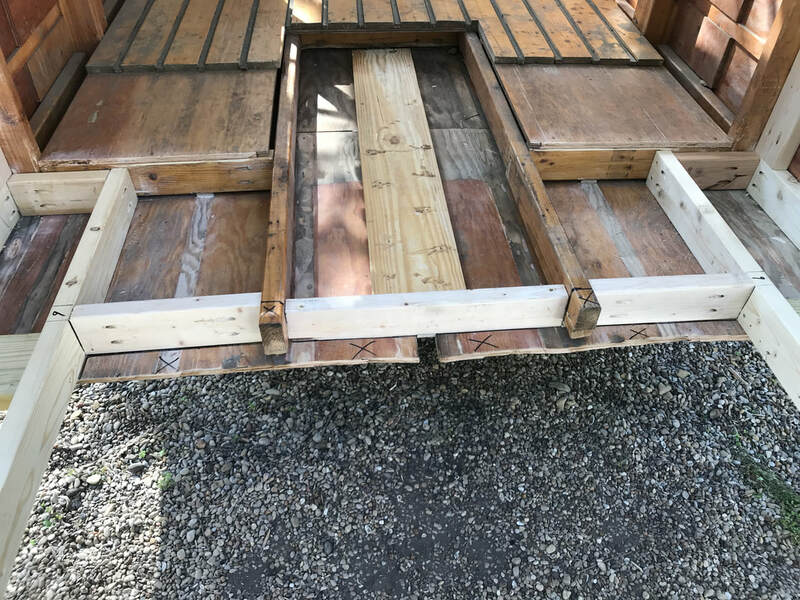 The builders wanted to remove a weight bearing wall, so they made a lamiated beam (just means several boards glued together) and a few supports to hold it up and supported the weight of the roof. 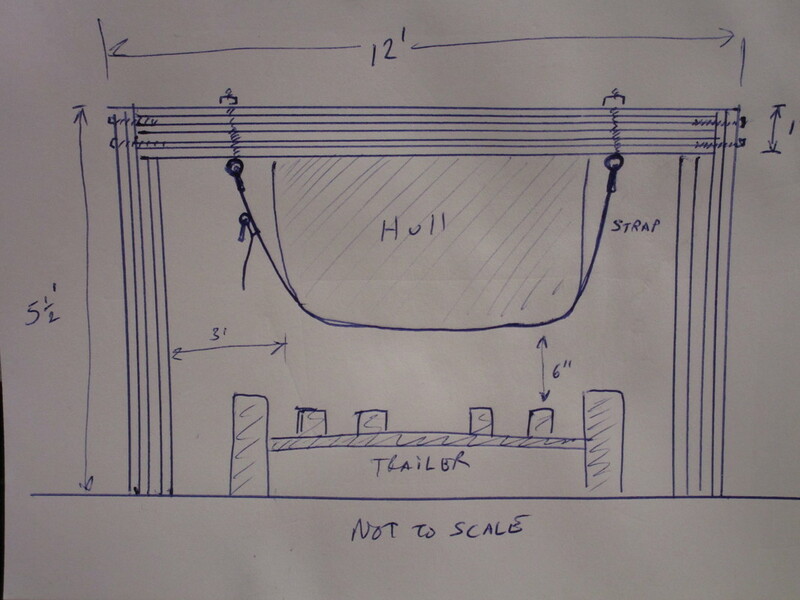 I will build two laminated beams and use straps (rated for 3000 lbs each) to attach it to the top of my hull both forward and aft of the cabin. 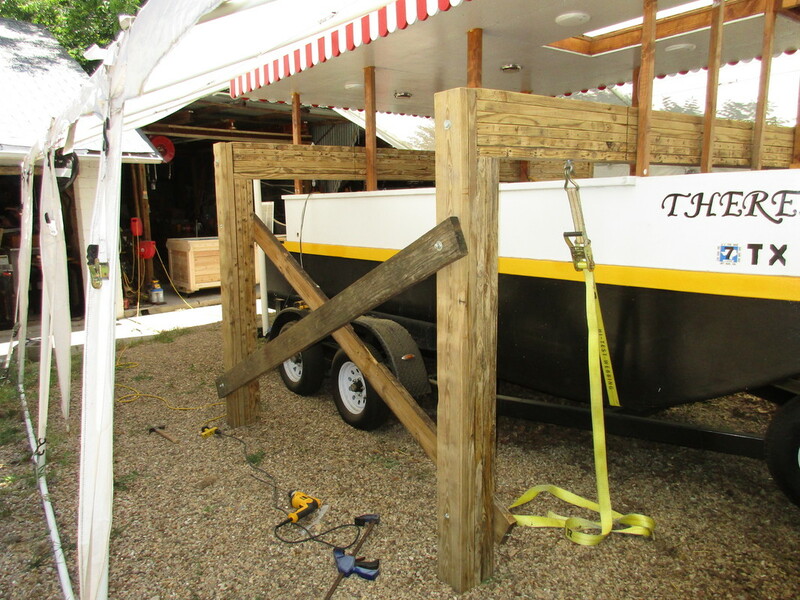 Then using jacks to lift the boat off the trailer. 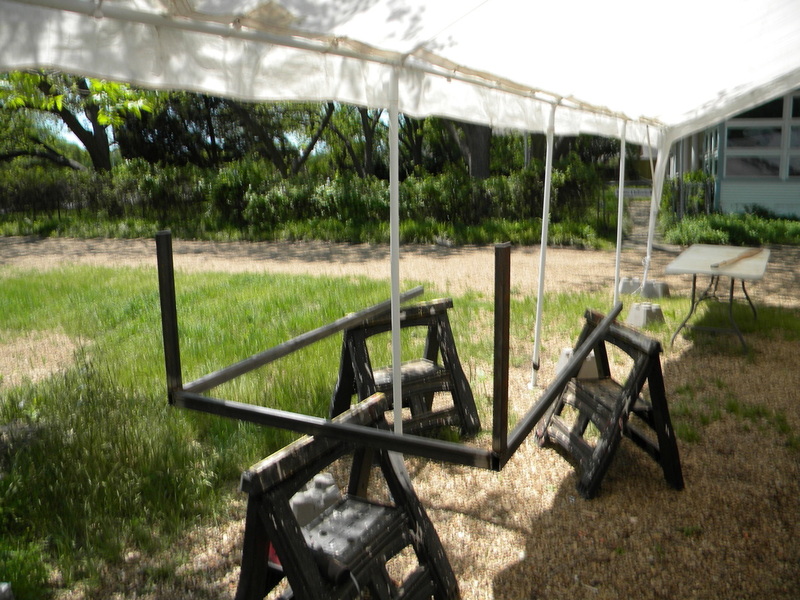 Place supports at the ends of the beams and then remove the jacks. This should allow me to drive my trailer out from under the boat. I know the spacing between the boat and the trailer are not to scale. With enough bracing I can just leave the boat on the beams to be able to work on it. 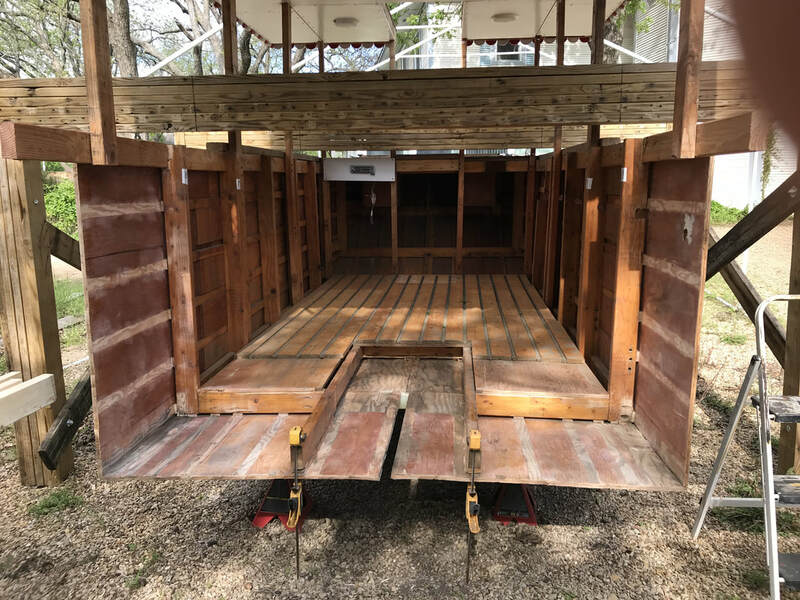 As you can see the bottom of the boat is longer and therefore I can lengthen my trailer to support all of the boats wieght, before the end of the trailer only went as far as the aft of the main cabin. 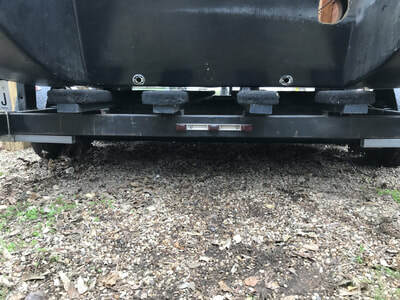 This will also increase the saftey factor of other drivers seeing my trailers brake lights. It will also require me to move my tandem axle further back. Also started the demolition of the aft sectio of the boat. 11/25/2016 Been working on drawing for modification using Auto Cad. Plan on starting on modification sometime next year. 10/31/2016 Was a great day on the lake. Took my son and his girlfriend out. Realised that I have maxed out the efficency of the motor. 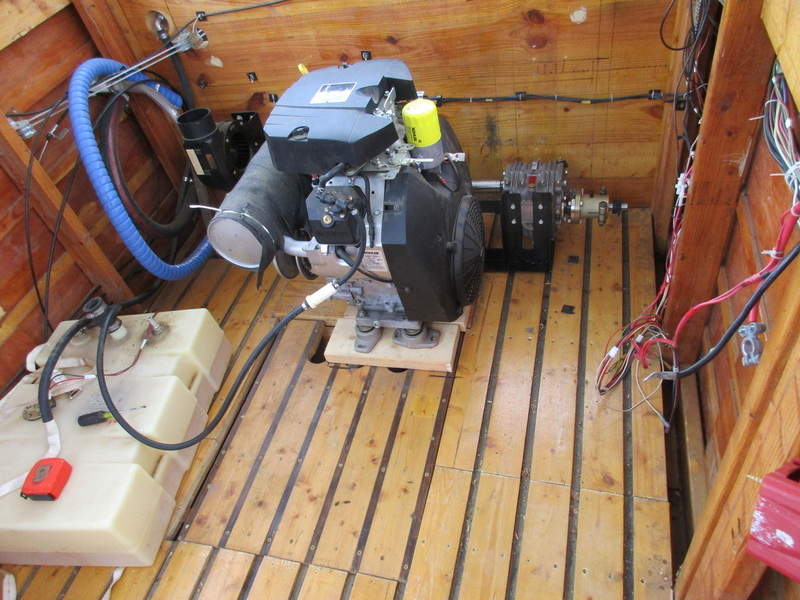 I can not get any more power and speed from the engine, and so the boat will only go about 10 knots. Therefore I will start looking for another engine upgrade, but will have to wait till I can fit it in my budget. I can still go ahead and start tweeking the rudder system to get better response though. 10/27/2016 Ok, replaced the 112 with the 80 tooth gear and was not happy with the results. The 112 tooth gear is way faster. Also the damn public ramp was closed off...permanently. Some development bought the entire area and so had to find a new ramp. On a plus side, gave my wife my camera and so too some nice shots and movies. But going to wait till I get the 112 gear back on and have her take some then. Also had two passengers for first time, my son and a friend. 10/21/2016 This was the best run EVER! 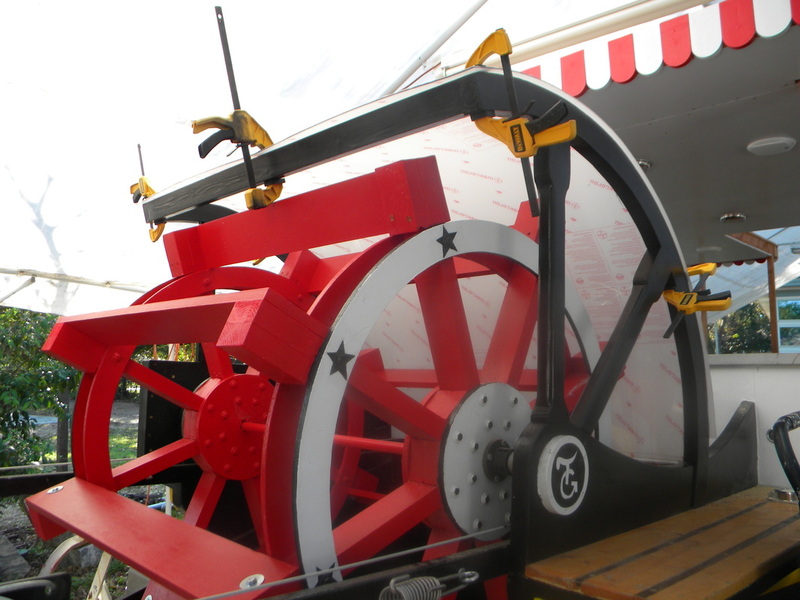 Even though the wheel turned slower, then engine was able to transfer all the power to the wheel and the boat actually went faster than last time...and this was against the wind. Now we just have to figure out the correct gear ratio to get the most out of the engine per speed versus power. There are still the 70, 80, and 90 tooth gears I can use. Going to buy the 80 which is midway and see how she does. 10/20 2016 Moved the engine forward one inch to take up the slack in the belt between the clutch and the torque converter. Ran the engine and found that some of the welds on my gearbox cradle were poor. 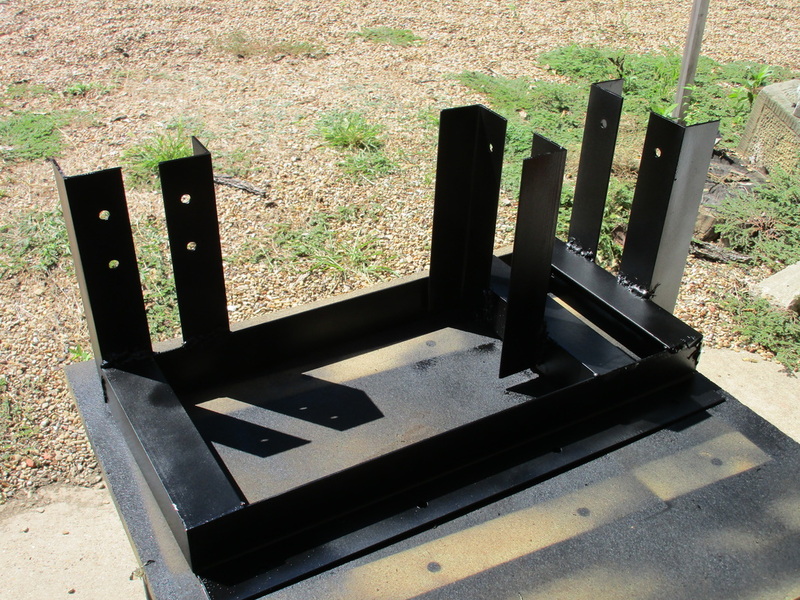 Took entire assembly out and re-welded the bracket. Also added another brace for strength. Also exchanged the 60 tooth gear with a 112 tooth one. Was really planning to buy an 80 or 90 tooth gear, but they were twice the price. Plan on taking the boat out tomorrow morning for another trail run. Last time was the first time we had actually ran the engine under load for more than 30 minutes, which had the engine heat up enough to melt the rubber ehaust tube, which was rated to more than 250 degrees. So as we decide the final location of the engine, we plan to roiute the exhaust up through the roof and have a smoke stack. 10/06/2016 Boat worked even better than before. Was even able to play around doing a few circles this time. Paddle wheel still does not turn as fast as it does out of the water, so going to replace the 60 tooth gear with a 112 tooth gear. This should give the following rpm: At 2200 rpm (when clutch should engage)- output of 40 rpm, 2800 rpm (max rated for torque)- 51 rpm, and at 3300 rpm (max rpm of engine) - 60 rpm. At present with the 60 tooth gear the rpm at 2800 should be 96 rpm, but in video, appears a lot slower. ​Also had a little excitement on the boat, we had a small fire. 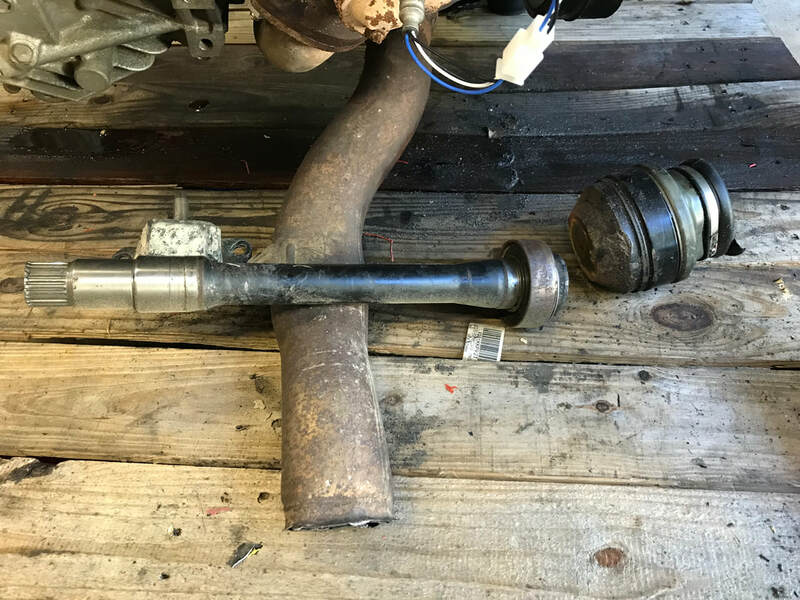 The exhaust tube must have had its heat rating exceeded. Luckily I knew where the extinguisher was. So now I just need to find out what the engine exhaust heat is and get the appropriate exhaust tube for it. But all in all, was a great day for the boat! Although it did not go above 5 knots, it did leave a small wake. ​Boat worked better. Was able to leave and return to trailer under own power. Going to add the 7" paddles back on and waiting for my new 60 tooth gear to arrive to replace the 40 tooth one I have on now. ​Added some welded brackets and gears. 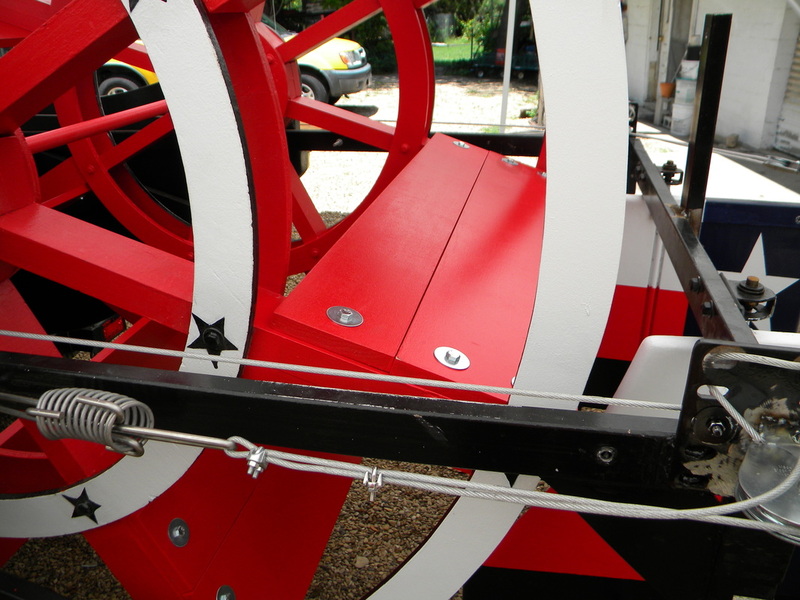 Now paddle wheel has a much lower rpm. Still no power. Nothing smoked or made bad noises, so guess still too much torque for motor to handle. Two ways to go about reducing it. 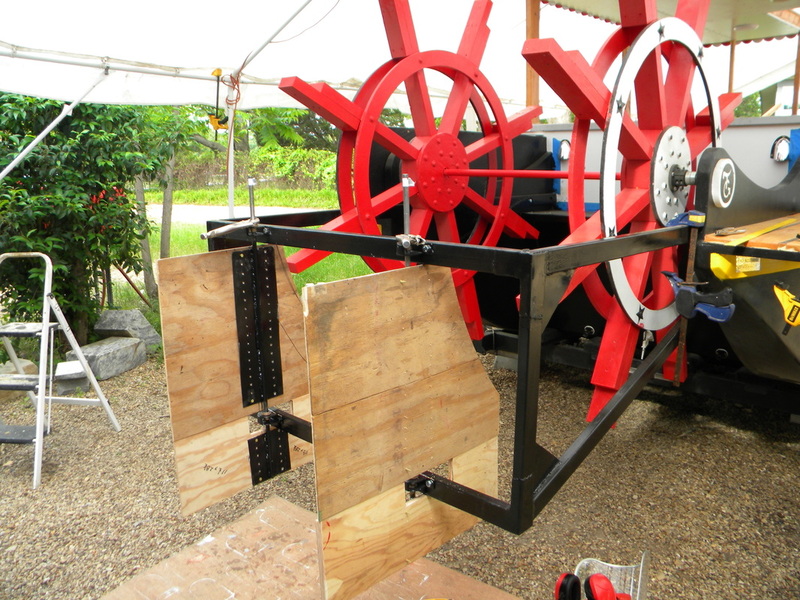 I can shorten the paddles, or add a set of reduction gears. Will go with the reduction gears. Going to add a 40 tooth to a 10 tooth gear set. 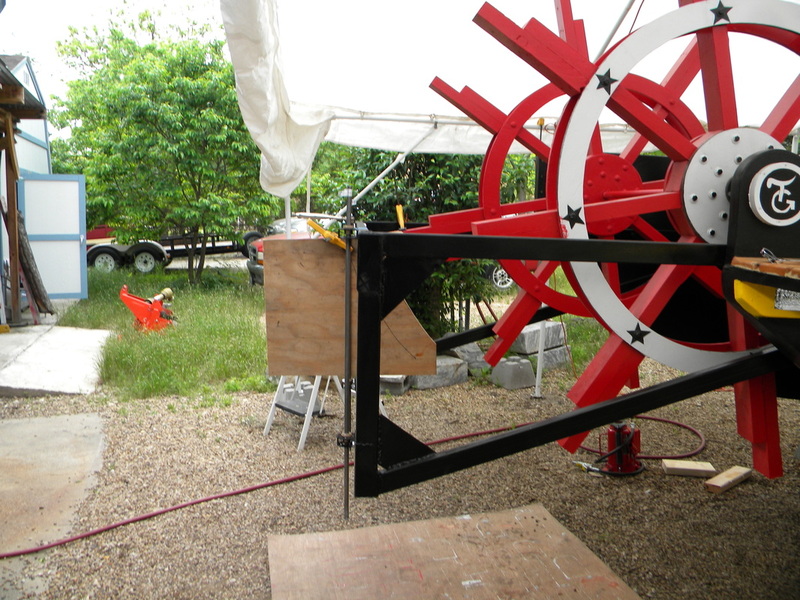 At 2800 rpm and right now have a 40:10 to paddle wheel, so wheel attempts to spin at 700 rpm, but with another 40:10 gear reduction will bring paddle wheel to a 175 rpm. Also think maybe the belt was too slack, so might move engine forward 1". The videos are the engine....while being towed back to trailer. The wind was more powerful than the propulsion. Finally got engine to start. Had to replace battery and fuel filter, but it is running now like a champ. 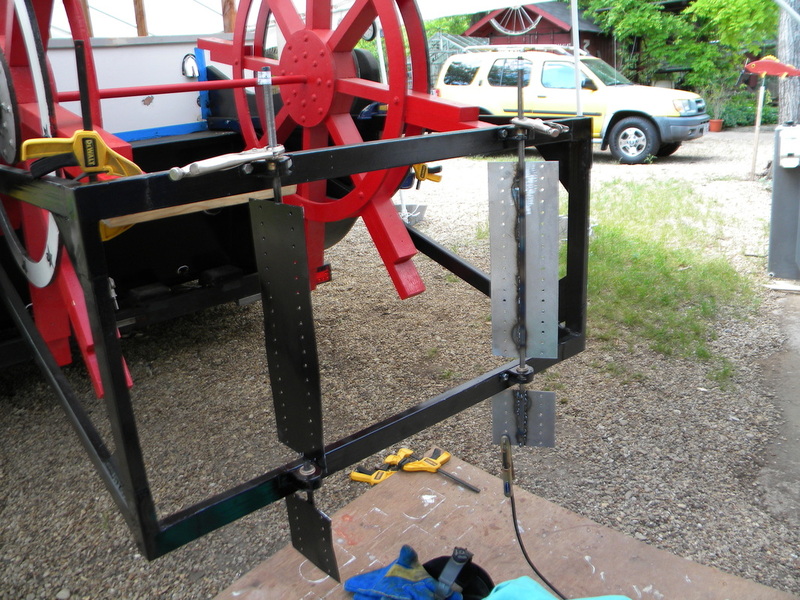 Hooked up all the control cables and the intermediate shaft between the gearbox and the paddle wheel. Now I am cleaning up the boat for a trip tomorrow. Wish me luck! Bought a set of $20 pillow block 1" bearings and they work great. Decided not to permanently place cables and wires till I know that the propulsion system works this time. Been using Amazon to buy my supplies lately, and have bought a lot of HUB CITY products. Added a few more suppliers in my links. ​GOD loves me!. 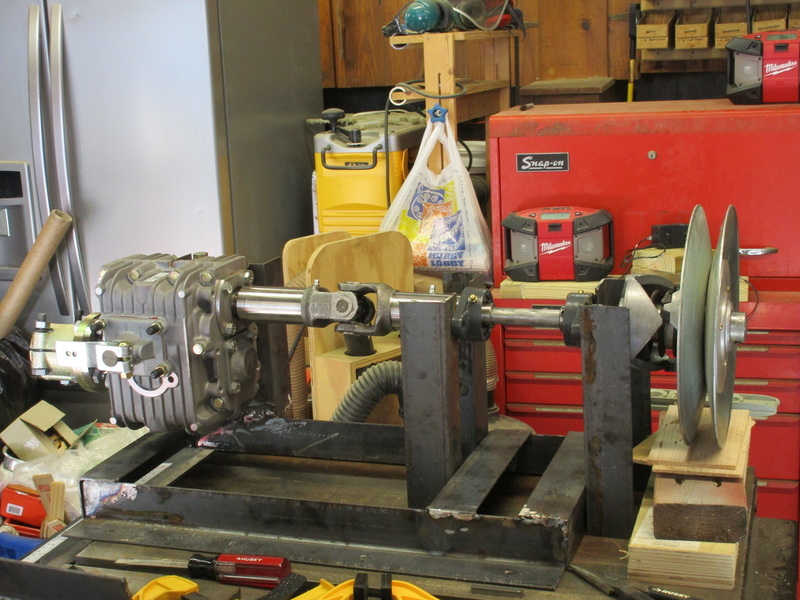 I was initially going to set up the gearbox the same as the old one, which would require me to move the engine over about 1-2 feet. But this would have caused the engine to be way off center line. Then it came to me to just place the gearbox assembly behind the engine and just move the engine forward. Of course this would require me to also rotate the engine 180 degrees. 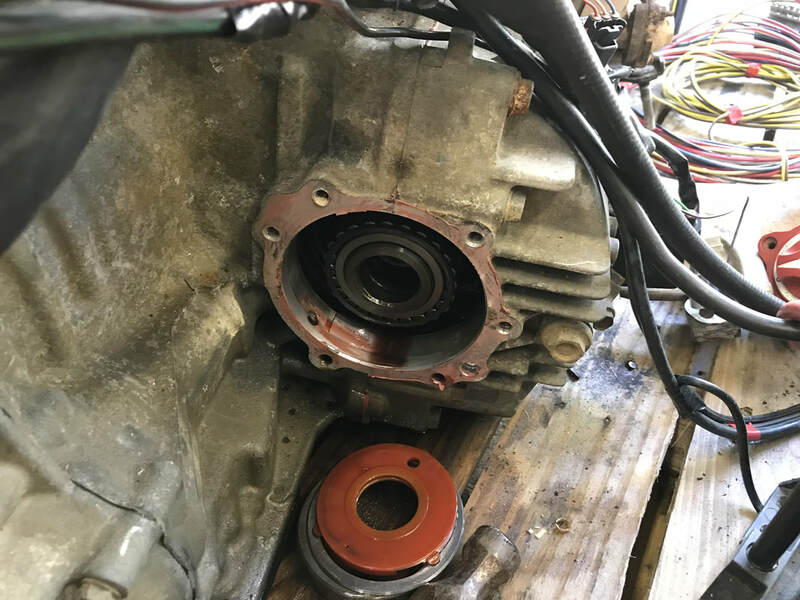 What is great is that the torque converter was already placed on the assembly in the behind the engine direction, so God must have lent a hand. Now I just need to know what the distance was between the driver and the torque converter, and guess what. I had actually written it down in my blog. Yea blog!. To be able to move the engine forward I had to remove the gas tank, which will just be strapped on the aft side out of the way. Luckily the cover of the gas tank fit perfectly in the empty space. If I do this form of propulsion again, I would make it so that the gearbox assembly fastened to the aft wall, and get an engine where the muffler would not be in the way of the belt. Assembly all put together. Now I have to move the motor and install. 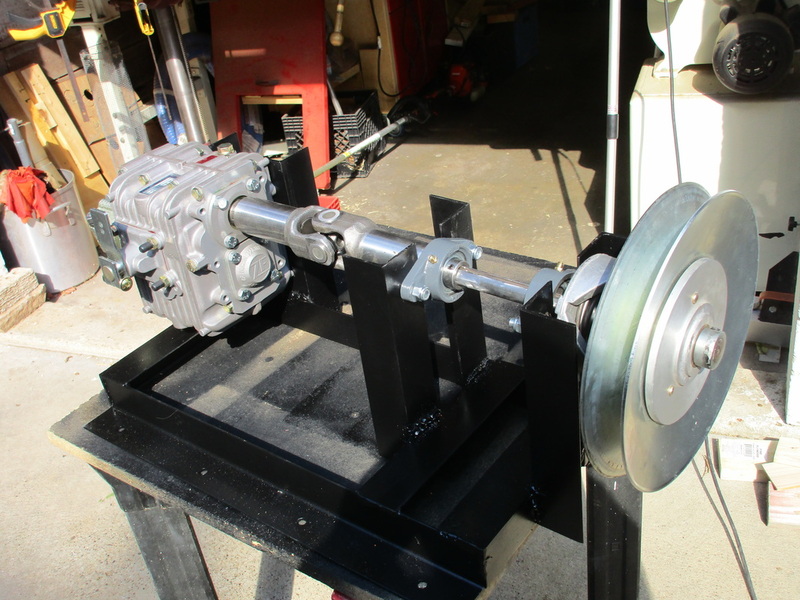 I extended the shaft for the torque converter to stiffen the play due to the yokes. 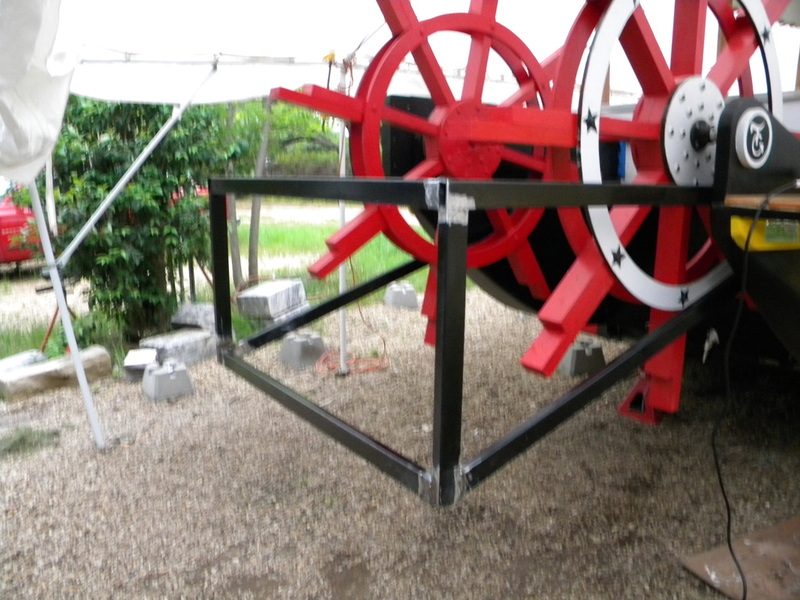 Finished welding the cradle. 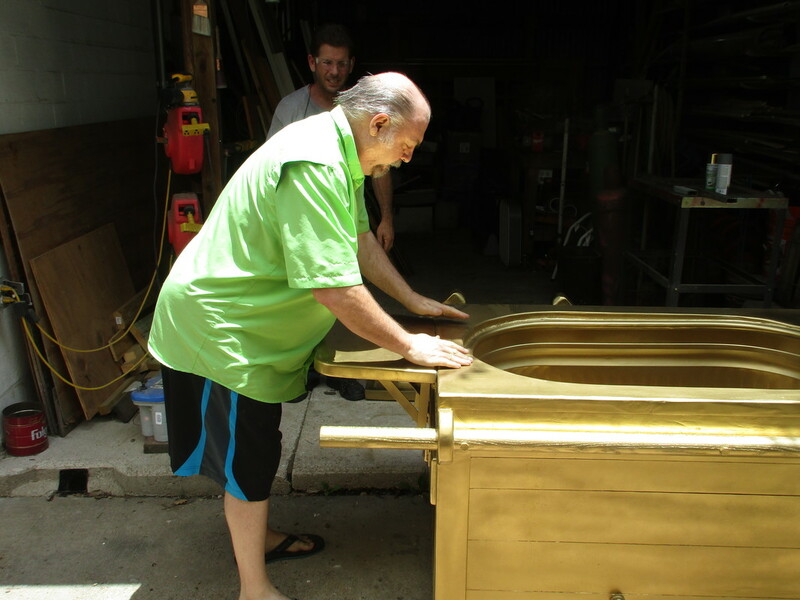 All ready to be painted. 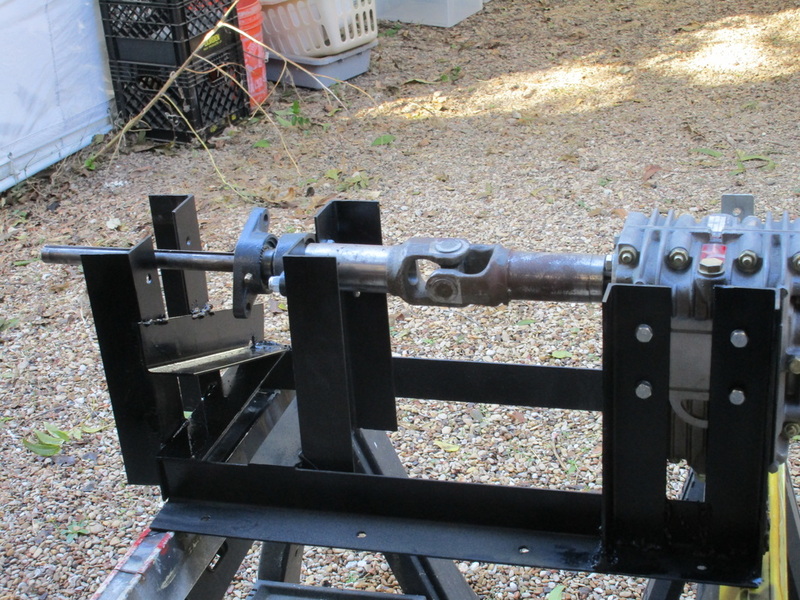 Below are the photos of my concept gearbox alignment, and the almost completed welded cradle. 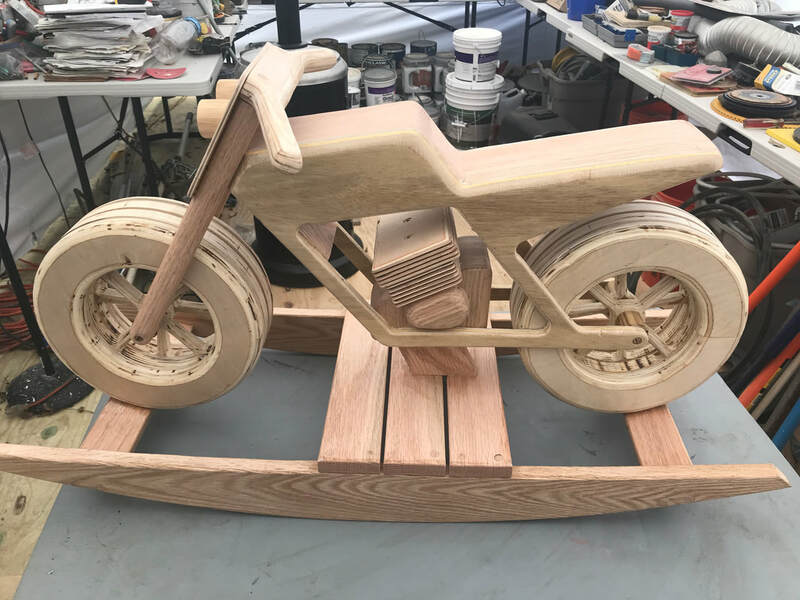 Soon as I finish, will have to move the motor over a foot. Sure wished there was a cheap way to go from a 1 1/8" 10 spline to a 3/4" keyed shaft that only took 4-6" of space. instead of this two foot conversion. Found a pair of jawed couplers, but the splined end was 11 tooth instead of the 10 tooth I needed. Finally found a gearbox that will work. 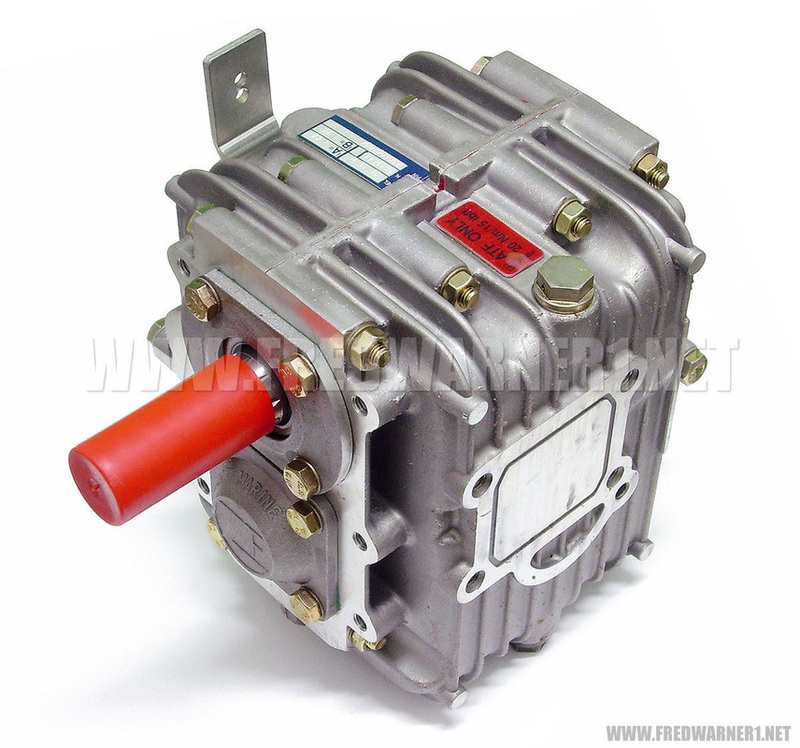 ZF 15 M is a marine boat transmission manual shift gear box. Found best price on eBay. There are several to chose from per your needs, so I suggest you look at the charts to select what will fit your needs. I selected the gearbox that was rated higher than my needs. 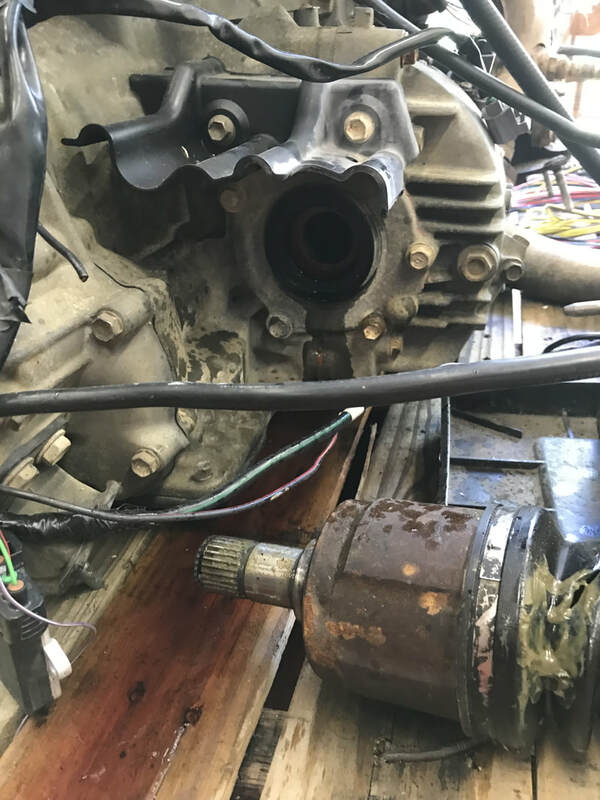 Unfortunately I will have to extend the shaft to be able to use the torque converter, and buy a special connector for the shaft coming out. Also the main drive shift is a 10 tooth splined shaft, so I had to buy a pair of yokes to convert from a 1 1/8" 10T spline to a 1" keyed shaft. Then I needed a sleeve to reduce the shaft to a 3/4" keyed shaft to fit the torque converter I already had. 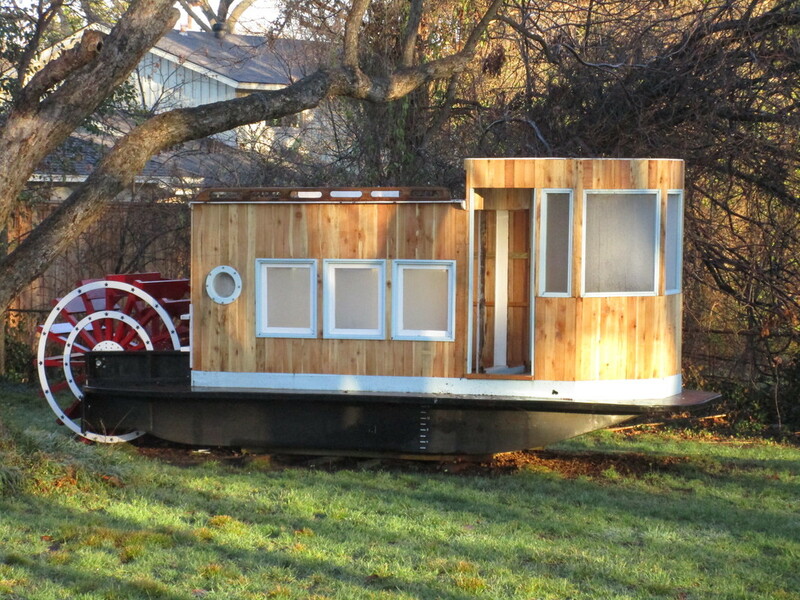 I have not abandoned the boat project, but have been very busy. While discussing my boat, an electrical repairman told me his wife had just retired from a bearing store, and that they sold gearboxes as well. So I am now attempting to find one at Purvis. Cross your fingers that they have one to fit my specs requirements. 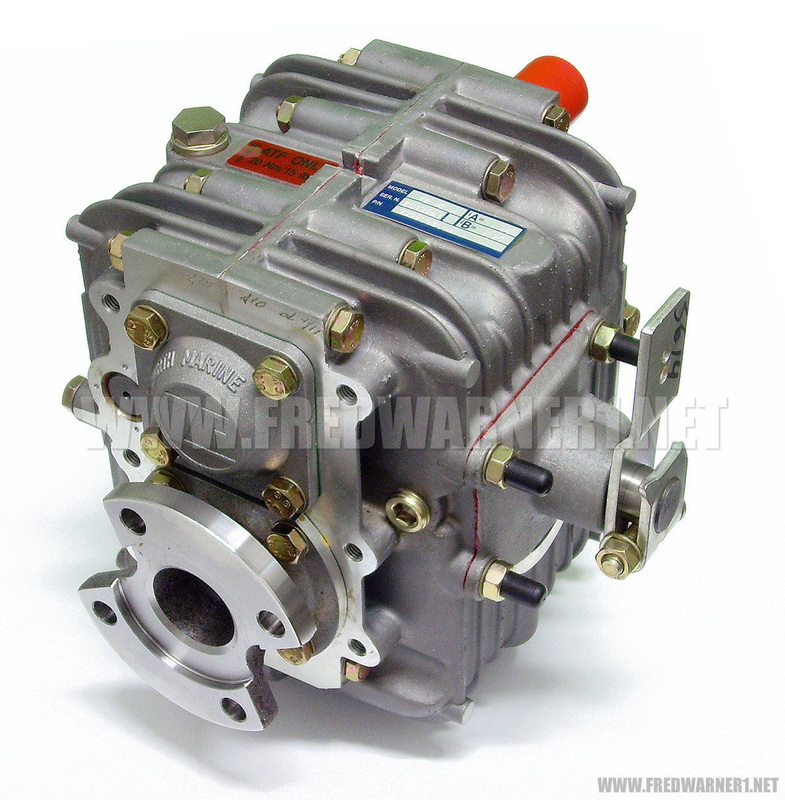 Need a fwd/rev gearbox rated for at least 40 hp, 2800 rpm, and a torque of 60 lbs/ft. Also needs 5.5" long drive shaft of 3/4" dia. with a 1/4" key channel slot. 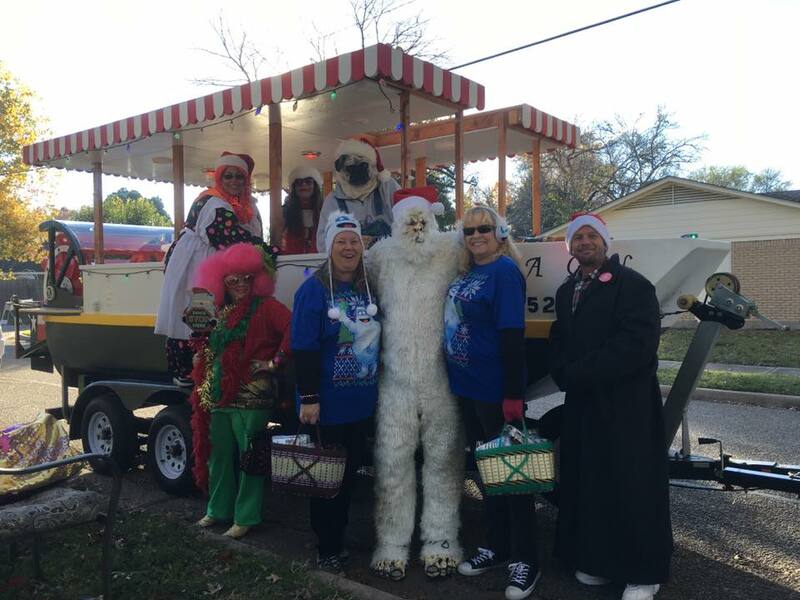 Boat was in the annual Christmas Parade today. Thanks to my family and friends, we had a blast. 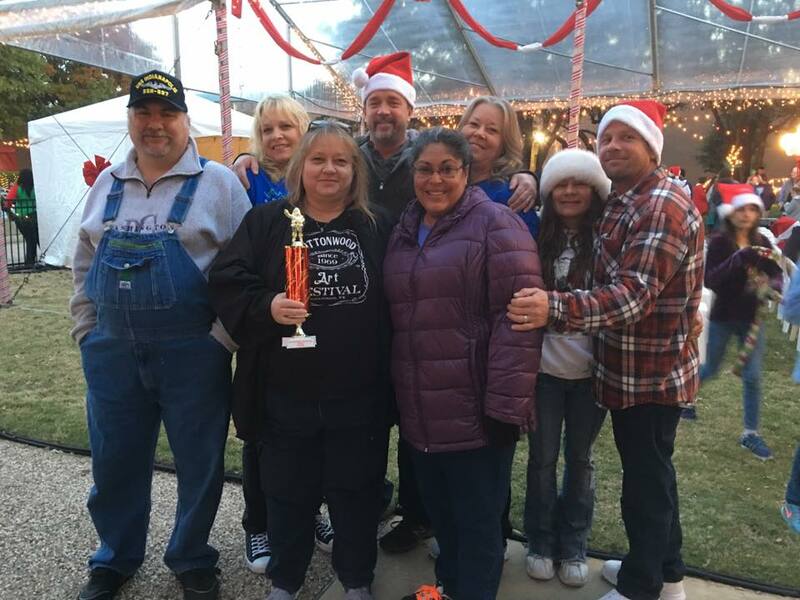 Even won first place in the open adult division. Next plan is to find a gearbox, the one we have definitely has a stripped forward gear. I have to laugh. Took boat out today, and clear water shield worked perfectly. Unfortunately we had trouble with the gearbox. While trying to order a new one, I read the specs, and found it is rated only up to 16 hp. Now shopping for a gearbox rated higher, but now that I think about it, this will be the last part of the propulsion that has not been upgraded. I might even look for an automatic transmission. Setting up to take boat out again this Wednesday. Have new Plexiglas shield in place. Wanted shield to be transparent, so I could visually verify rudders turned as I wished. 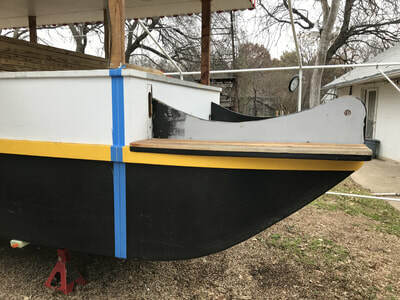 Been trying to finish up work at my son's house, but since I have submitted the Christmas Parade form, I have started to work on boat again. I have a Dec.5 deadline. Well priced the cost of a plexiglass cover and was told something more than $2500, but they could do a different material still clear, but thinner and I would have to have a curved frame for $450. 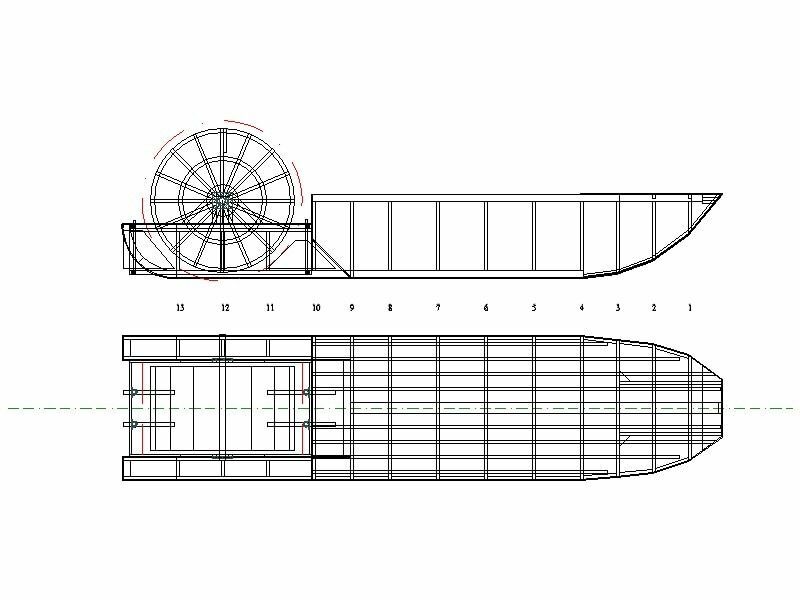 So now designing a curved frame to go on the rear of the boat. Took boat out today. Worked pretty good, but still need a few tweaks. Need to adjust my control cable on the gear box. Had trouble engaging forward. 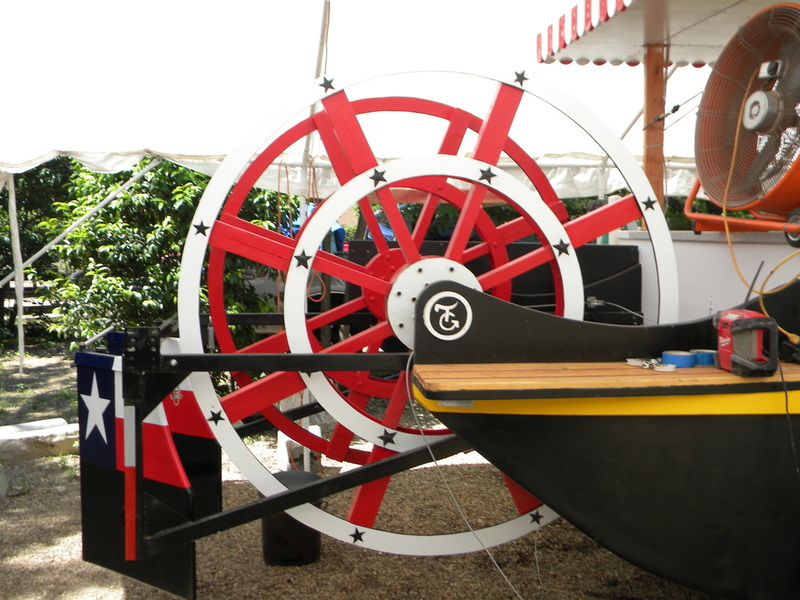 And the second thing I need to add to the boat is a partial skit to cover the paddle wheel...to protect me from all the water the wheel throws. Thank God for my bulge pump, about drowned me when I put in full reverse. Plan to have glass company make me a Plexiglas curved cover that I will bolt onto some stringers to cover the forward part of the wheel. My wife took a small film of me in the lake via her phone. 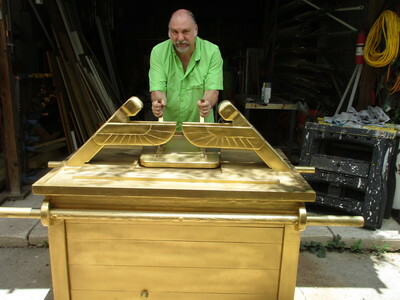 Unfortunately I do not know how to turn it upright. Yea! Finally got to a stopping point in my son's house. Bathrooms and garage all done. Told everyone that this week was to work and play with my boat. Was able to adjust everything to the new snowmobile clutch and driven set. Plan on taking boat out tomorrow morning. Hey all. I have not been on vacation, abandoned my project, nor died, but have been working hard to finish remodeling my son's house. I hope to be finished by October, so then I can again play with my boat. Been doing some more research. My cousin advised I may want to use snowmobile clutches. Thank you Darrel. Found Comet 94c clutch, which is rated for up to 40 hp. Engagement is 1600-4600 rpm, which is great cause the Kohler ch1000 idle speed is 1200 rpm, and max torque is 61 ft-lbs at 2800 rpm Of course I can change out the springs in the clutch to engage at a different rpm if desired. Guesstimating the belt length, was interesting. Finally decided that the diameter of the clutch is 7 1/4" and the drive system top speed will be 1:1, where the belt is at its highest of 71/4 on the driver, so that means the belt will also be the same diameter on the driven. So finding a belt formula on the web and plugging in the distance between centers (I have 9 1/2") gave me a outer circumference on the belt of 41.7" Luckily I found a belt that would fit just right, if all my calculations were right. Cross your fingers. Alrighty then!. Took boat out today and it did work better with a smaller paddle. Where the motor meets the torque requirements, I did not take in what the clutch was rated for. Ate another one. Will have to see what I can find and adjust the paddles further if required. 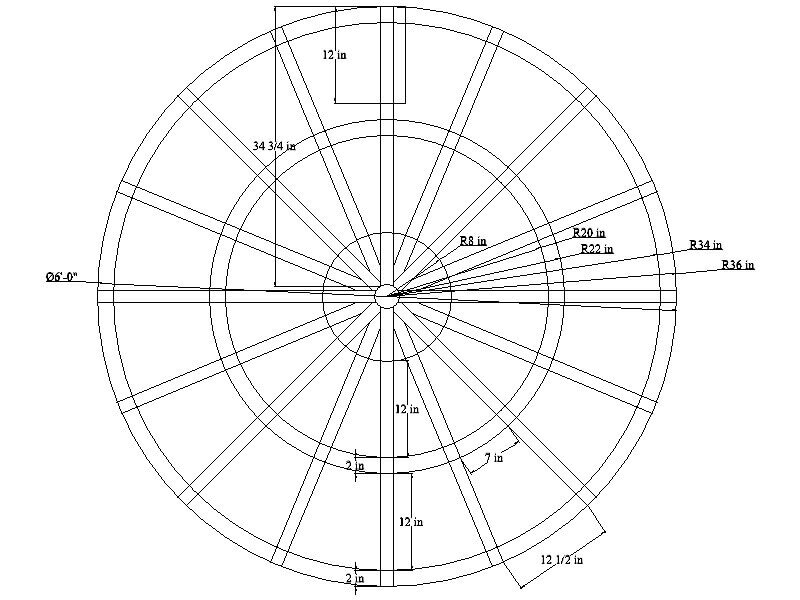 Was doing some more research and found that you could use math to determine the needed torque from an engine to turn the wheel. 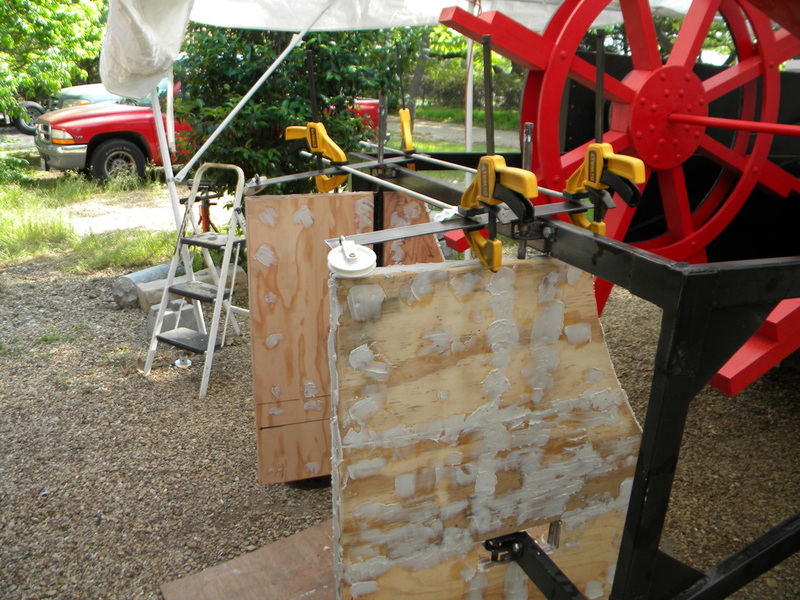 I calculated that a wheel with a radius of 31" and 12" paddles would move 69.3 gal, or 578 lb. Using TurboCAD, I was able to find the area, and then multiply the 39" blade width to get the 16,000 cubic inch volume of water. 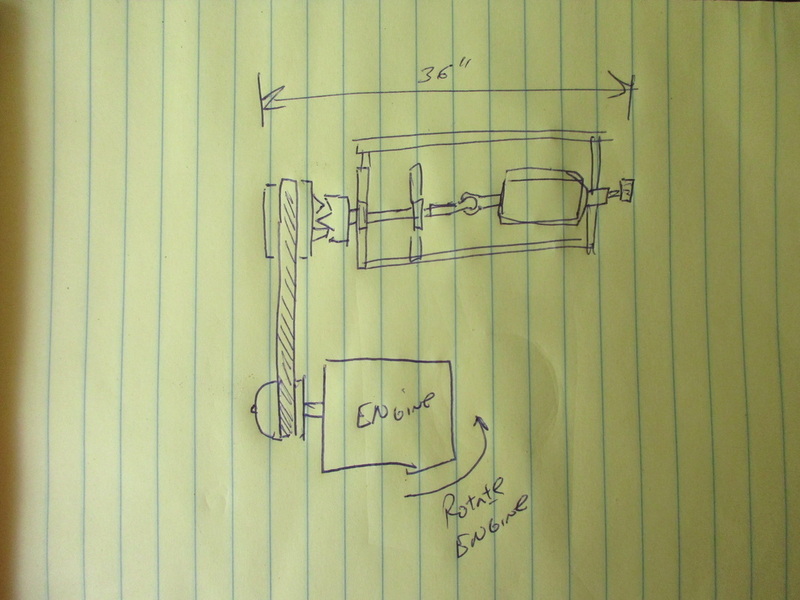 Then divide by 4 (40:10 gear ratio of the drive chain) I would need an engine with a torque of about 145 lb. No wonder my Honda with only 35.6 lb torque nor my Kohler with an impressive 61.5 lb torque were very much overworked. Keeping the top of the paddle blades just above the waterline, a 5" blade will push 17 gal, or 140.9 lbs of water needing a torque of 35.3 lb, which would mean I could then use my Honda motor. 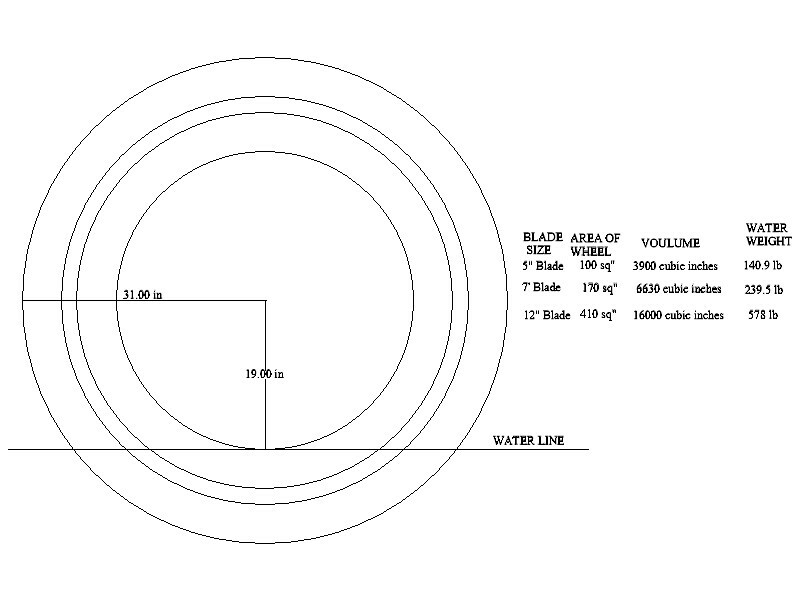 But since the Kohler is already installed, I want to calculate the size of paddle blade to use. The Kohler has a torque of 61.5, times 4 for the ratio, pushing 246 lb. Now I just need to determine the volume that matches up to 246 lb. 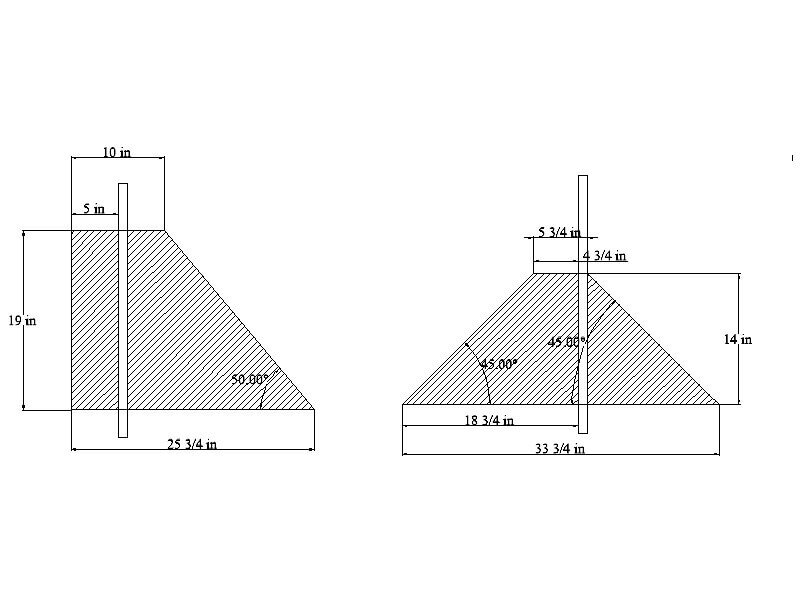 Playing with TurboCad, I found that a blade of 7" would give a volume of 28.7 gal, or 239.5 lb. Perfect! 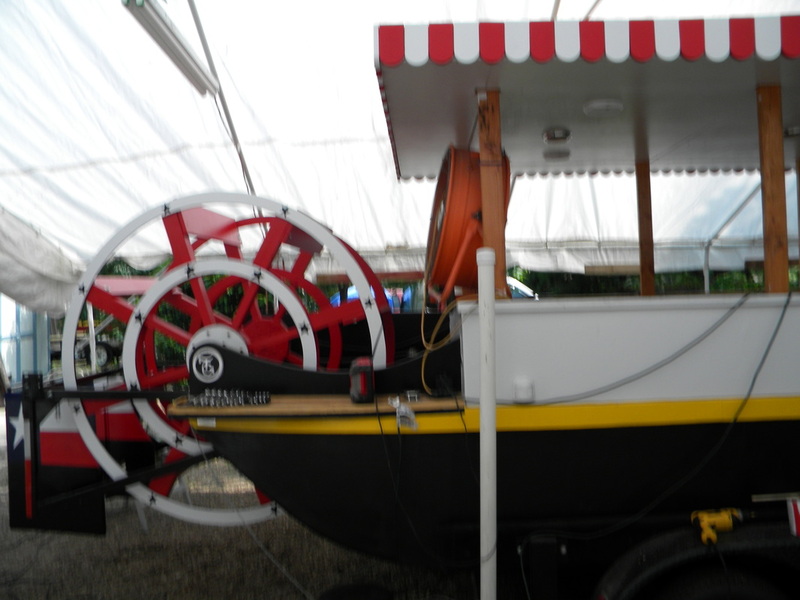 Which is about what I had on the boat before I enlarged the paddle wheel. 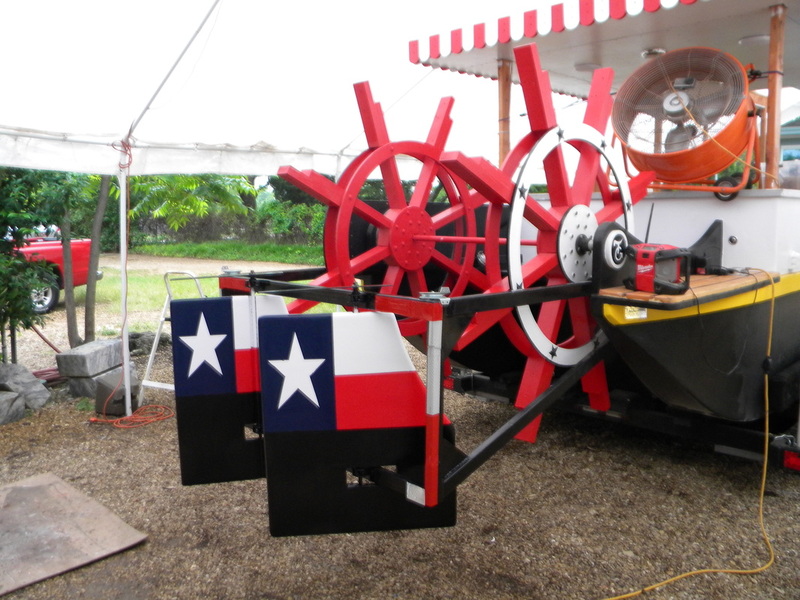 So it means that if I had taken in the extra weight of the rudder supports and the larger engine into my calculations, and realized the water level would be higher on the boat, then I would not have had to enlarge the paddle wheel to have the blade be in the water. So if I had left the wheel alone, I would be touring the lake months ago. Was planning to take the boat out today, but found out that not only did the engine eat the belt, but had melted the clutch. Have to wait for part to come in. Lakes still high, so have that going for us. Got new belts in, readjusted paddles. All ready to go back into the water but..... My son bought a new house and we need to update it for the loan to go completely through. So will be busy for next two weeks. Well took the boat out to the lake today. The rudders worked great! The boat responded well and quickly to the rudders even at a low speed. Unfortunately I did not take in the added weight of the rudders and their supports, nor the larger engine. Motor worked so hard to turn wheel, that it ate the belt, and left me in the middle of the bay. 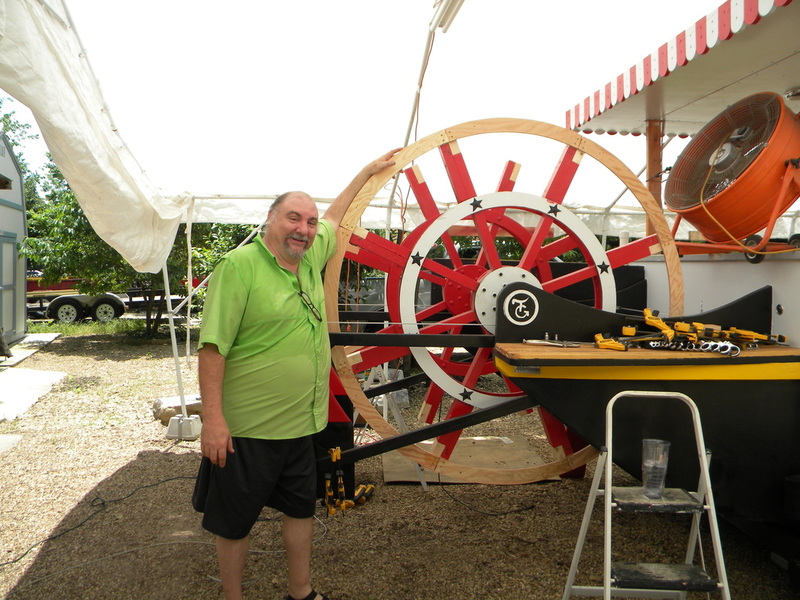 Started to paddle back with an oar, when I decided to attempt just using the paddle wheel by hand. 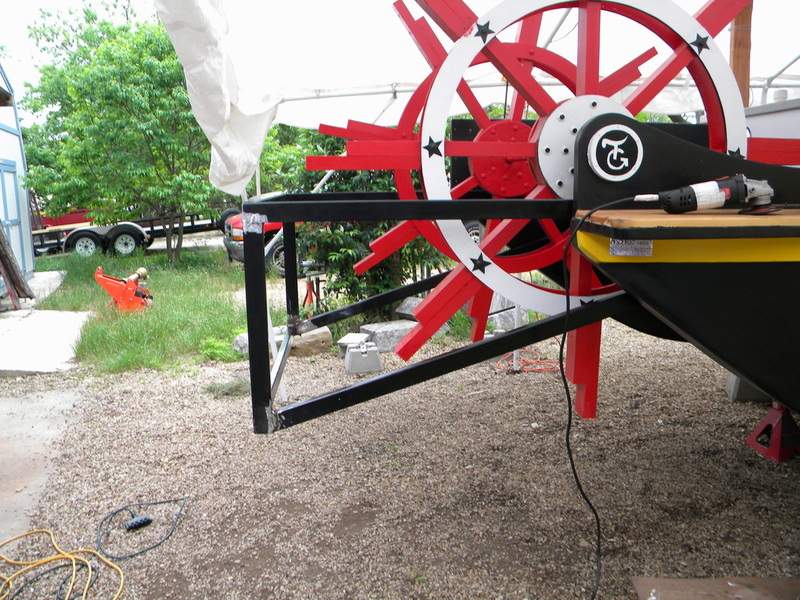 Was able to rotate the wheel about as fast as the motor did, and got back to the trailer. Next project, I might include a section where I can insert a handle and crank myself back to shore. Not sure where my brain was. I painted the rudders where I thought the waterline might be with all this added weight or larger engine and rudder supports. Funny thing was I was real close to where the waterline really was. 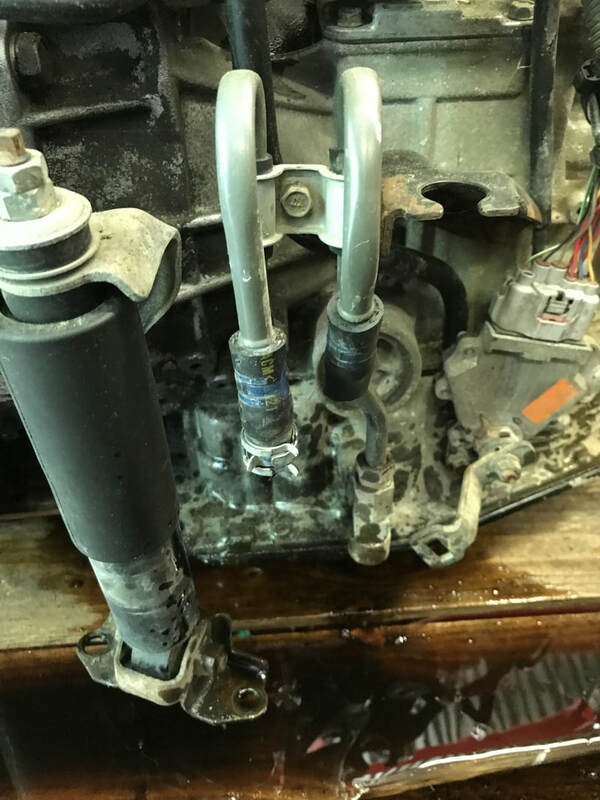 Unfortunately I did not think about how much water the engine would be pushing if that was where the waterline would be. Now that I know, I need to reduce the size of the paddles, back to the original size. I started thinking that I might want to added an extra piece to the paddle to prevent water from flowing over the paddle. So I went ahead and added a piece. Paddles are attached! Now just need to finish setting up running cables for rudders. Got the outer ring all painted nice and pretty. Even added the stars as the finishing touch. 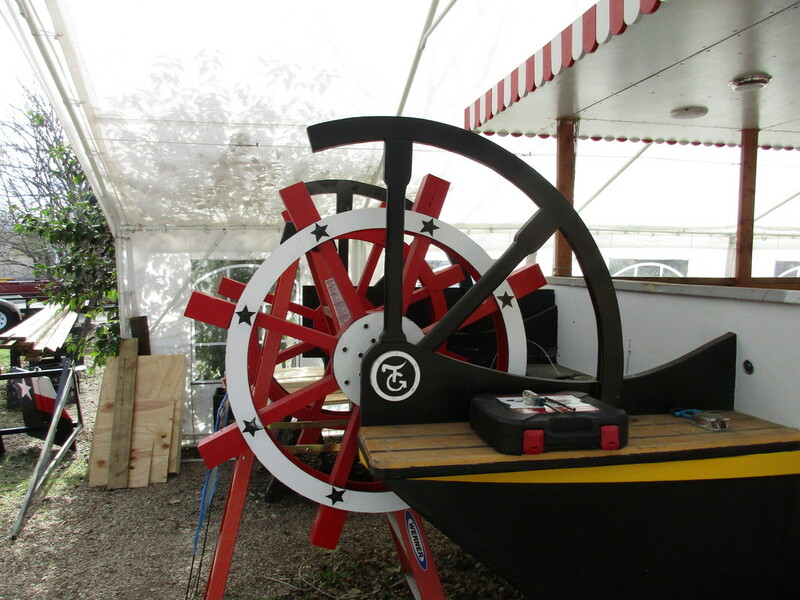 The outer circle doesn't really increase the paddle wheel more than 1/4", but it sure gives the illusion that it is larger. Since I am now going to place the paddles on the correct side of the spokes, I needed to fill in the gaps. Had to move the tie rods and reinforce the rudder. 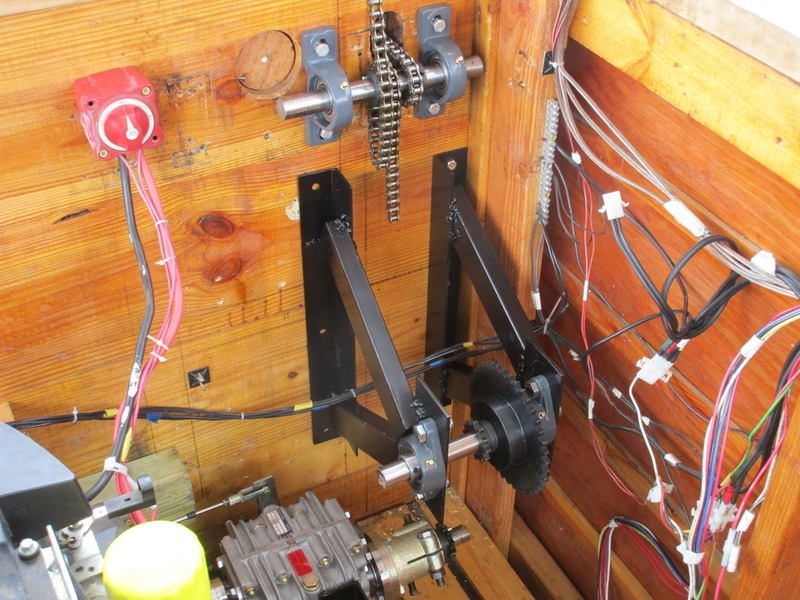 The stress of pulling on the rudder caused it to bow, so I place a metal cap, and moved the tie rod above the pulleys. This way the stress is directly placed on the tie rod. I also reduced the steering cable to allow a more easier bending around the pulleys. Unfortunately after testing, I now found the plastic pulleys on the rudder (the only ones that are still plastic) would warp under the strain. So I am waiting for new parts to be delivered. 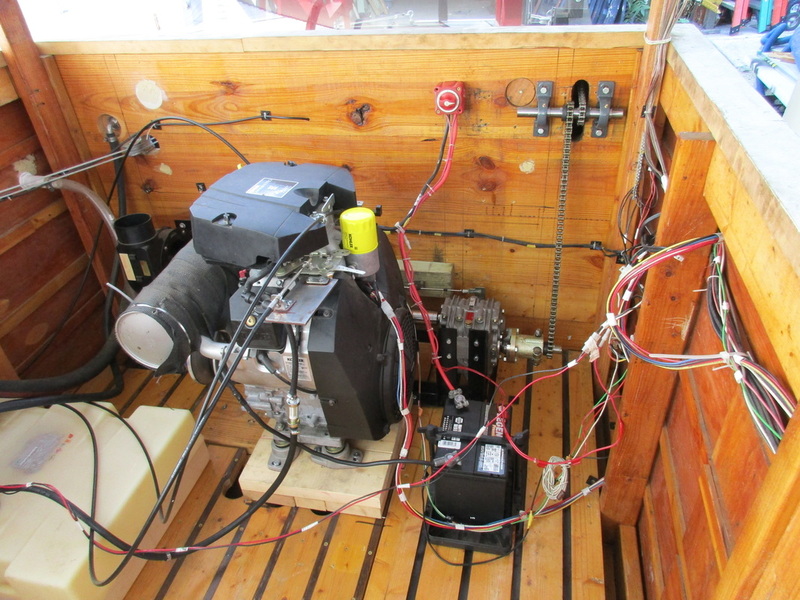 Still working on boat, but having trouble with running cables for rudders. It seems there is still slack when the rudders are turned to their extreme.Starting to think maybe the springs I am using do not take up enough slack. 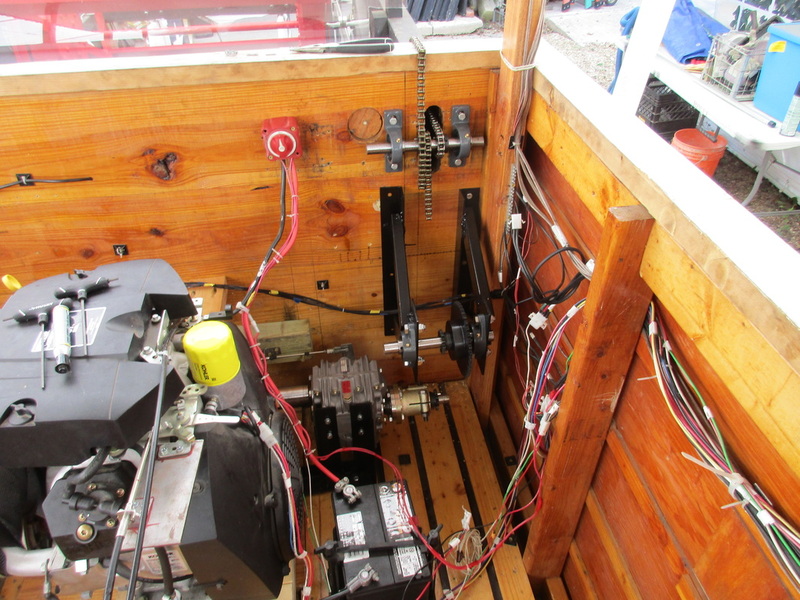 But on a positive note: all electrical is completed, and engine can now be started from captain's seat. 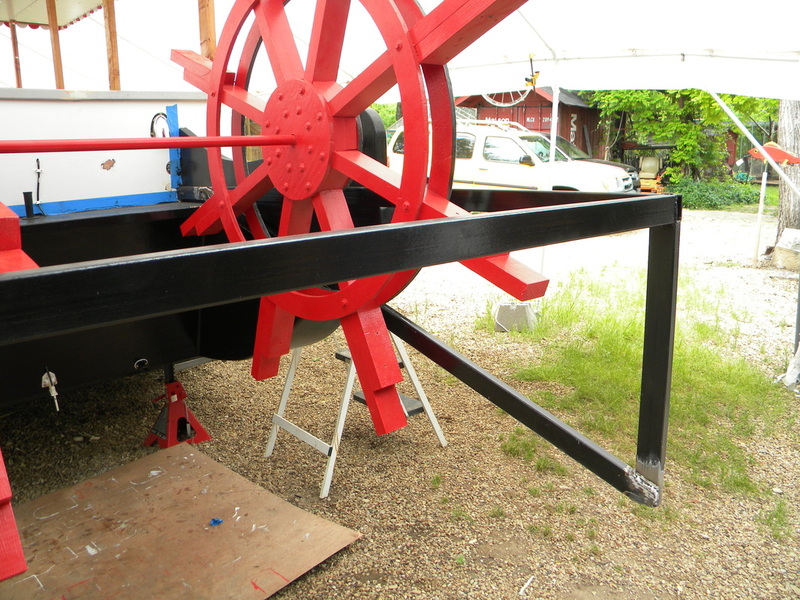 After looking at old boat, have decided to add a n outer ring on the paddle wheel. Makes it appear larger without actually adding any length. My tie rods from McMaster arrived. Now the rudders will turn in unison. 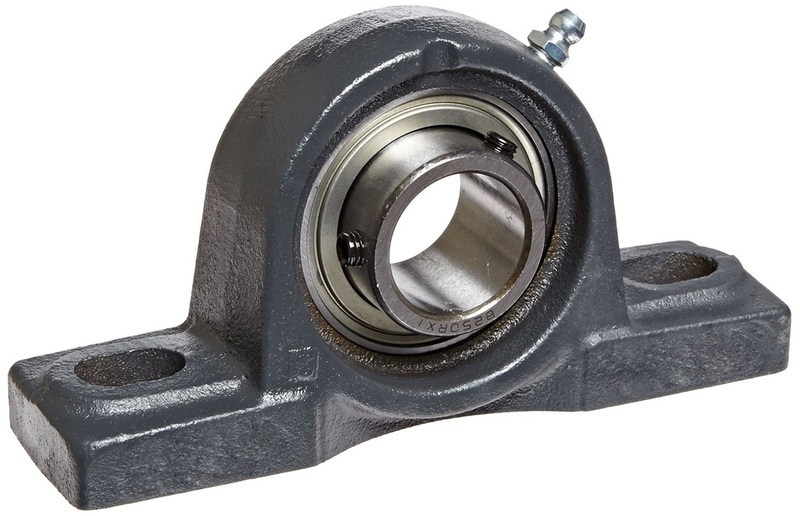 Tie rods consist of a left and a right thread eye-bolt with bearing insert, and the tie rod itself, which has left and right threaded ends. I only had to place a nut on the right thread side to ensure no slippage. Here is the finished rudders. 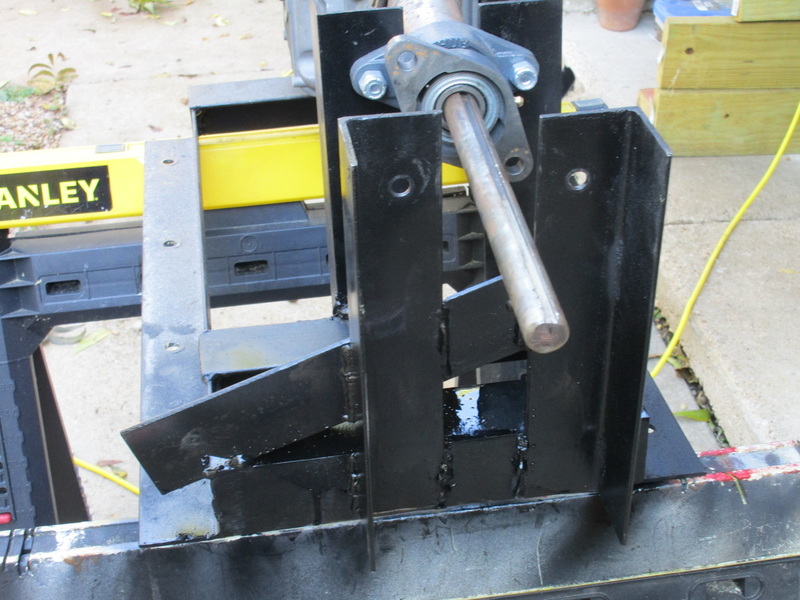 I have also welded on the rudder steering arms, and just waiting for the tie bars to be delivered. You ca also see the reflecting tape on the rear of the frame. 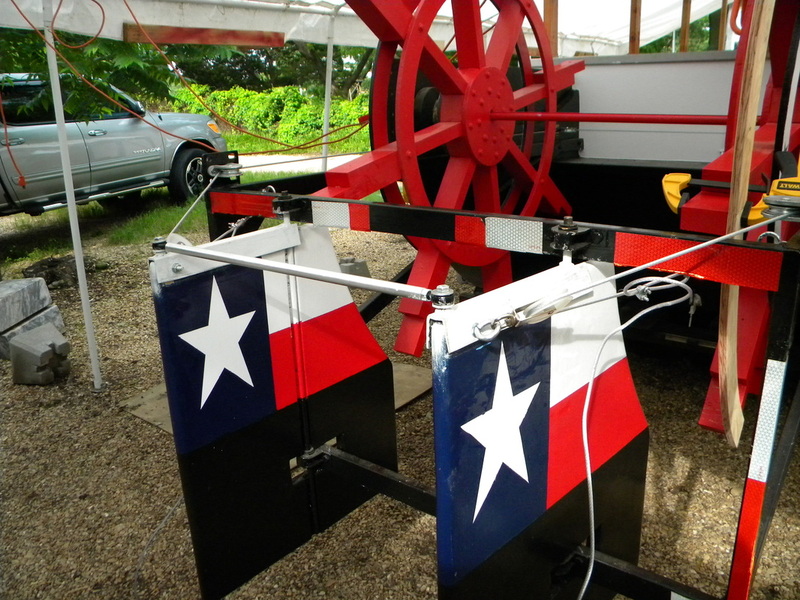 Added just a touch of style, with my rudders sporting the Texas Flag. Got the rudders primed, but having to wait a few days for the paint to cure. Been rainy last few days. Been trying to wire new engine up, but seem to be having some troubles. 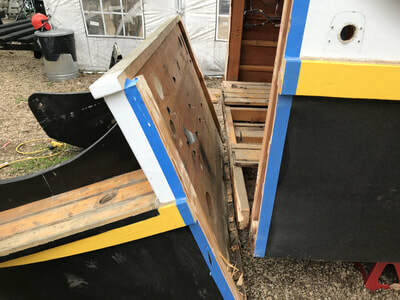 Rudders installed, and now just to fill in voids with resin putty, sand, lay two layers of fiberglass tape along the edges, and then we are pretty much done except painting. Test fitting the rudder arms. Going to link them with a pair of tie rods. Have one side of each rudder attached. The center notch is wide enough for good turning of the rudder. 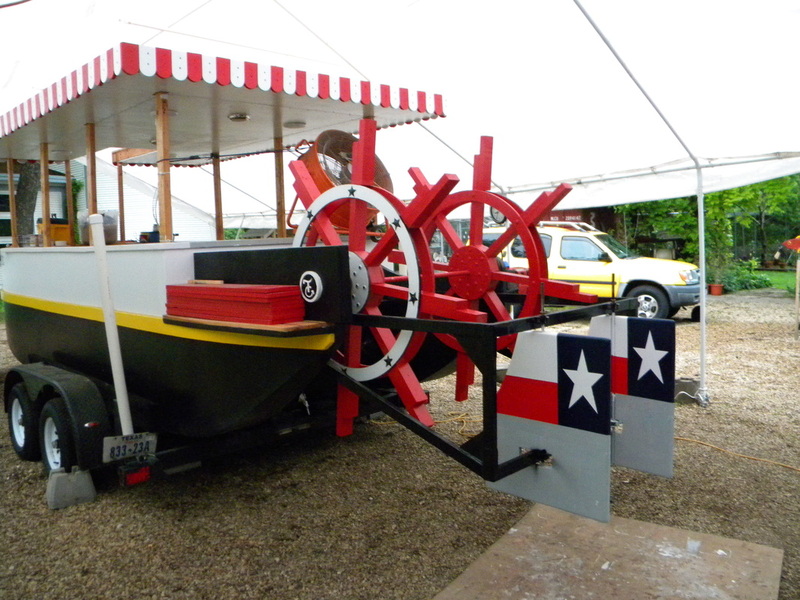 As you can see, the rudders will direct most of the water flow from the paddle wheel. 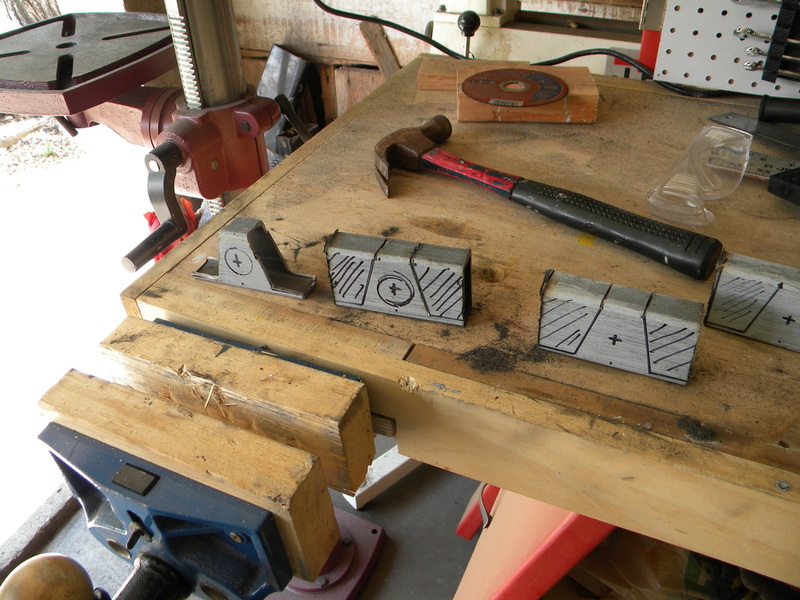 I am sandwiching the attachment plates between sheets of 1/2" plywood. 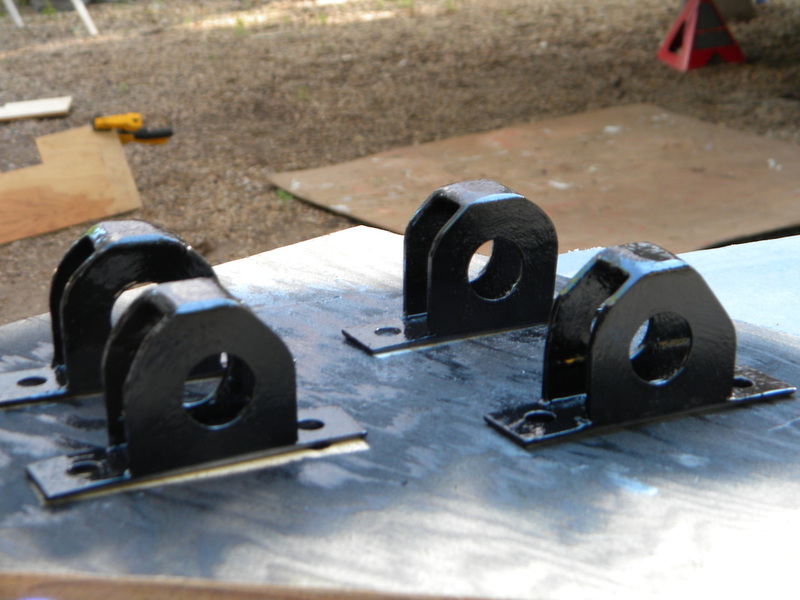 Welded on the rudder attachment plates. 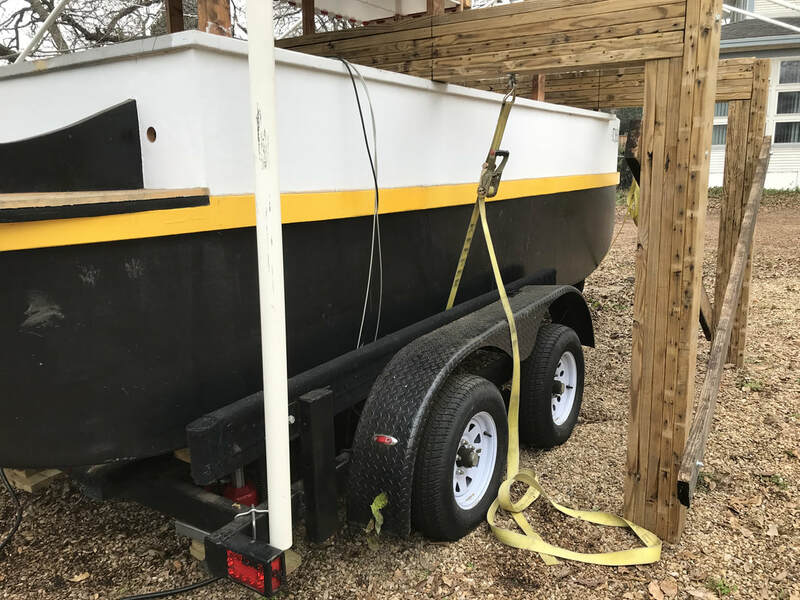 Finally got the boat back onto the trailer. Here you can see the position of the rudders. 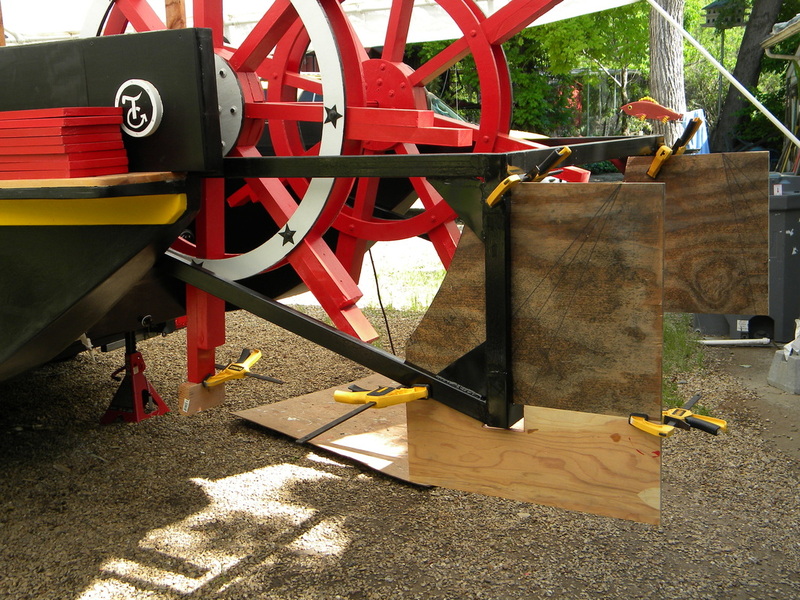 This should direct the flow of water from the paddle wheel, like the steering tube of a jet ski. Test fitting the rudders for position on the frame. After attempting to drill the required hole for the brass bearing, I noticed the thinness of the metal along the sides of the hole. So I decided to remake new brackets. I cut off the corners so the hole in the rudder would be smaller. 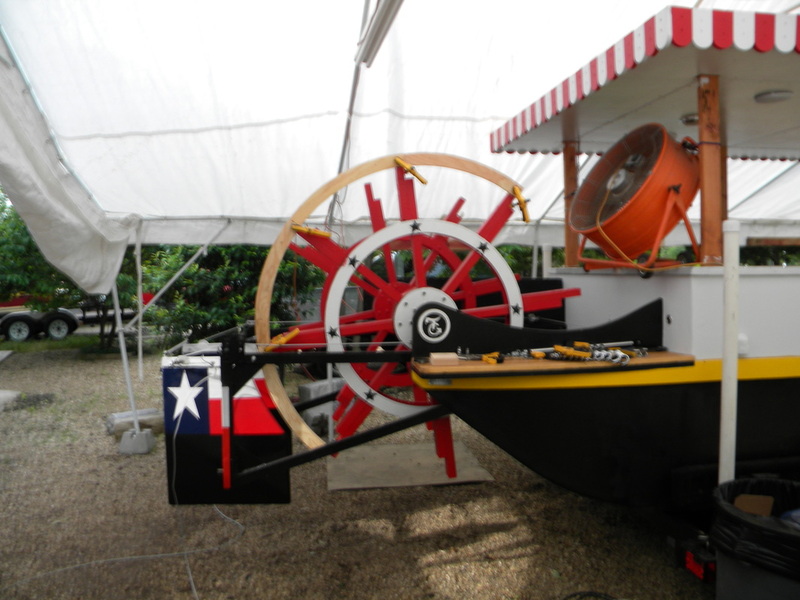 I was test fitting the rudders when I noticed that the paddle wheel went well below the rudder. Then I realized only about 2" of the rudder would actually be in the water. Apparently when I had measured the frame, I was planning on mounting it below the splash guard, but upon testing the tansom, I did not want to cut slots for the brace to poke through. After deciding to mount the brace above the splash guard, I never changed the dimensions of the brace. Luckily I had planned on welding a plate onto the rudder pole to screw the rudder to, so can just extend the pole below the brace and add a second piece to the rudder. 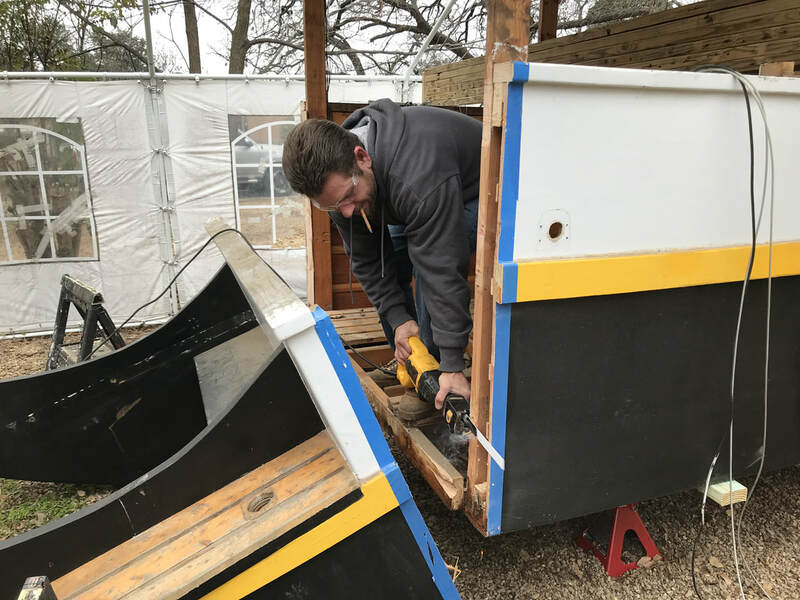 Now the rudder extends to just 1" above the bottom of the boat. 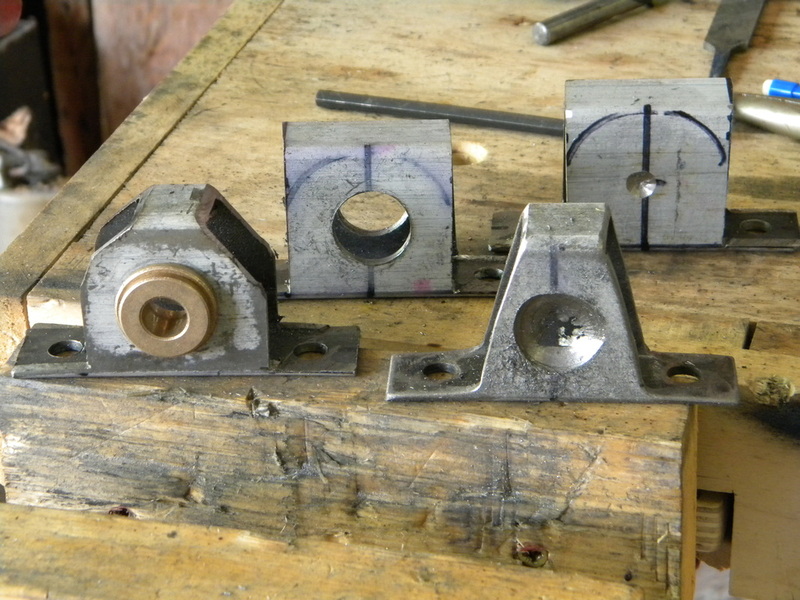 Taking scrape tube stock and making brackets for the rudder. 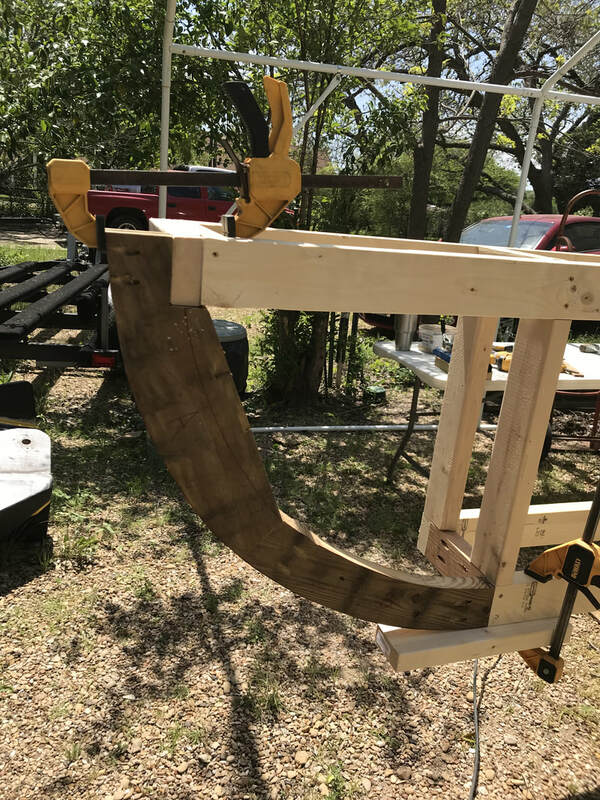 My cousin Darrel had advised me that since the rudder support would be vibrated due to the paddle wheel, that I should also add extra brace brackets as well as the gussets. Finally got the lower brace welded on. 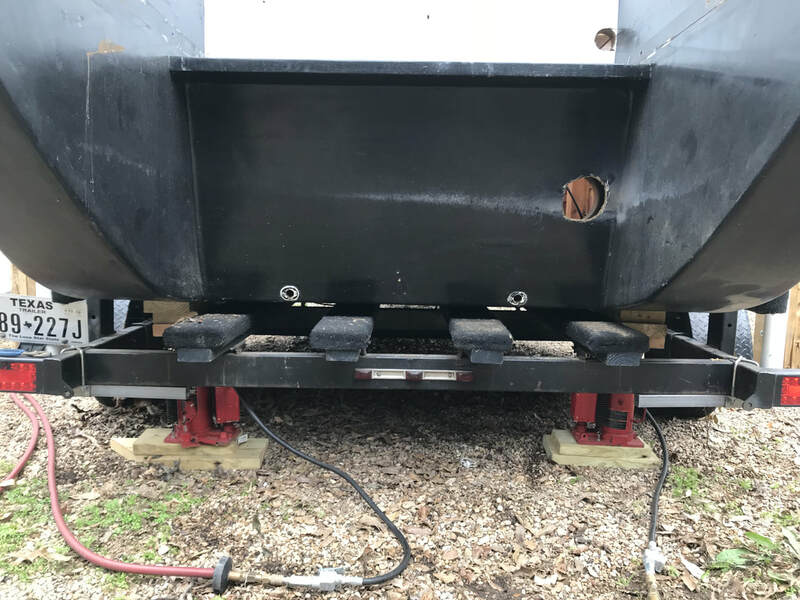 I was going to make the frame square by bolting the lower ends to the bottom of the boat, but my cousin suggested that bolting things below the water line would be asking for trouble later on. 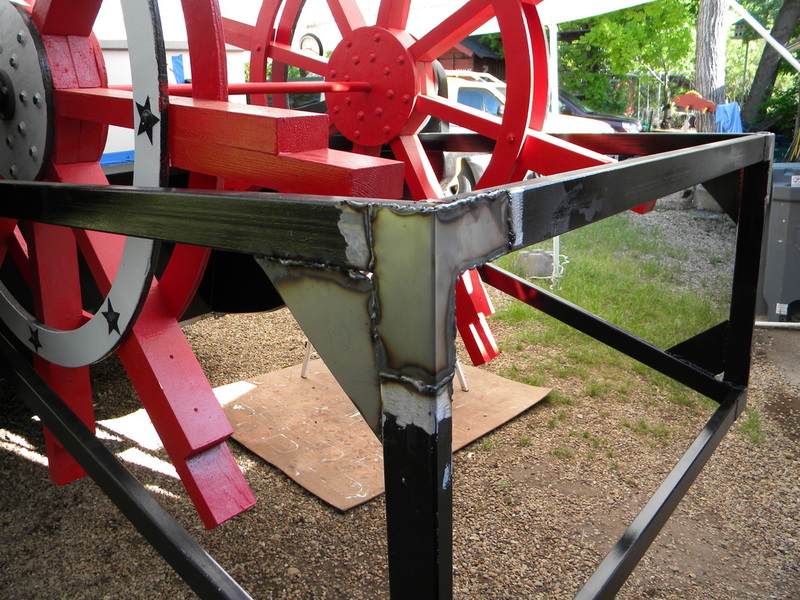 He suggested using an angle brace and then weld on gussets for added strength. Well now all I need is to make the gussets. 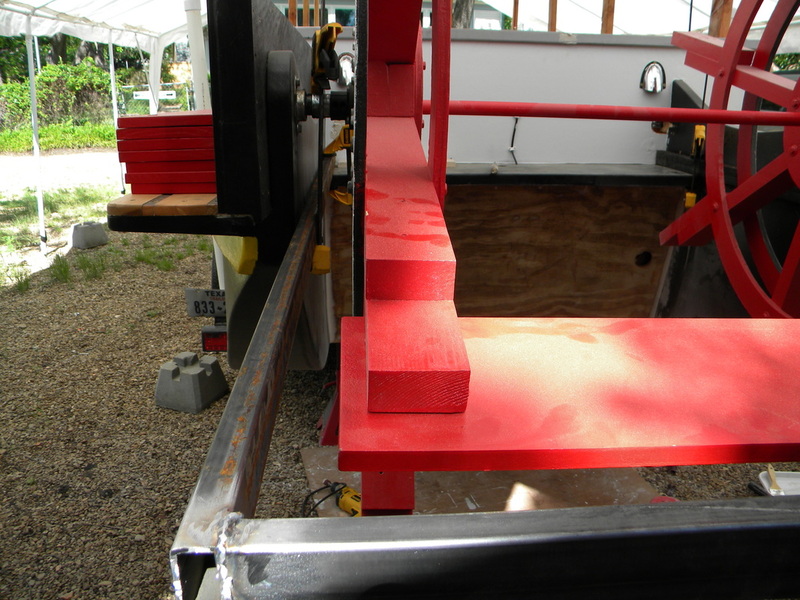 He also suggested I place red reflector tape on the frames back to help motorists stay a safe distance from the boat. 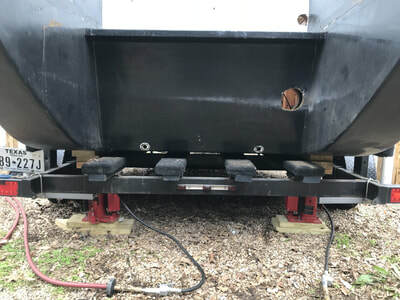 Got the rudders top brace bolted on. Also I have the tansom primed. Got the top rudder brace welded together. 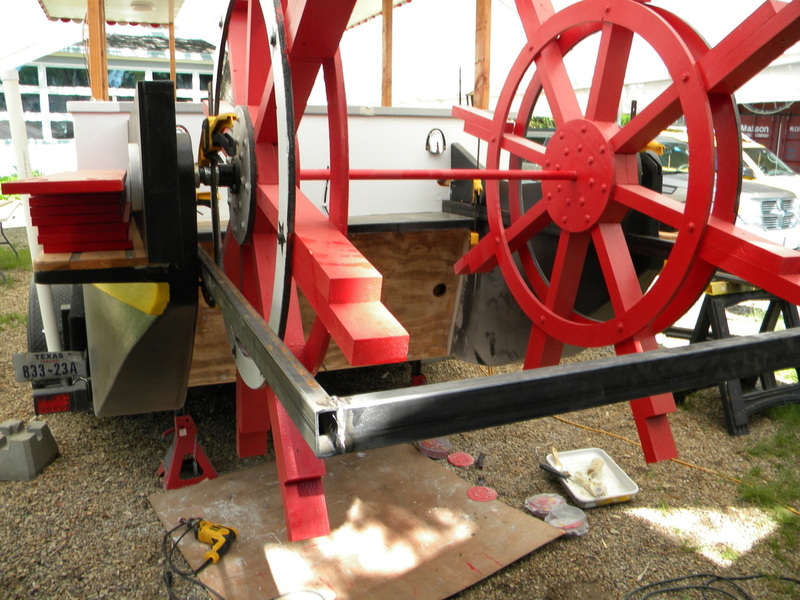 Test fitting it and there is plenty of room to spare between the brace and the paddle wheel. Setting up to prime and paint the brace so it can be mounted. 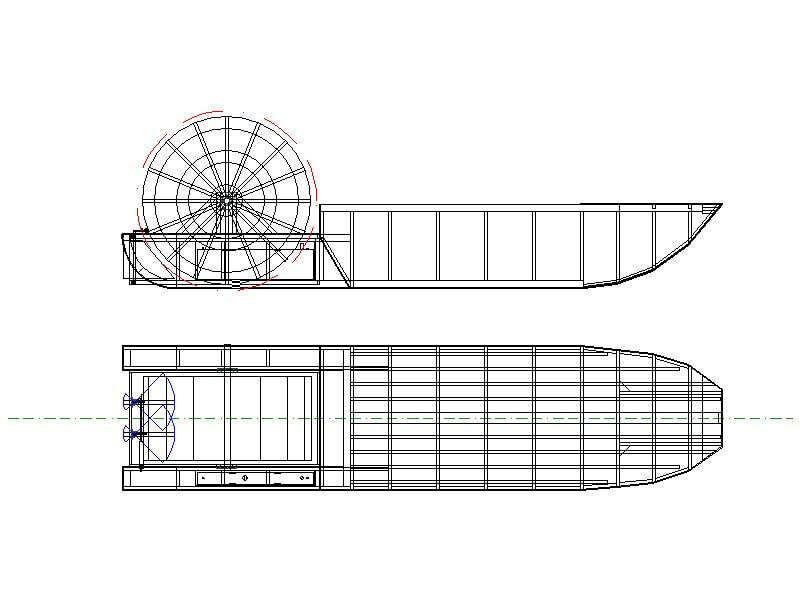 Updated the drawing to show new placements of the rudders. Just got back from a family vacation only to realise I have another trip in one week. Will be putting of boat build till I get back. Vacation allowed me to reread Glen's plywood boat building book, and decided to make frames from 1"x4"s instead of 2"x4"s. Also need to have 6" overlap on gussets. Will just need a little tweeking of the drawings. 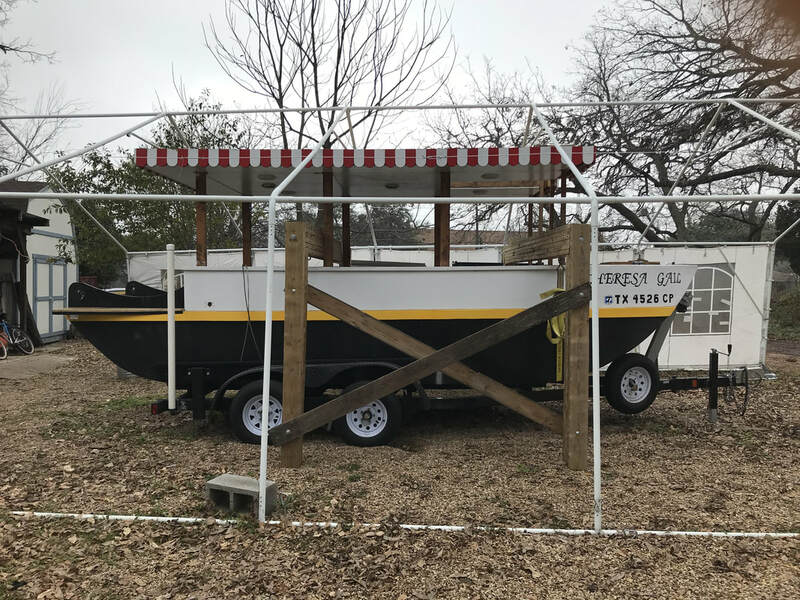 Here is the Last boat! Found a great sight for metal parts.Bought shaft, mouting bearings, flanges for wheel and gears for 40 chain. 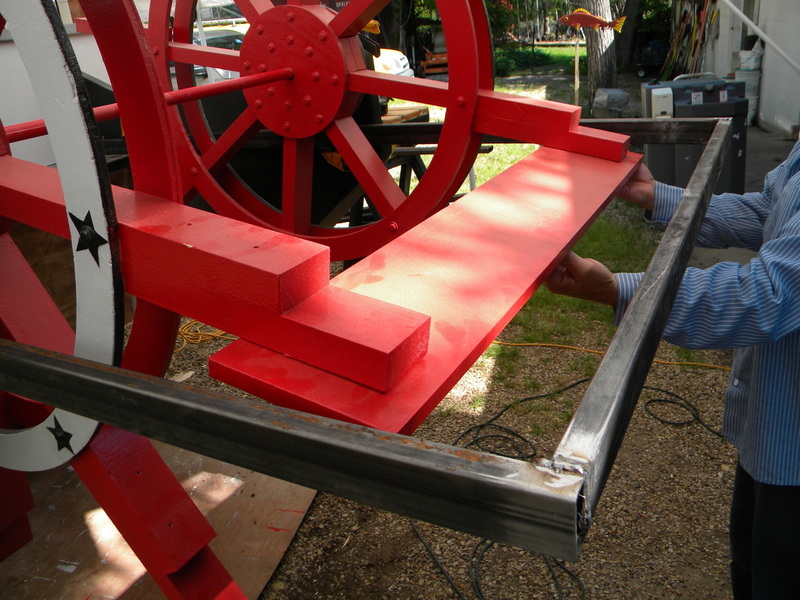 This will make the paddlewheel assembly easier, and will not have to weld spindles to plumbing pipe for shaft.